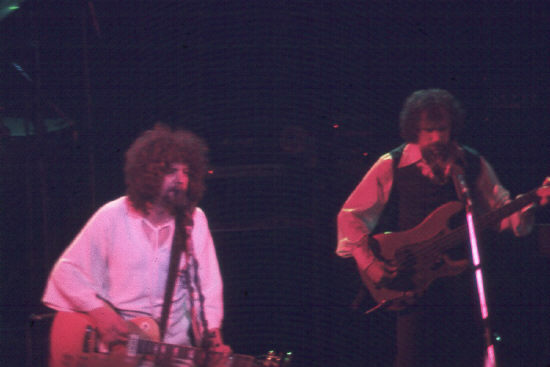 The tour in support of the Face The Music album is arguably ELO's hardest working tour. It was the longest schedule of any of their tours as well as having the longest (and most variable) setlist. 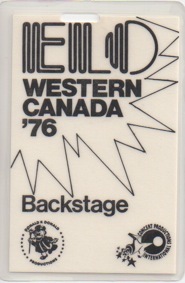 It ran from November 1975 to September 1976, all across Europe and North America. 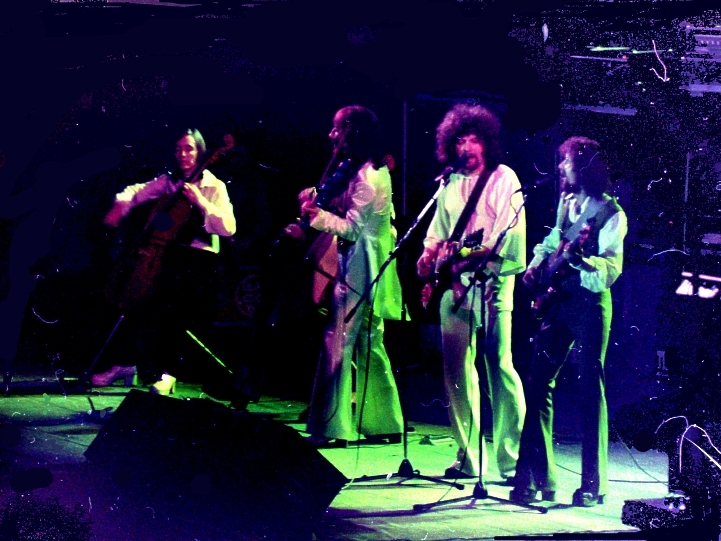 The start of the tour coincided with the worldwide release of the Evil Woman single in late 1975, which was ELO's first worldwide hit reaching the top ten in many countries in which it was released, including both the UK and USA. 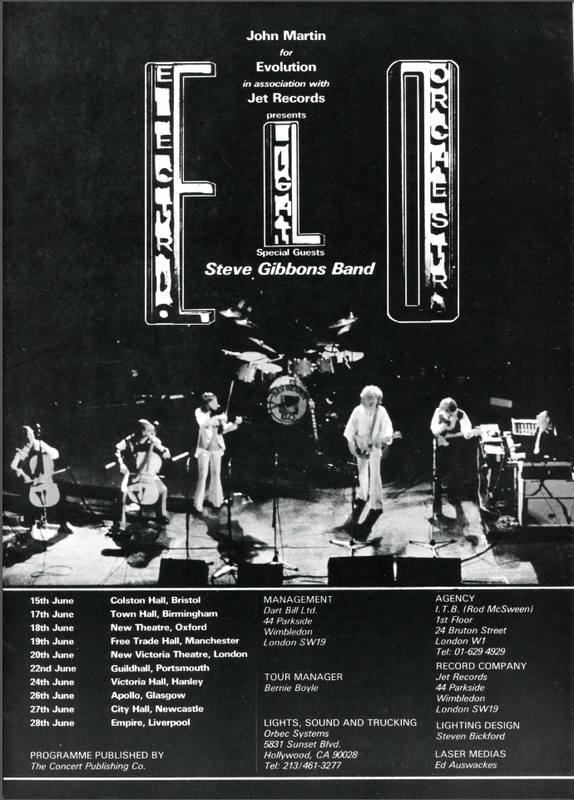 It was this tour that helped move ELO up a level to superstar status and they began regularly being the headline act, rather than the supporting act. 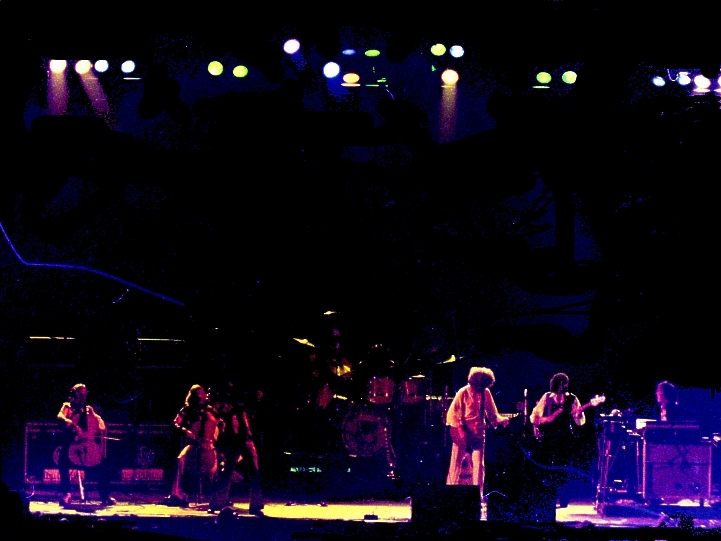 The tour was mostly continuous during the 11 month period but for a December/Christmas break in 1975, the recording of the A New World Record album in July of 1976, and a series of cancelled UK dates in May of 1976. 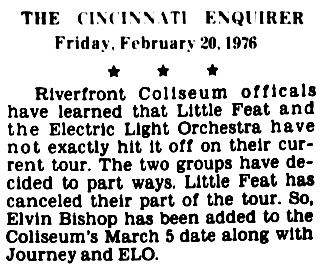 The reason for the cancellations was because the band was simply exhausted from the nearly non-stop touring schedule. 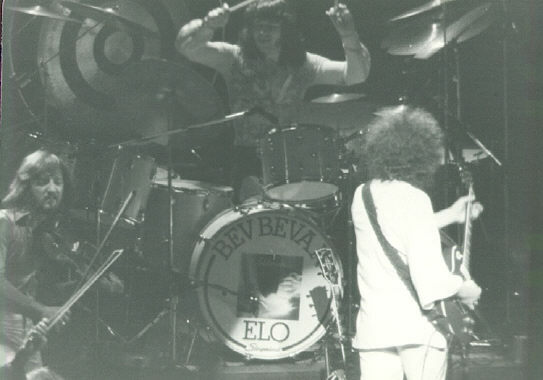 Bev Bevan has described the tour as a "real ballbreaker" and says they played 65 dates in 76 days, flying every day. Added to this, apparently the flu was being passed around and nearly every member of the band was sick at some point during the tour. 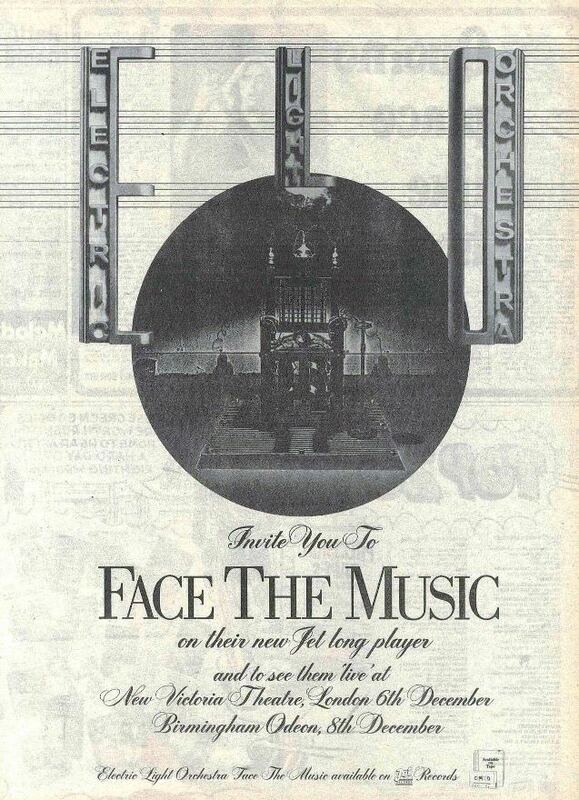 The Face The Music remaster album's liner notes and a Rolling Stone magazine ad mention a North American tour of "68 shows in 76 days" from February 3 to April 18 in 1976. But this might be a bit off given that Bev quotes only 65 dates. 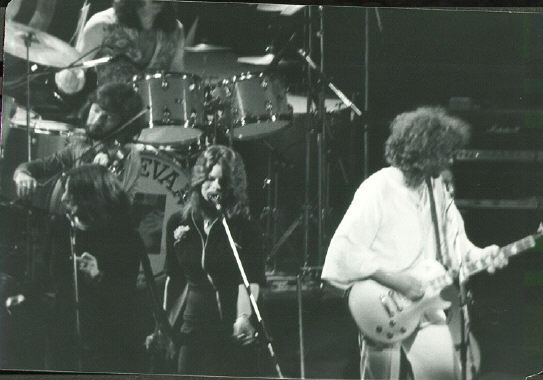 Some shows on this tour also included female backing vocalists during all or part of the USA shows (from January to April, 1975 at least). The female backing vocalists were from a vocal trio called SuMagNa, made up of Susan Collins, Marge Raymond and Nancy O'Neill. These are the same backing vocalists that featured on the recording of the Face The Music album, excluding Ellie Greenwich. They are confirmed by Susan Collins and Marge Raymond to have played at the March 20th, 21st and 23rd dates (New York City and Philadelphia), but they did not do all shows. Susan Collins also relates a story about being at the Philadelphia show and shouting "Hello Cleveland!" to the audience by mistake, which was picked up and used years later in the 1984 film, This Is Spinal Tap. 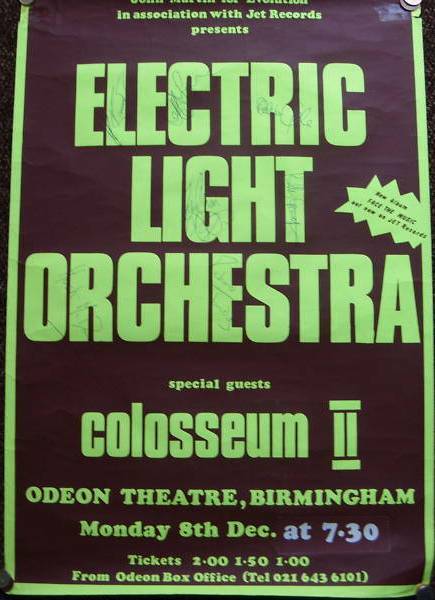 We were then asked to join ELO on a major tour. It was so great. 1st class touring. 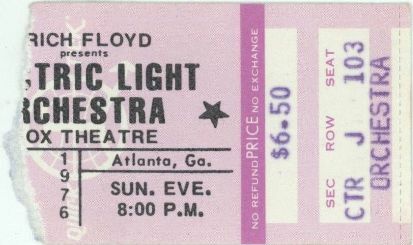 They were one of the first groups to use lasers on stage and other very innovative sound techniques, of which are used today by many groups. 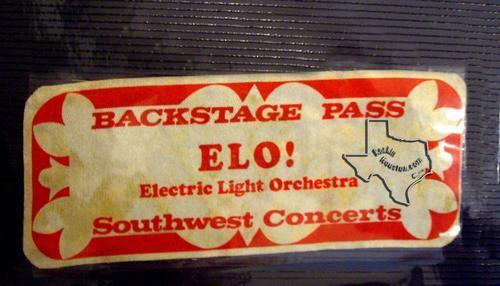 ELO was the first to use them. We had so much fun. All the guys were wonderful and gentlemen. We always would sing backstage before going on. One day we were at the Philly Spectrum (huge arena in Philadelphia, PA) and we were in the dressing room used by the hockey players. There was a huge shower. You could fit about 10 people in it. I said, wow, that shower has a great echo in it and we all went in it and started to sing oldies and all kinds of accapella harmonies. This was very normal for us... Richard always had a keyboard backstage and we were always singing something. 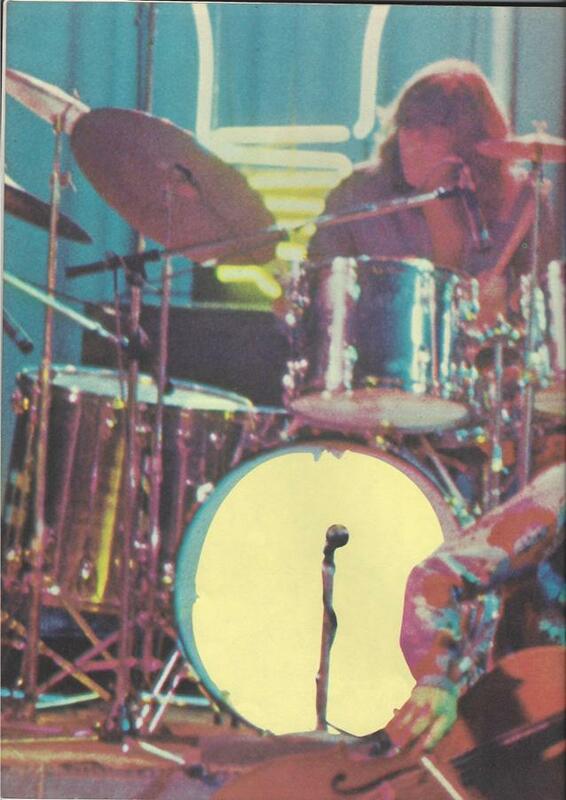 I loved to play the tambourine and Jeff let me use it on stage. (You can see the picture of me standing next to Jeff on stage during the finale). As I was walking off the stage at the Spectrum, the union steward asked me for my union card because I was playing a tambourine and that is considered percussion. So where is my percussionist card? I didn�t have one... Uhoh, we are in trouble. I tell the man I have to go get it in my dressing room and I proceed to run out of the arena and into the limo... I often wonder who got fined for that. I then had to join the American Federation Of Musicians union in order to play the tambourine on stage... The rest of the tour was simply amazing and its one I will never forget. I�ve toured alot, but that tour was so very special. We were treated with the utmost respect. 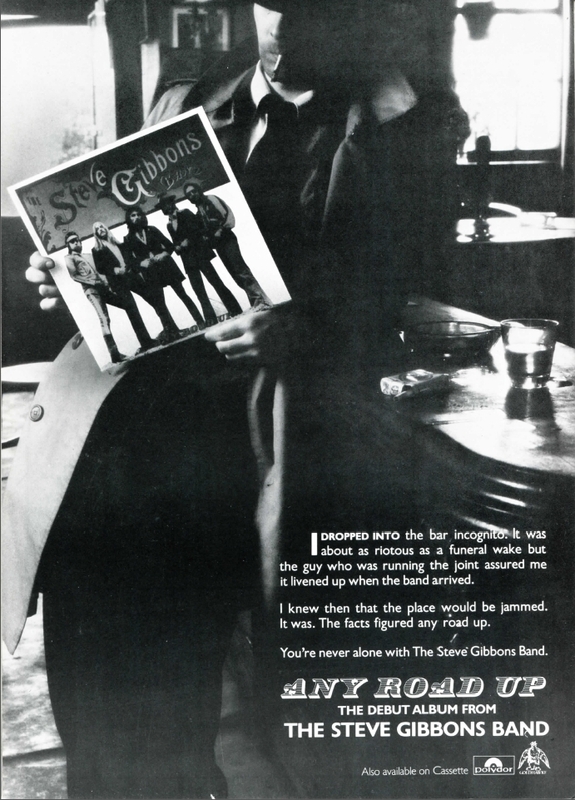 At the time Don Arden was managing the band and he would take us out to dinner at the best restaurants. It was fantastic. I will never forget it as long as I live. 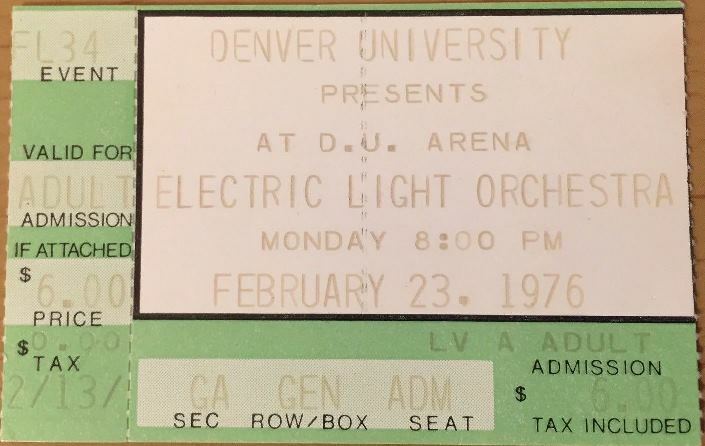 It was always so exciting to take the stage with ELO when those lights went out and the mics were hot right before we played our first song of the night. But between the hectic schedule and ubiquitous extracurricular activities, I tended to get a little confused sometimes about where exactly we were appearing. 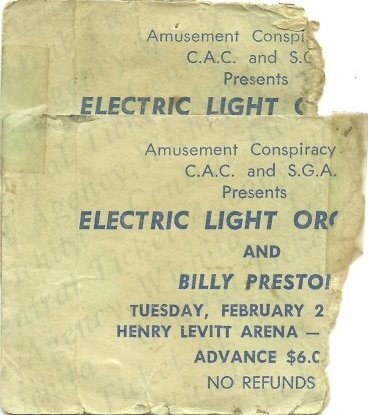 One night at the Spectrum in Philadelphia I could feel the electricity in the air as I walked out onto the darkened stage in the giant arena. In a great swell of enthusiasm, I grabbed the microphone � there in Philadelphia � and yelled into it, �Hello Cleveland!� Well, the teasing eventually died down on the road, but when I got back to my regular job in NYC as a singer and vocal contractor for the TV show Saturday Night Live (with the original Not Ready For Prime Time Players), somehow the story of my on-stage gaffe got around amongst the cast and comedy writers and the ribbing started all over again. I thought it was finally over and forgotten until some years later I went to see a screening of Rob Reiner�s film, This Is Spinal Tap, where my old pal Harry Shearer (who, with co-star Christopher Guest, I knew from SNL and the National Lampoon), in the role of bassist Derek Smalls, gets lost backstage and repeatedly calls out, �Hello Cleveland! 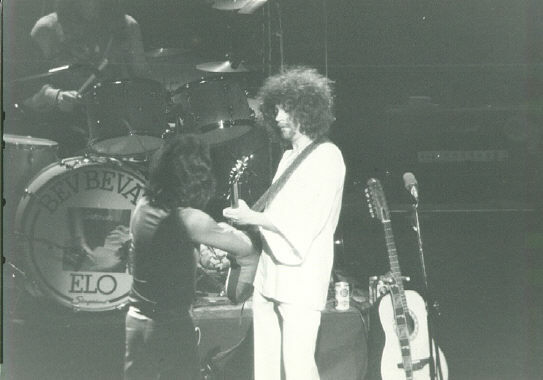 Hello Cleveland!� Now I celebrate the fact that my faux pas has been preserved forever in celluloid and has entered the lexicon of the American idiom � all from my time on the road with ELO! It's difficult to pinpoint a single setlist used on the tour as apparently the band may have changed up the setlist many times. Some performances are known to have used a medley of the Rolling Stones' Let's Spend The Night Together, Tchaikovsky's Piano Concerto No. 1 and The Beatles The End, as well as the On The Third Day tracks (in a different arrangement). 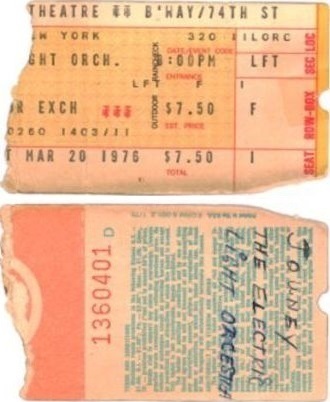 The primary evidence for the tour setlists is based upon released and bootleg material, which may or may not be complete. As such, it's not entirely clear if the variable setlist is a result of the band changing it during the tour or incomplete information from available materials. 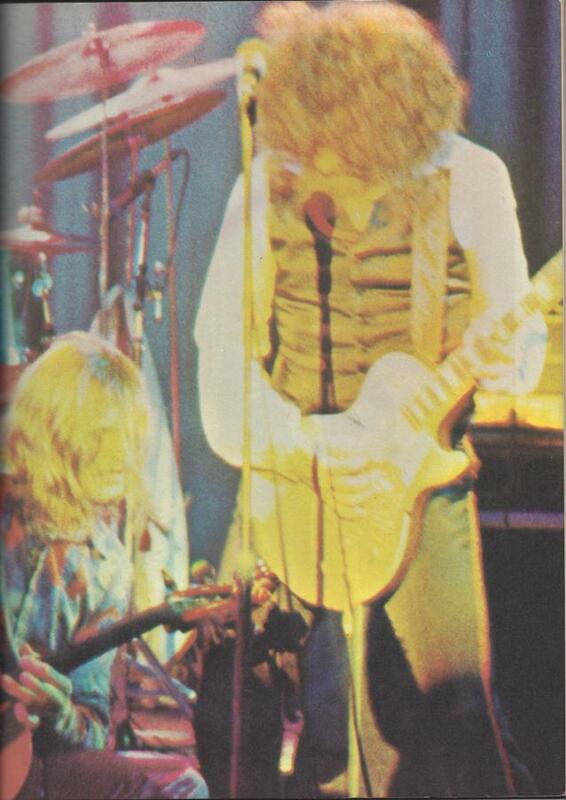 The only performances that undoubtedly offer complete setlist are the March 3, 1976 performance in Detroit, Michigan and the March 19, 1976 performance in Boston, Massachusetts, both of which have slightly different setlists. 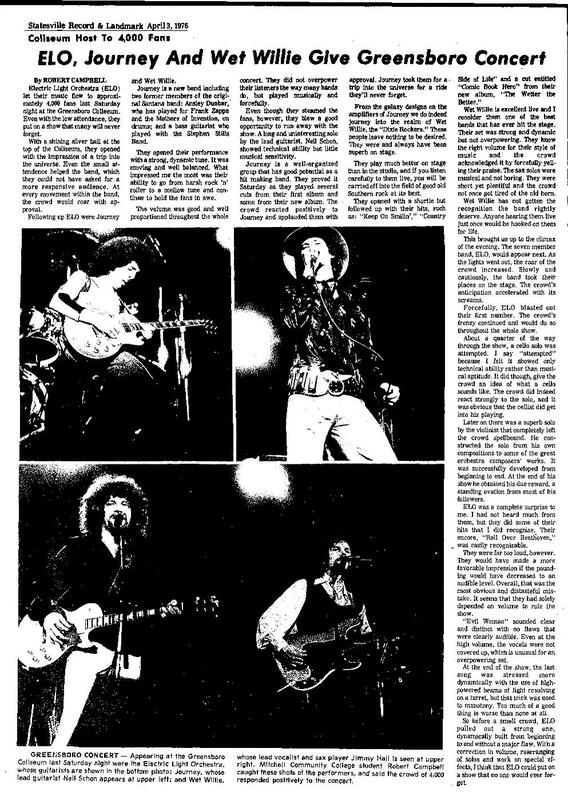 A review from an August 10, 1976 concert in Los Angeles mentioned the band played Kuiama. It's unclear if the song was actually performed or the reviewer was in error, but if it was, it was surely brought back into the set as it was on the Ol� ELO album. 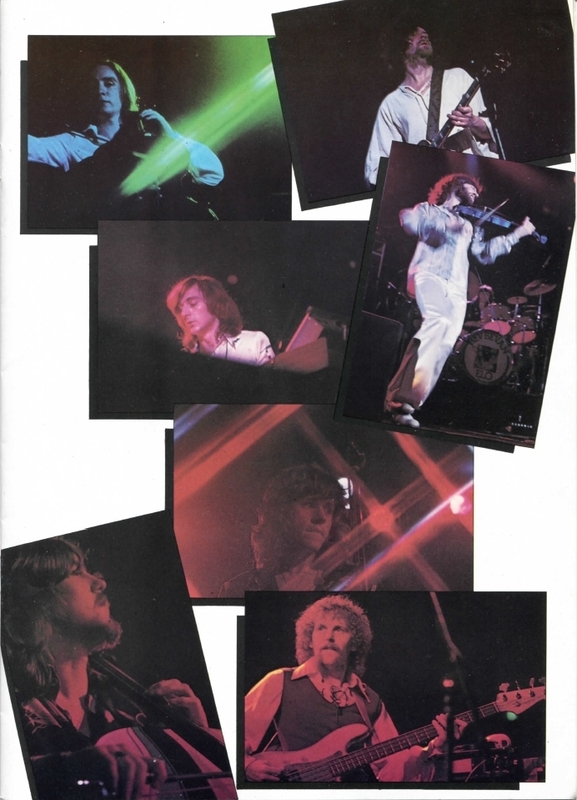 Truth is, it's difficult to classify this as the Face The Music tour per se, as the band was simply touring continuously from as early as the release of the On The Third Day album (winter 1973) to the beginning of the recording for the Out Of The Blue album (summer 1977). Each concert was simply to promote their latest works and would incorporate the songs from the latest release. 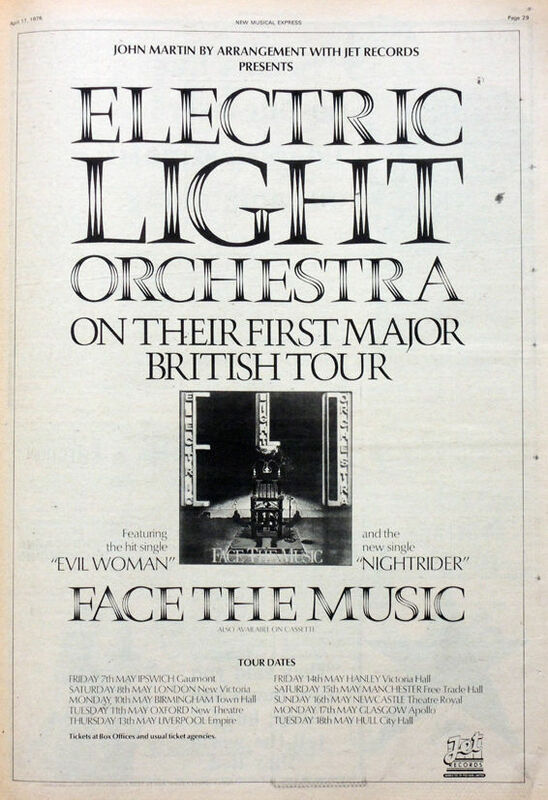 Because Face The Music was released in September 1975, Ol� ELO was released (in the USA only) in June of 1976, and A New World Record was released in October 1976, all concert dates between that period are classified here as part of the Face The Music tour. It should be noted that the 1975 performances bear closer resemblance to the performances from the prior Eldorado tour and the late 1976 performances bear closer resemblance to the upcoming A New World Record tour and the setlist and performances evolved over the course of the tour. 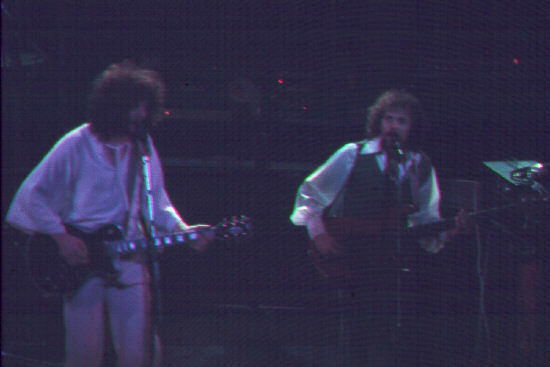 Audio from this tour is one of the most widely available, with official, albeit incomplete, releases of three concerts and bootlegs of three additional concerts. 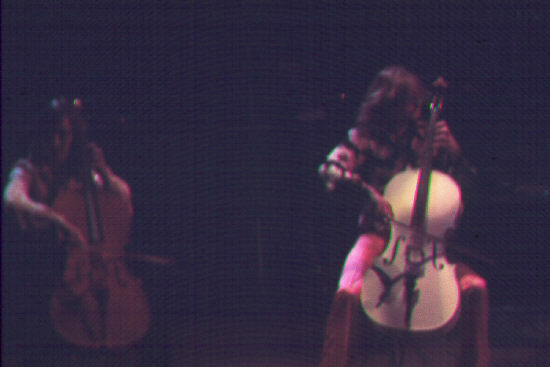 As in previous shows, Mik Kaminski and Hugh McDowell performed solo violin and cello pieces respectively during the show. Mik performed a self-written and unnamed solo piece that sometimes used passages from Edvard Grieg's In The Hall Of The Mountain King as well as heavy echo effects as the solo part progressed. This violin solo part merged with a selection from of Brahms' Hungarian Dance No. 5 and Orange Blossom Special when the drums, bass and keyboards joined in. The self-written first part varied from show to show and it is likely that Mik improvised the performance at each show. Hugh performed his own self-written and unnamed solo piece which similarly merged with Rimsky-Korsakov's Flight Of The Bumblebee where bass and drums joined in, although this was not improvised and was the same self-written song at each performance. 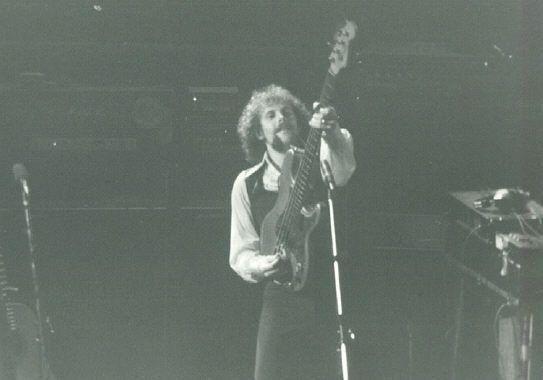 (It should be noted that the solo piece, although the same at each show on the Face The Music tour, was different from the solo piece performed at the prior Eldorado tour.) It is curious that on all of the official releases, these solos were not released except on the Wolfgang's Vault website release of the Winterland show. 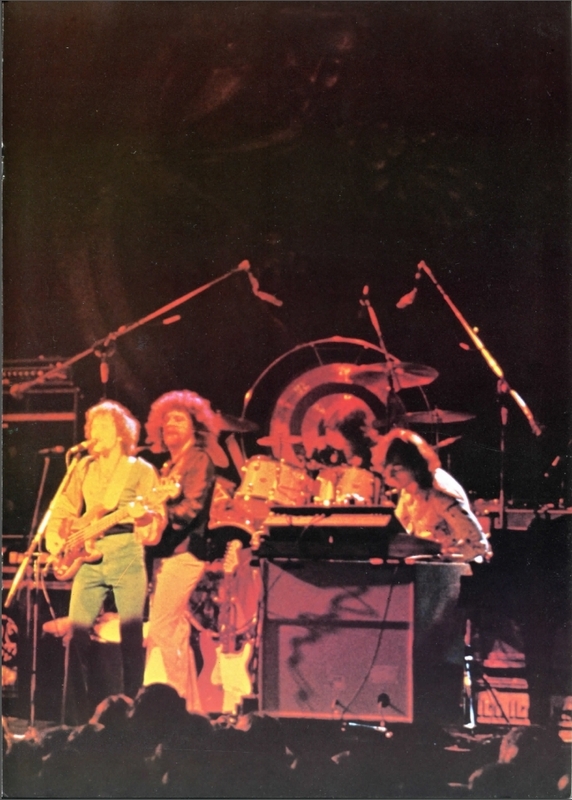 The August and September 1976 legs of the tour in the US saw the band using a sophisticated laser light show, with lasers being bounced off of the band's instruments to dazzle the audience. 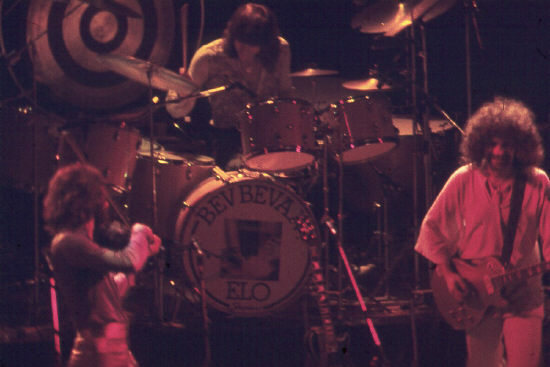 At the end of the shows, a large black balloon with the soon-to-be-used ELO spaceship logo emblazoned on it and carrying a mirrored disco ball was floated up behind the stage and lasers were shot off of it as well. There was an infamous incident at a Universal Amphitheater shows in Los Angeles where the laser show caused many city residents to panic, making over a thousand phone calls to the police department to report a UFO sighting. Apparently the ELO balloon was slowly floated across the city and up behind the stage while lasers reflected off the disco ball and it could be seen from miles away. 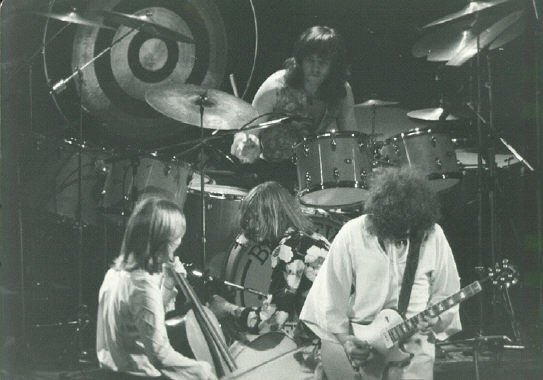 Other crew is uncertain, although probably Jake Commander, Brian Jones and Phil Copestake were involved as engineers or technicians as they were known to be good friends with the band and involved in most of their tours. 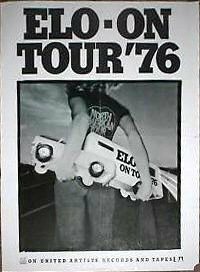 This tour ran from November 1975 to September 1976, with a short break over December 1975 through January 1976, another break in July 1976 and a set of cancelled gigs in May of 1976. These dates are approximate only, based upon limited information. 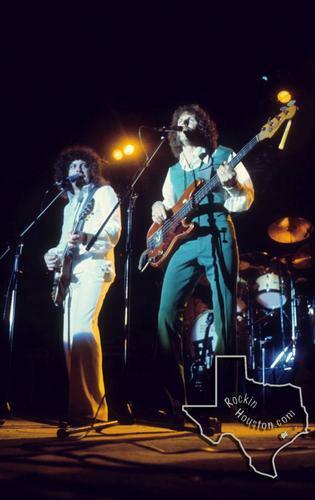 It is known that the band had completed recording of the Face The Music album by June of 1975 and began work on the A New World Record, the follow up album, in July of 1976, so those dates appear generally accurate. 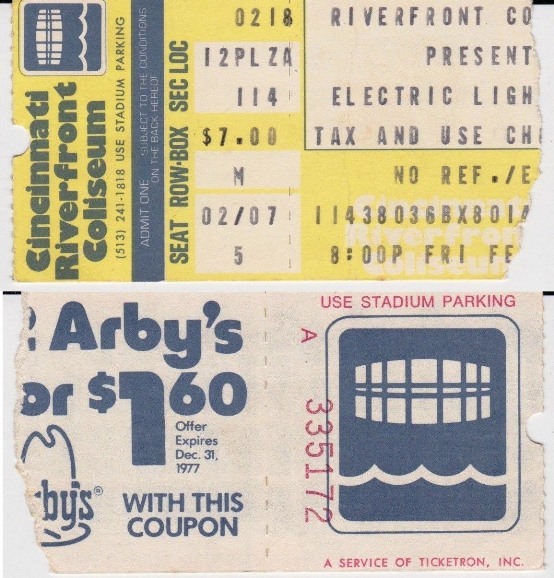 February 8, 1976 Seattle, Washington, USA Seattle Center Arena Little Feat This concert was taped and later known to be broadcast on KISW radio, Seattle's rock station, on the night of August 22, 1976. 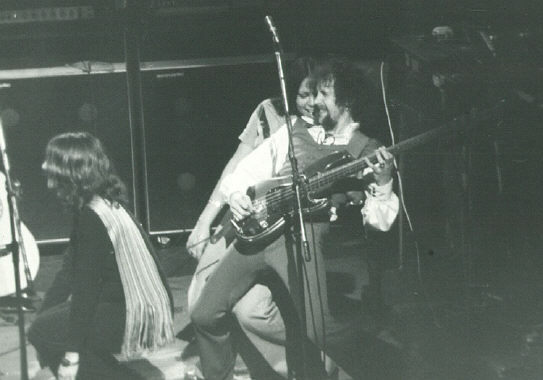 February 14, 1976 San Francisco, California, USA Winterland Ballroom Little Feat, Street Corner Symphony As this performance was on Valentine's Day, following Strange Magic the band temporarily stopped the show to give out roses to the audience. 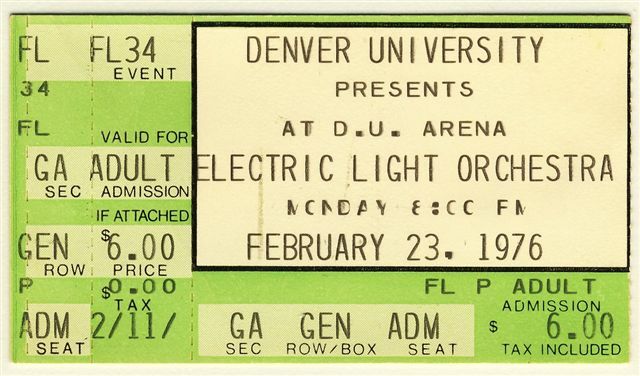 ELO, making a rare appearance in a city that is partial to them, sold out Winterland Feb. 14 and came close to doing it the previous night. The satisfied fans got an excellent show from this band that's been one of the few to consistently meld classical instruments into a rock format. Though they are as rhythmically strong and deliciously loud as other bands, its music tends a little more to be a music of ideas-even if the ideas themselves, such as those employed in the opera Eldorado, are gloriously hokey. 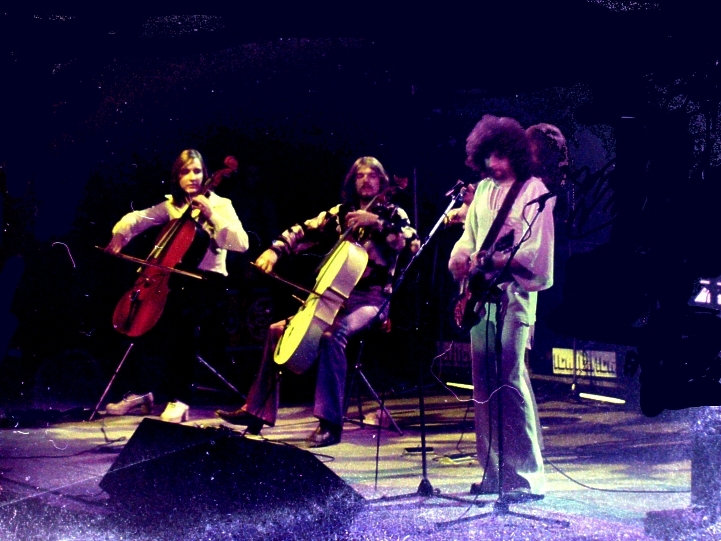 The tension provided by the classical strings was best displayed in the cello solo on Flight Of The Bumblebee and in pieces like 10538 Overture, from the first ELO album. Its more sensuously pop side showed up in new songs like the light Strange Magic or the latest hit, Evil Woman. 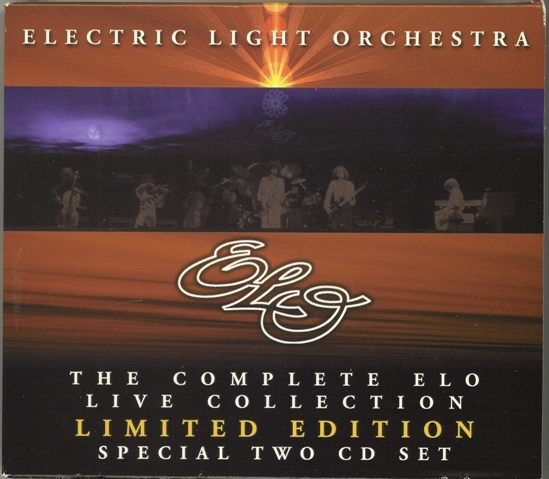 Some of the most typically pure ELO moments came during its renditions of pieces from Eldorado, the album which produced the beautifully melodic hit, Can't Get It Out Of My Head. 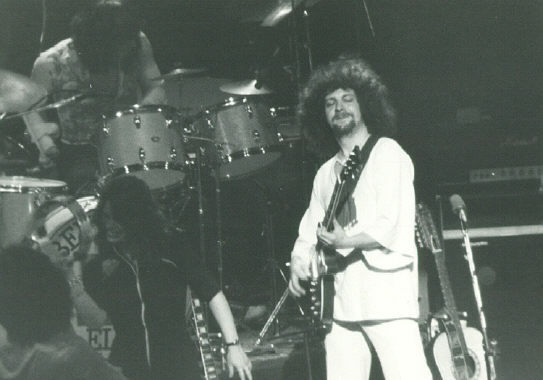 Here and in some other longer passages the band fused the strings, the lead guitar, the synthesizer and the sharp drumming of Bev Bevan to produce thrilling statements that one could conceive coming from the hand of Richard Wagner if he were alive and practicing rock. 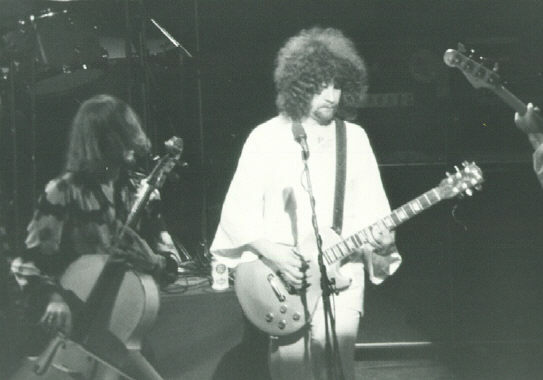 The troupe also paid homage to the Move (the band from which came Bevan and ELO leader Jeff Lynne), a group that was never justly recognized in the States, by serving up tasty versions of Do Ya? [sic] and the climax, Ma Ma Ma Belle. The band played in front of a backdrop of leering faces thrown into relief by various special lighting effects." 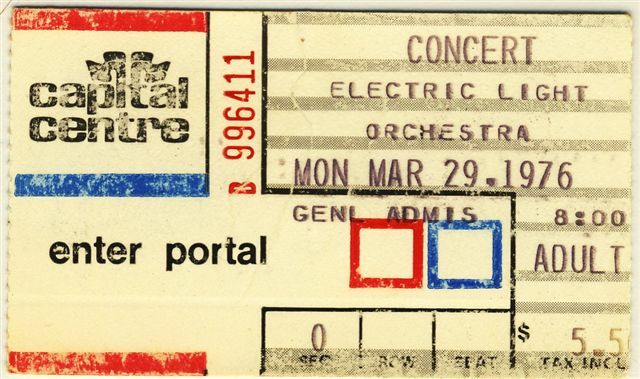 March 3, 1976 Buffalo, New York, USA (CANCELLED) New Century Theatre N/A This show was cancelled and postponed until March 7, 1976 for unknown reasons. 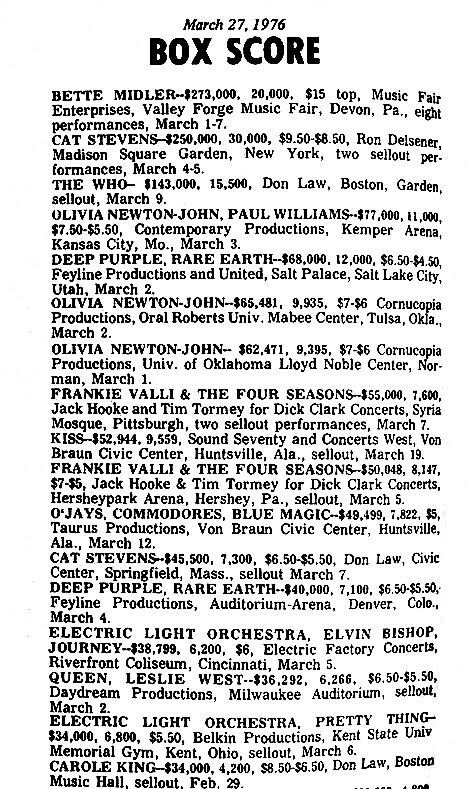 Box office report Attendence for this show was 6200, earning $38,799. 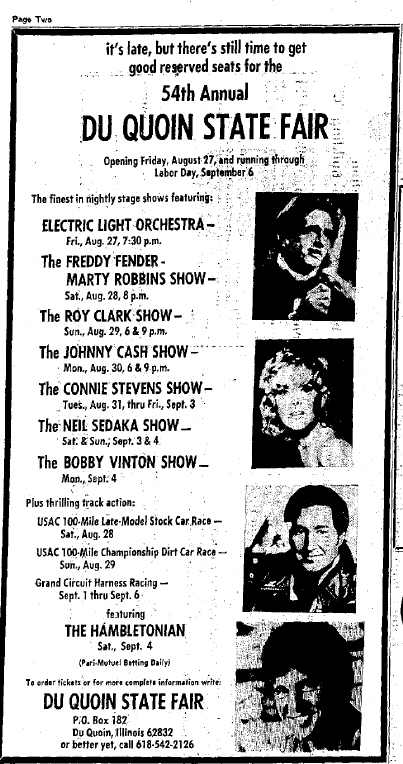 Box office report Attendence for this show was 6800, earning $34,000. 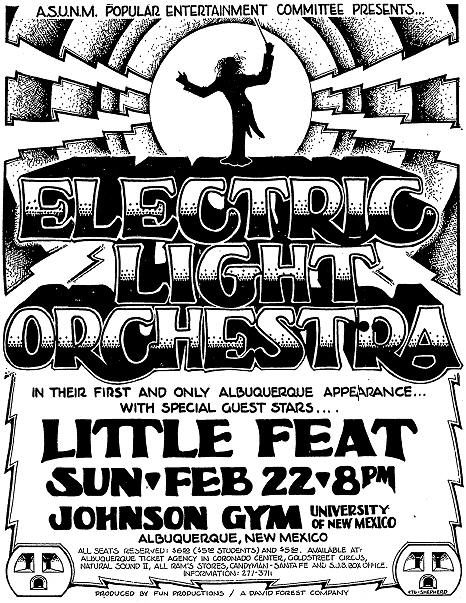 Little Feat was originally scheduled to open this show, but they cancelled after a disagreement with ELO. 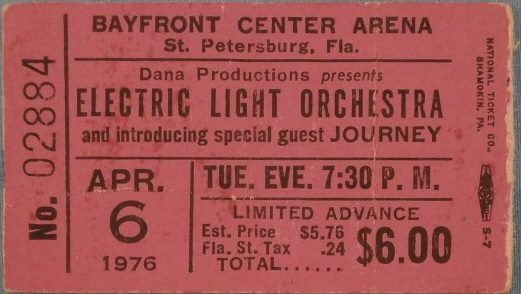 March 7, 1976 Buffalo, New York, USA New Century Theatre Journey This show was rescheduled from the March 3, 1976 for unknown reasons. 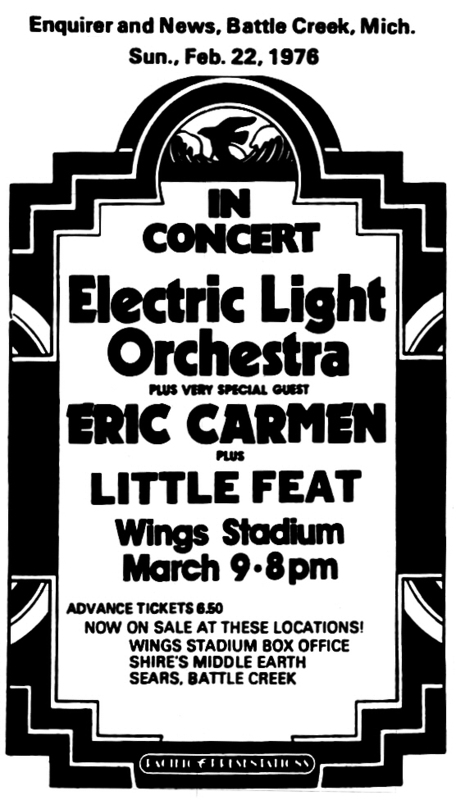 March 9, 1976 Kalamazoo, Michigan, USA Wings Stadium Eric Carmen, Pretty Things Little Feat was originally scheduled to open this show, but for unknown reasons they cancelled. 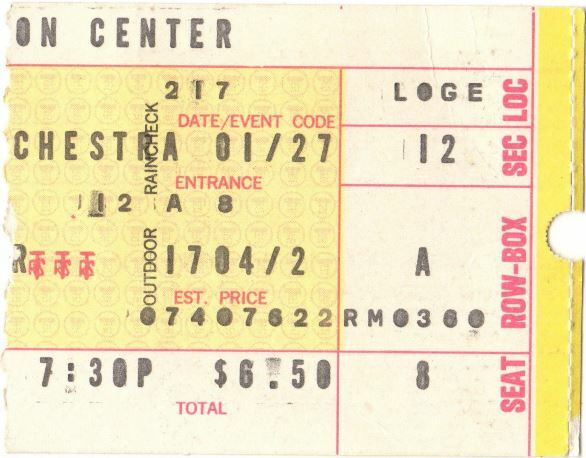 March 20, 1976 New York, New York, USA Beacon Theater Journey This show confirmed to feature SuMagNa on backing vocals. 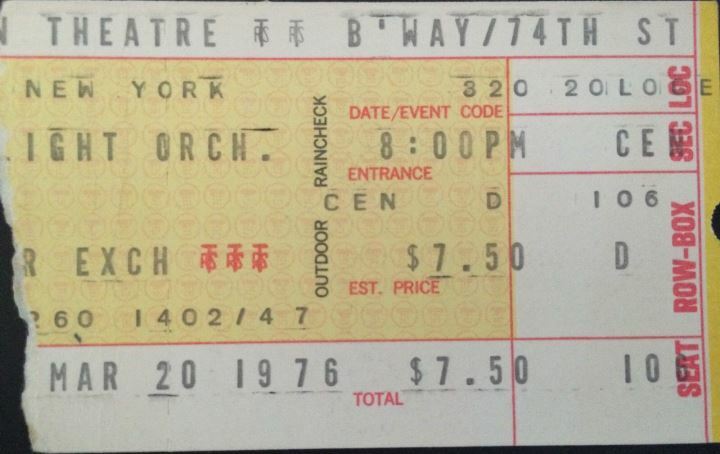 March 21, 1976 New York, New York, USA Beacon Theater Journey This show confirmed to feature SuMagNa on backing vocals. 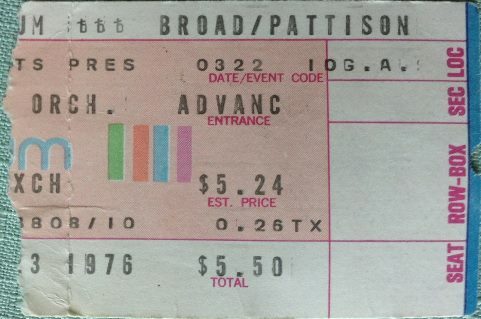 March 23, 1976 Philadelphia, Pennsylvania, USA The Spectrum Journey, Wishbone Ash This show confirmed to feature SuMagNa on backing vocals. 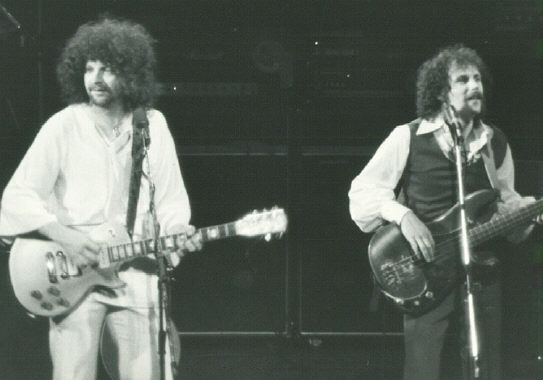 "The Spectrum in Philadephia is where ELO play to 20,000 people-- their biggest gig ever, other than festivals. The Spectrum is the home of an ice-hockey team called the Philadelphia Flyers. From the outside, it has the look of a giant concrete pillbox from The War Of The Worlds. The inside is straight out of Rollerball, particularly the colour scheme, with is blood red. Blood red covers are spread over the ice, and rows of blood red seats climb up from it, perhaps 100 feet to the ceiling. The band arrive some six hours to spare for a brief sound check. Then down to the serious business of the afternoon, football. 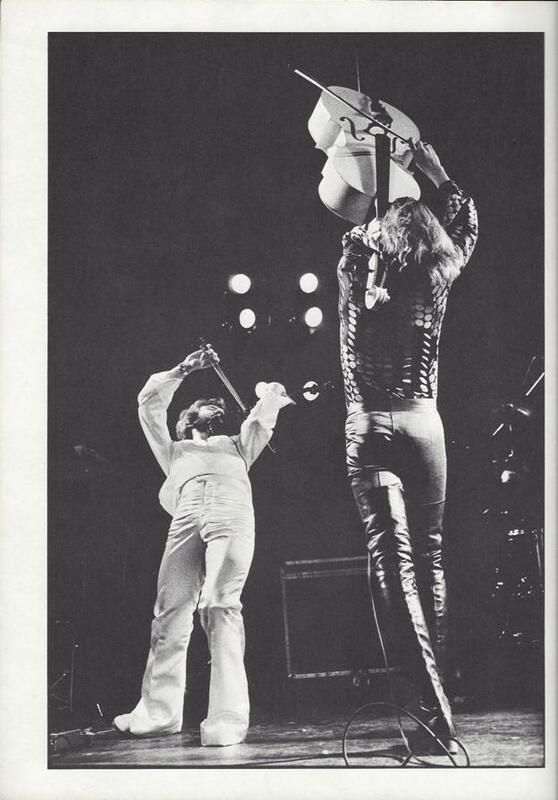 Jeff Lynne traps a long shot from head roadie Mr. John 'Upsie" Downing, flips the ball into the air, heads it, bounces it on both knees, and flips it back on his head, before hammering it in a wide arc to the ELO drummer Bev Bevan. An impressive display this. [...] Soccer over, the band retire to their dressing room in the bowels of the arena, for a Chinese meal doubtless from the bowels of a Philly take-away. Many of the noodles are still there, a few hours later, transforming themselves into Andy Warhol artwork, when the band return from a trip downtown, which was intended to relax them. By this time, too, the room has the look of back-alley. Nerves begin to fray. 'There are,' says Jeff Lynne, "too many people in the dressing room.' This could not have been more true had it been in Bangla Desh. The omens suddenly seem shaky. In the arena itself, the main support act Wishbone Ash are going down like strippers at a rugby club, or even better. No doubt annoyed at their reduced standing, the Ash complain to the kids about the shortness of their set. A section of the crowd boos, presumably to express sympathy. 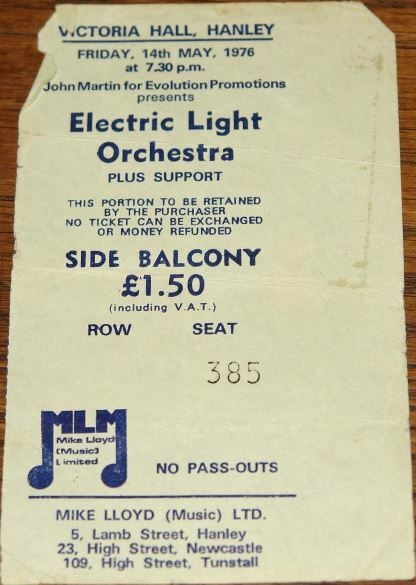 By the time ELO came on, the kids will have been there for four hours. Can the band, themselves a litte weary, live up to their headline status with a tired audience? No sweat. ELO walk on to an ovation that a multiple of the one Ash walked off to. When 20,000 people applaud with feeling, distant seismographs tremble. Nothing ELO have done in Britain can quite prepare you for the impact they have upon American punters. There's no way you'd know this was once a wobbly studio-bound novelty act, on the experimental Harvest label. The show starts with the tape montage from Fire On High, the overture from Face The Music, with the sound rolling around the arena like indoor thunder. And just so you know this is a cosmic occasion, there is the laser, which literally shoots energy into the audience. A single, fat beam of green light hits a revolving mirrorball, and rays streak down onto the multitude, like a phaser attack from a Star Trek army. The Orchestra's musical attack when the lights come up is no less stunning. Strings and keyboards mesh together with some majesty, but do it with a force that makes the hall of the mountain king look like a Mecca ballroom. Centre stage, Mr. Mik Kaminski adopts a virtuoso's stance, dressed in whitetails, his violin tucked firmly under his Great Composer's beard. The bow moves in deceptively graceful arcs, producing a fierce, but melodic music. To the left, cellists Hugh McDowell and Melvyn Gale get down to those growling barrel-chested sounds, heads bowed, fingers gripping like talons in the spotlights. There's something a little perverse about rock cellists, like frenzied academics. To the right, Richard Tandy peers over his keyboard barricades, a fledgling observing the world from a nest. Tandy bolsters the orchestral sound, as well as laying some spectacular electronic effects on the crowd. As for the rockers, they're underpinning the dazzle with ah rhythm as solid as King Kong dancing at a disco. 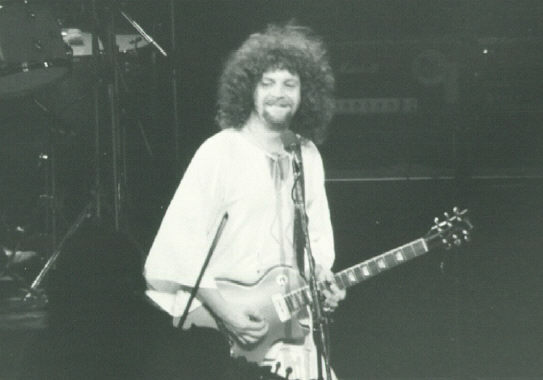 Jeff Lynne, complete with mossy Afro and white guru pyjamas, stands a reticent step back from the front line, playing lead and rhythm guitar as hard and as sharp as the best around. 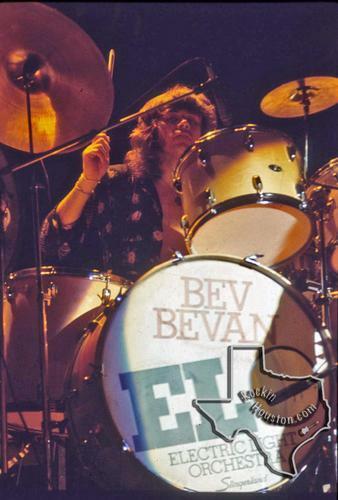 Bev Bevan, almost hidden from view by cymbals favours 'heavy, meaty drums, nothing flowery,' and that's exactly the pulse he transmits to the audience, ably abetted by bassist Kelly Groucutt, a man dressed in lincoin green, like an dextra from Robin and Marion, who weilds his guitar like a quarter-staff. 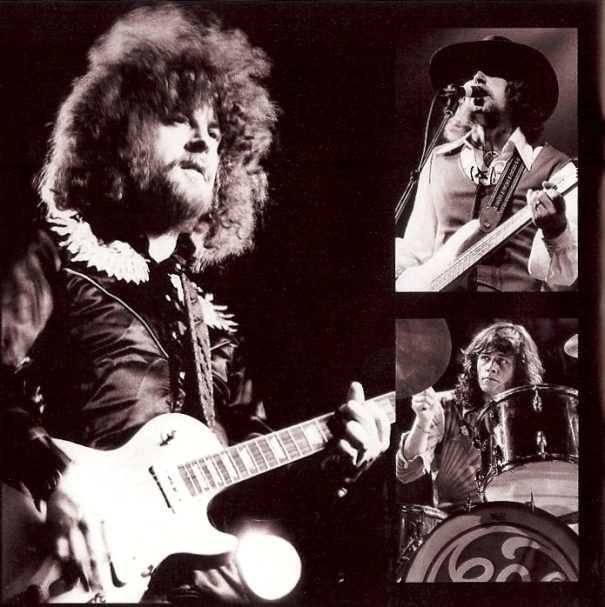 But ELO are decidedly not into techno-flash gang-bangs of the classics. Two terse instrumentals, and a solo each from violin and cello, are the strict ration. 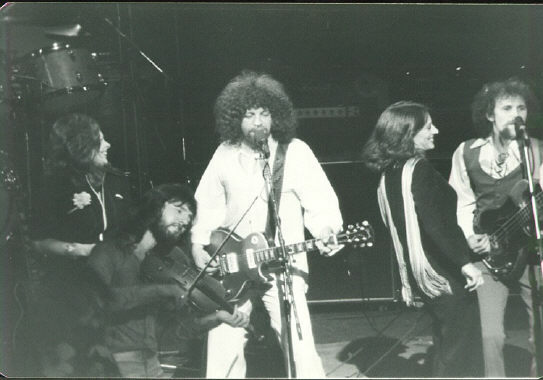 The band is about songs, to be precise Jeff Lynne's songs, and Jeff is a firm believer in keeping it tight and melodic. The result is an act jam-packed with melodies: all the singles, and ruthlessly edited extras from the five albums. The applause level is cranked up higher with each song the kids know, with seems to be all of them. 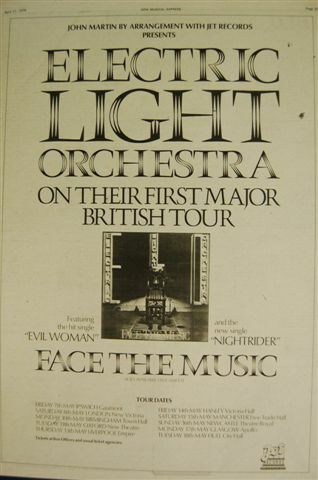 [...] Onstage the Orchestra punch their way through four or five cuts from Face The Music, including the two latest American singles, the new UK single Nightrider, and the song that's used as the opening vocal, Poker. [...] On The Third Day is among the best received bits, with four cuts from the album of the same name turned into a medley. 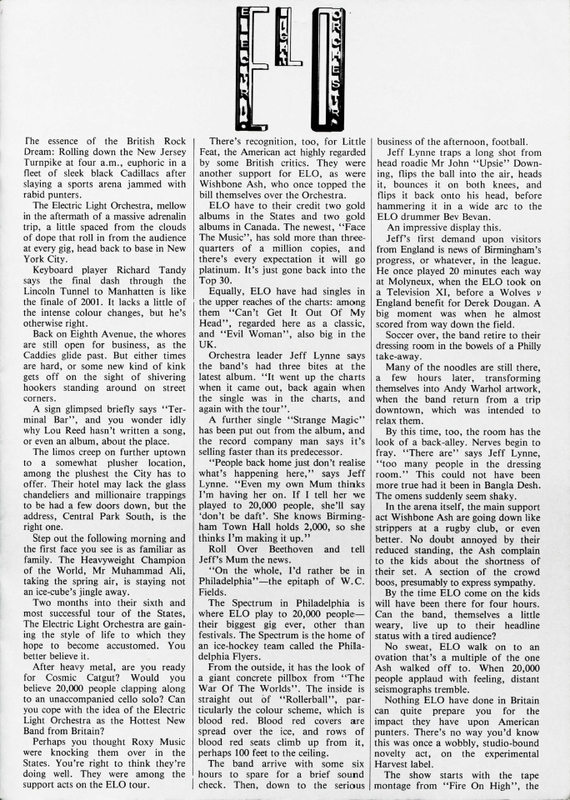 [...] By the time ELO blast out the chords of Ma-Ma-Ma Belle, the closing song, the Philly audience is showing its appreciation loud enough to challenge the 8,000 watts of PA. The applause demanding encores builds in a way they can never contrive at party political conferences. Can you imagine Let's Spend The Night Together with strings, linked by the melody from Grieg Piano Concerto In A Minor to The End from Abbey Road? That's the first encore. The second is, you guessed, Roll Over Beethoven. Distance seismographs collapse under the strain. Back in the dressing room, Richard Tandy and Kelly Groucutt agree that the gig is the best the band's ever done." March 24, 1976 Allentown, Pennsylvania, USA Muhlenberg College Journey "The road goes on forever. 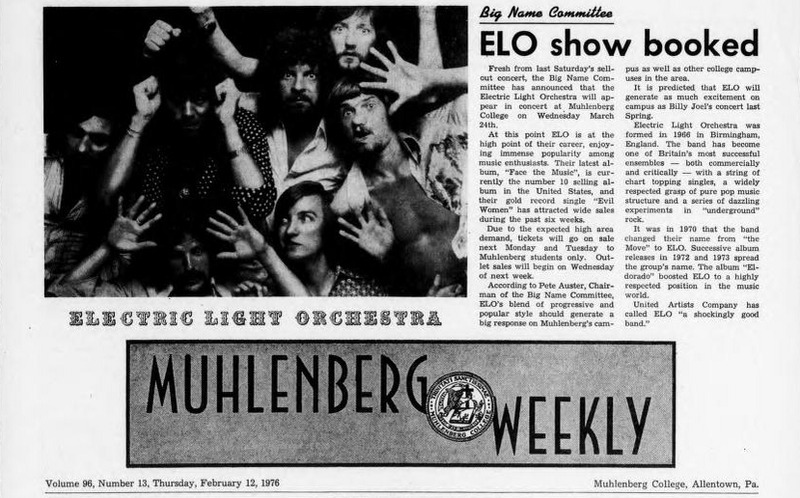 The night after their biggest ever gig [at Philadelphia's Spectrum], ELO play a more modest venue, namely Muhlenberg College, Allentown, Pennsylvania. As he leaves the New York hotel, Jeff Lynne says: 'A smaller show tonight-- 35 people. But it is a sell-out.'" 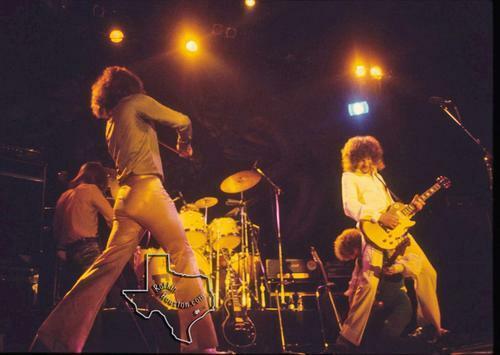 April 18, 1976 San Antonio, Texas, USA Convention Center Arena Journey This was the last show on this leg of the tour. The band was, as described by a fan in attendence, "in a partying mood wearing, at the end, tin foil hats and were having crazy fun on stage." July, 1976 Munich, Germany Musicland Studios N/A Note that some mixing of the album may have continued into August as well. It is known that some final mixing was also done in October in Los Angeles. 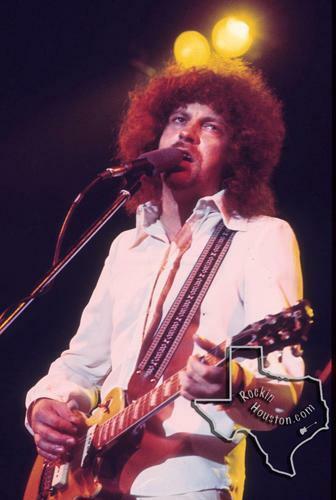 August 10, 1976 Los Angeles, California, USA Universal Amphitheater Widowmaker "Supplementing its classically-tinged rock with dazzling laser effects, the Electric Light Orchestra presented a tight, well-paced show Aug. 10. 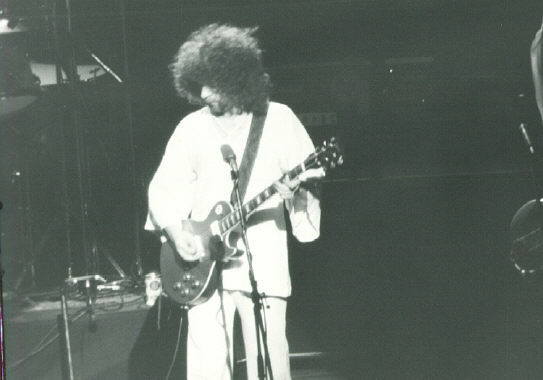 Group leader/guitarist Jeff Lynne, dressed in an all-white suit, handled lead vocals on every song. 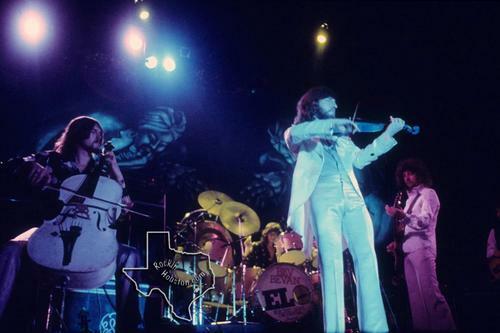 His nasal, whining voice, far from perfect technically, was nevertheless effective throughout and seemed as important as the three-piece string section in defining the ELO sound. Further, Lynnes' melodies were imaginative and moving, particularly in the slower songs such as Kuiama and Can't Get It Out Of My Head. 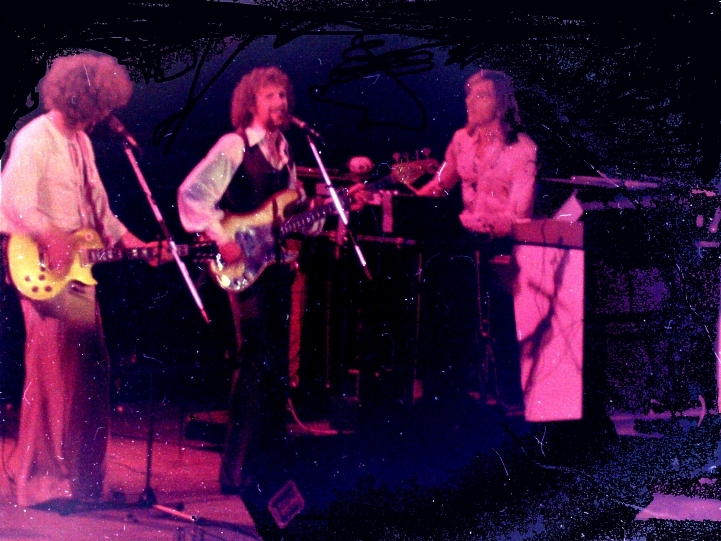 The group performed many of the cuts from its Ole ELO greatest hits collection on United Artists including Evil Woman, Strange Magic and the current single Showdown. 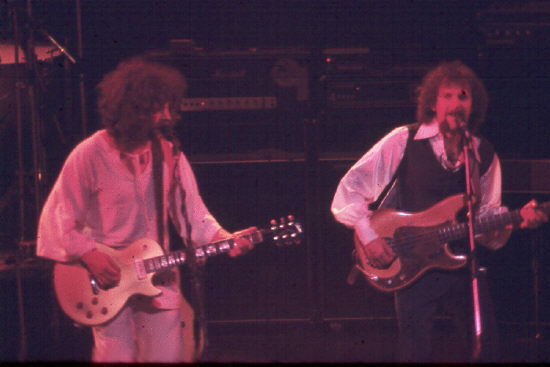 Various lesser -known songs from the group's five previous LPs were also presented during the 15-song set. 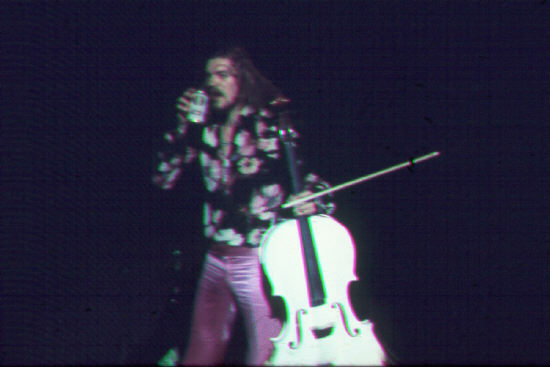 After the fourth number, the band turned the stage over to cellist Hugh McDowell who performed an amazing solo which incorporated a variety of musical styles and electronic gimmicks. Adding a visual component to the solo was an emerald green laser beam which danced off McDowell's sequined suit and projected patterns onto the stage backdrop. 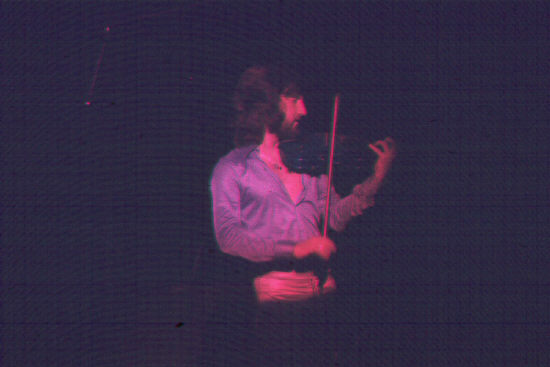 Violinist Mick Kaminsky [sic] also performed a laser-enhanced solo several songs later which was well-received. The group encored, as expected, with its frenetic version of Roll Over Beethoven. Adding to the impact of the song was a 30-foot-high hot air balloon which caught everyone by surprise when it rose from behind the stage. A laser, aimed at the mirrors that dangled from the bottom of the balloon, showered the audience with scores of reflected beams which turned the raucous closing number into a celebration." 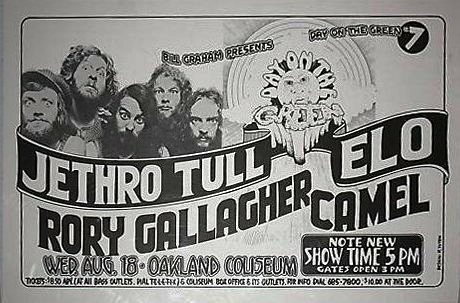 August 16, 1976 San Diego, California, USA (CANCELLED) Balboa Stadium Jethro Tull, Robin Trower, Rory Gallagher, Starcastle Only ELO cancelled this gig. The other performers did the show without them. 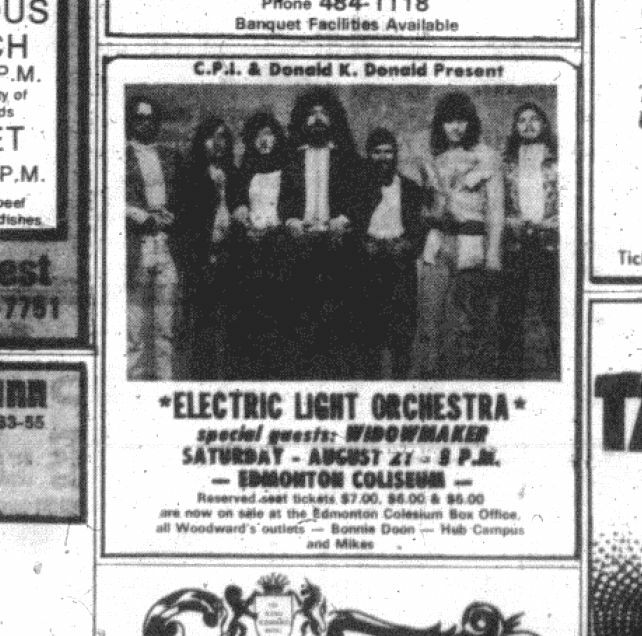 August 22, 1976 Calgary, Alberta, Canada Unknown Unknown This show may not have actually happened, whether it was cancelled or never scheduled at all. 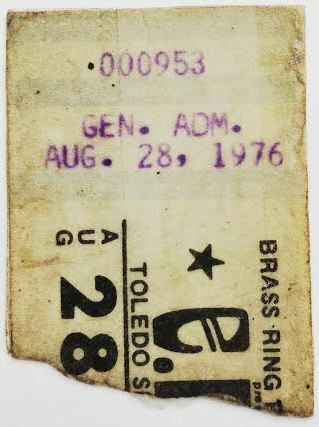 August 27, 1976 Du Quoin, Illinois, USA Du Quoin State Fairgrounds There was no support act at this show. 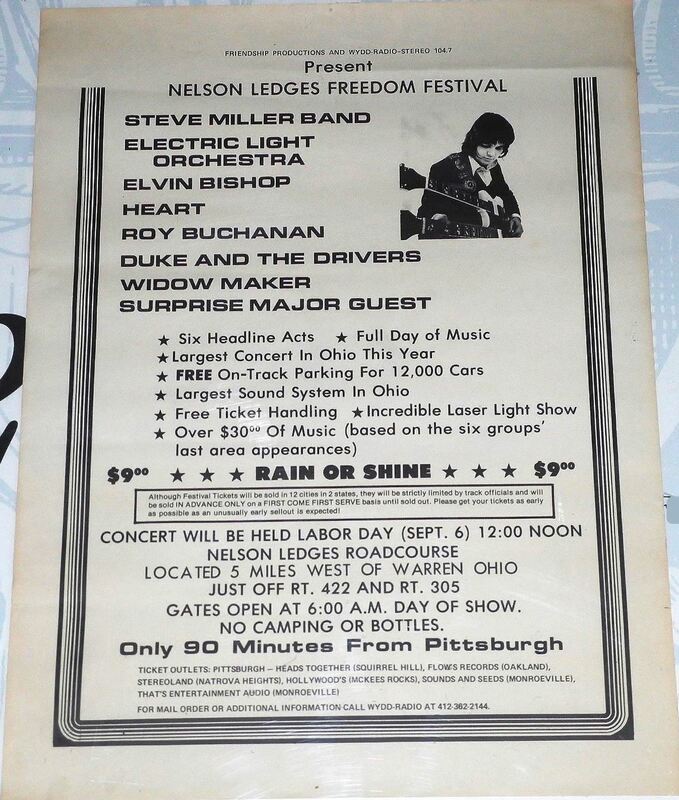 September 6, 1976 Youngstown, Ohio, USA Nelson Ledges Road Course Roy Buchanan, Elvin Bishop, Widowmaker, Steve Miller Band, Electric Light Orchestra & Heart [in order of appearance] This concert was billed as the "Freedom Festival" and featured many bands playing at an outdoor event. Heart closed the festival after being flown in from out of state and started their show at 2AM, well after ELO had left the stage. Based upon released and bootlegged material, the setlist shown below is the most consistent setlist, although variations did occur. 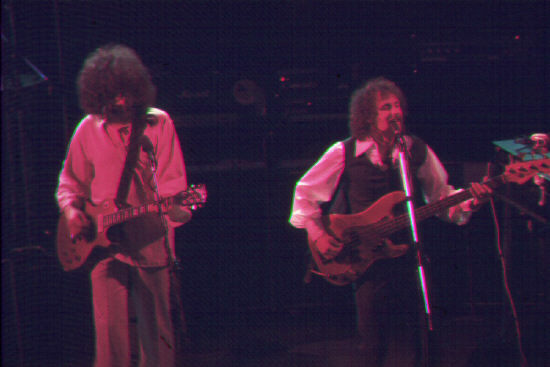 The early part of the tour in Australia, New Zealand and the UK used a slightly different song order, swapping the placement of Showdown for the placement of Poker and Nightrider; this early part of the tour also excluded Strange Magic completely from the setlist, presumably because it was not yet a single; and a live performance of Beethoven's Moonlight Sonata (First Movement) rather than the familiar taped Fifth Symphony was used to intro Roll Over Beethoven. Thus the setlist for the early part of the tour is somewhat reminiscent of the Eldorado tour. 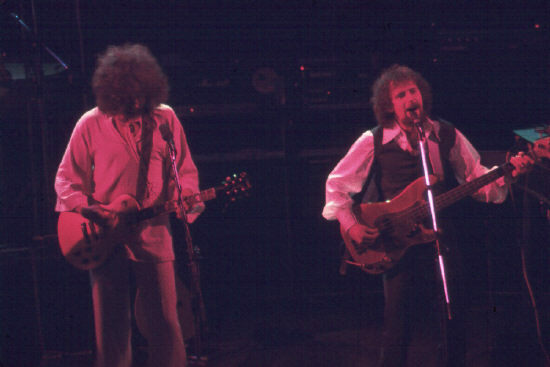 Beginning with the June 1976 European part of the tour, the arrangement for Showdown changed slightly with a long piano part replacing the guitar solo; the arrangement for Ma-Ma-Ma Belle also changed slightly, with a long drum intro used to get the audience excited and clapping along. There are three bootlegged performances from the USA leg of the tour and if one is to assume they are complete, then it appears that the suite of On The Third Day songs were not performed at all shows. Of the three USA show bootlegs, only the Detroit performance includes the rare Let's Spend The Night Together/Piano Concerto No. 1/The End medley. Fire On High This is the Face The Music album arrangement, but all the acoustic guitar parts are replaced with a heavy electric guitar. Also the intro is played from tape and is not performed live. Poker This is the Face The Music album arrangement, but Jeff sings all the lead vocals rather than trading lines with Kelly Groucutt. Also the ending is extended slightly, giving the song a bigger finish. Nightrider This is the Face The Music album arrangement, but with a different keyboard on the intro. Hugh's Cello Solo N/A The performance starts with a long cello solo by Hugh alone, but near the end it morphs into Flight Of The Bumblebee with Bev, Kelly and Jeff joining in on drums, bass and guitar respectively. 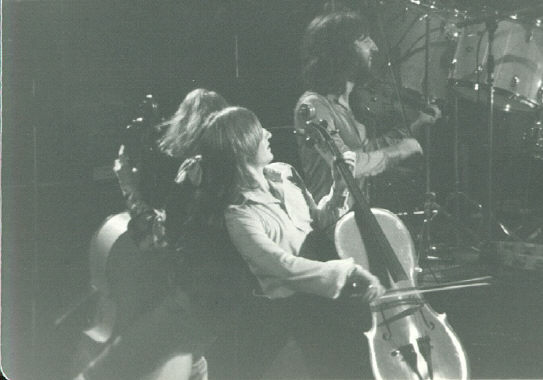 Unlike Mik's violin solo, the cello solo was not improvised and was the same melody at each performance. Showdown This is the standard single arrangement except everything after the "Y'know I need you child" is cut and replaced with a guitar outro. 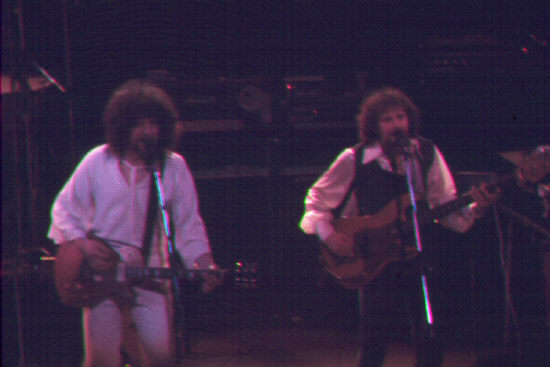 Starting with the late European part of the tour, about half of the guitar solo was replaced with a piano part. Eldorado Overture Eldorado album version This is a taped intro from the Eldorado album, with the band joining in shortly after the spoken part. Can't Get It Out Of My Head This is the Eldorado album arrangement except the keyboard is different on the bridge. Poor Boy (The Greenwood) This is the Eldorado album arrangement except there is an additional string riff at the song's start. Additionally Kelly Groucutt sings lead on all choruses and the first two lines of the first two verses. Illusions In G Major This is the Eldorado album arrangement except it has a slightly different and harder guitar on the intro and end. Kelly Groucutt sings lead on the second verse and adds harmony vocals throughout. Additionally, the song is played slightly faster than the album version. Eldorado This is the basic Eldorado album arrangement but it cuts the third verse ("Say goodbye, the city's heroes sing...") and the second chorus. Also, Kelly Groucutt sings lead on the choruses. Eldorado Finale Eldorado arrangement, but cuts the vocal line at song's end. Mik's Violin Solo N/A This is an unnamed solo piece written by Mik that sometimes used passages from Edvard Grieg's In The Hall Of The Mountain King as well as heavy echo effects as the solo part progressed. This must have been improvised as the melody varied from show to show. This violin solo part merged with a selection from of Brahms' Hungarian Dance No. 5 and Orange Blossom Special with the drums, bass and keyboards joining in. Strange Magic This is sort of the Face The Music album arrangement, using the same basic intro/verse/chorus arrangement, but the backing is very different. 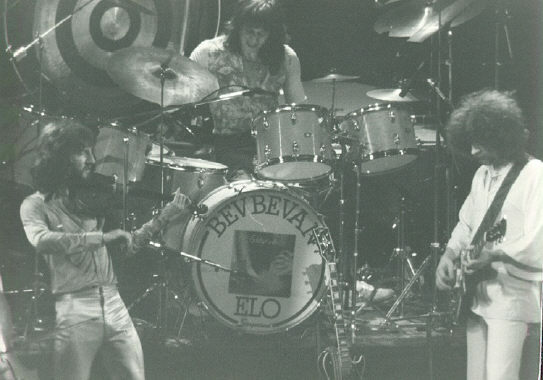 Instead, Bev steps from behind the drums and stands at the front of the stage playing only a tambourine a singing backing vocals. 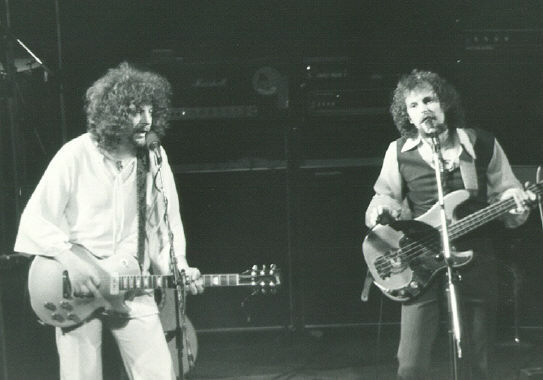 The lead guitar parts are played on keyboard, there are no female backing vocals, and it has a non-fading end. This song was not performed at all shows. Medley: 10538 Overture/Do Ya This is an interesting medley that merges the first half of 10538 Overture with the first half of Do Ya. 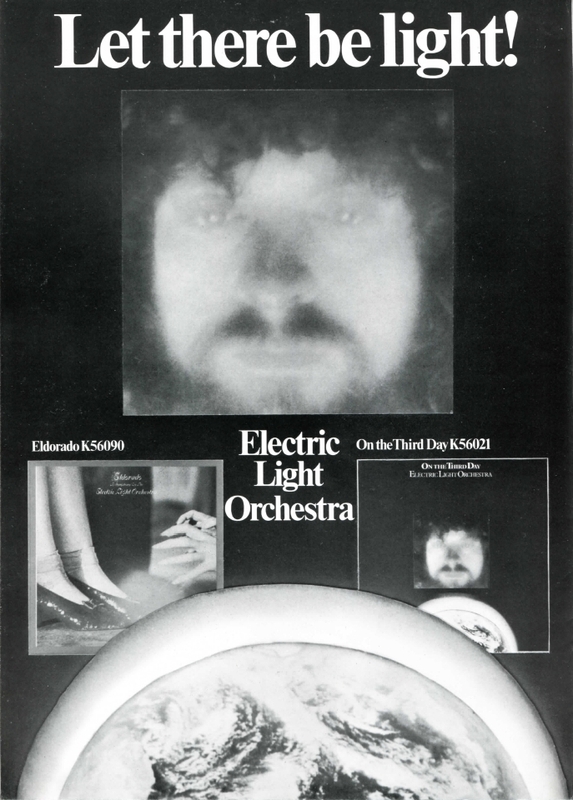 On 10538 Overture, it is the basic arrangement from ELO's first album except: Kelly sings all lead vocals except the "did you see him run, did you see him fall" and "did you see him hide, did you see him crawl" lines, which Jeff sings; there is an added keyboard part that plays over most of the instrumental parts; and only the first three minutes of the song is played before merging into Do Ya. 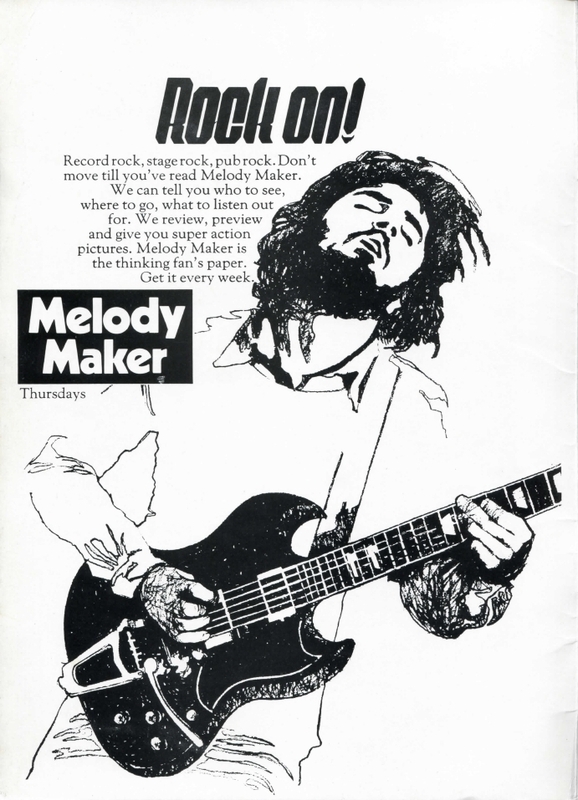 On Do Ya, it is the basic original Move single version except: it has the extra "and I heard the police playin' with their guns" line from the as-yet unrecorded ELO version, Kelly sings the long "but I... part that starts the choruses; it includes string parts; and only the first verse and chorus are performed. Following the Do Ya chorus, the song returns to the 10538 Overture guitar riff to end the song. Evil Woman This is the Face The Music album arrangement, but without the orchestral intro and a non-fading end. Ma-Ma-Ma Belle This is the Ma-Ma-Ma Belle single arrangement with added piano throughout; Kelly Groucutt sings lead on the second verse and the "ma-ma-ma belle" parts on the choruses with Jeff singing the "or I will get you" (and similar) parts on the choruses; the end has an additional chorus and a lengthy instrumental part running nearly 1:20 before a big ending. On the later UK performances, the song had an approximately 20 second drum intro with Kelly encouraging the audience to clap to the beat. Let's Spend The Night Together/Piano Concerto No. 1/The End Although this song was never known to have been recorded by the band, this arrangement is mostly of the song Let's Spend The Night Together. At about four minutes into the song, there is an approximately 30 second inclusion of Tchaikovsky's Piano Concerto No. 1, then a return to Let's Spend The Night Together. The last 30 seconds or so is the end section of the Beatles' The End ("and in the end, the love you take..."). This song was not performed at all shows. 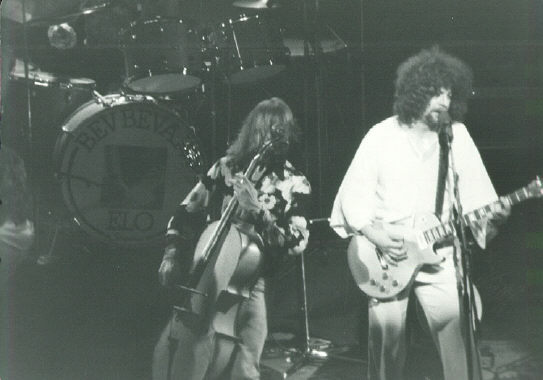 Roll Over Beethoven This is the ELO 2 UK album arrangment, but cuts the mellotron intro; also, the third and fourth verses and second chorus are cut, replaced by a long instrumental jam and picks up at the repeated "Roll Over Beethoven" part; the ending is extended, drawing out the last notes in a long jam. 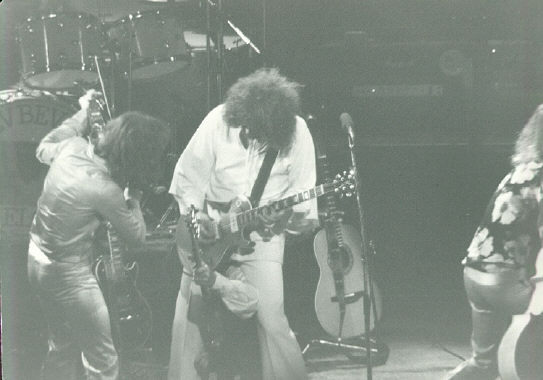 The early performances in the tour also include a special intro that inserts a short section of Beethoven's Moonlight Sonata (First Movement) between the opening notes of Beethoven's Fifth Symphony and the rock 'n' roll guitar intro. Three performances from this tour have had official release. Two of these releases are audio only and one is both audio and video, although none are complete performances. There have also been a number of bootlegs, many which fill in the gaps from the official releases. 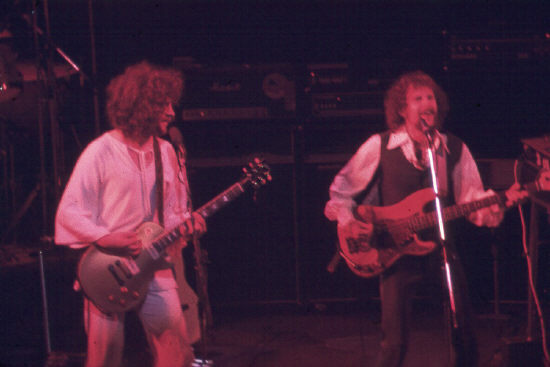 The February 14, 1976 performance at San Francisco's Winterland Ballroom (which has since closed down and been destroyed) was released in 1998 in both the US and UK on a collection called Live At Winterland '76 from Eagle Records. 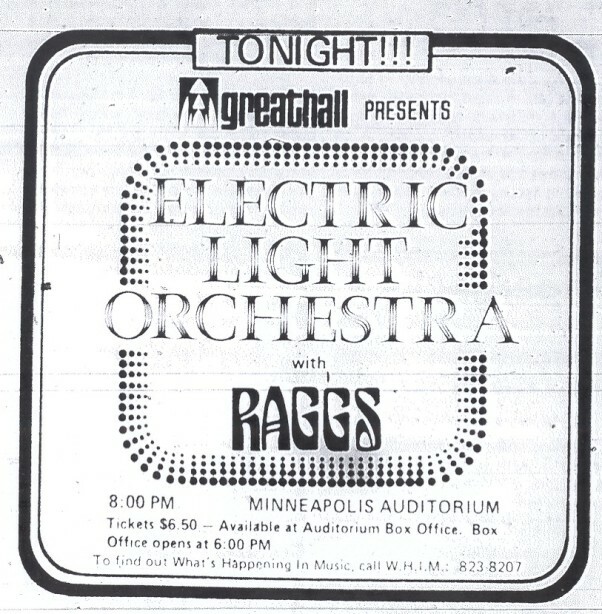 Although this is the first official release of this concert, the concert had been widely available for many years in a variety of radio shows and bootlegs and it warrants special attention. 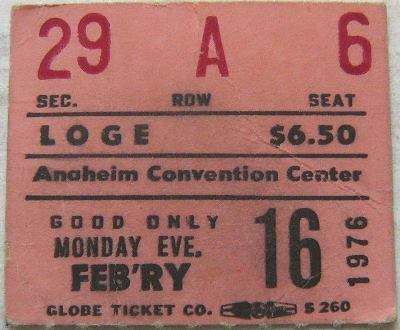 The recording was first used for the Rock Around The World show #85 radio show produced by Westwood One and broadcast on March 21, 1976. 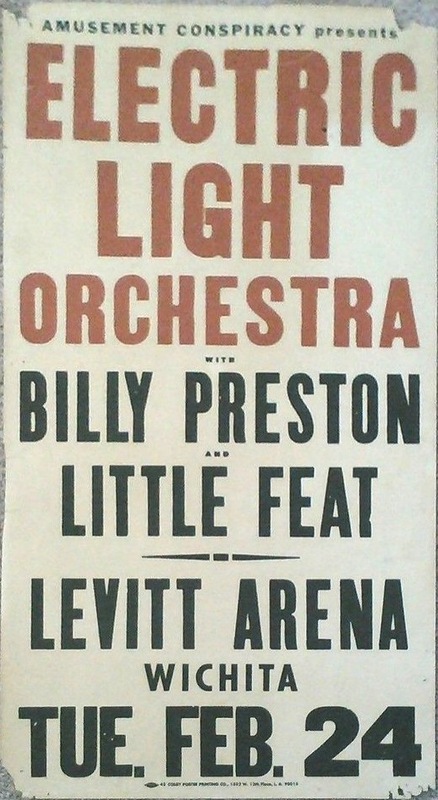 This radio show included the complete concert minus the cello and violin solos and the On The Third Day suite. 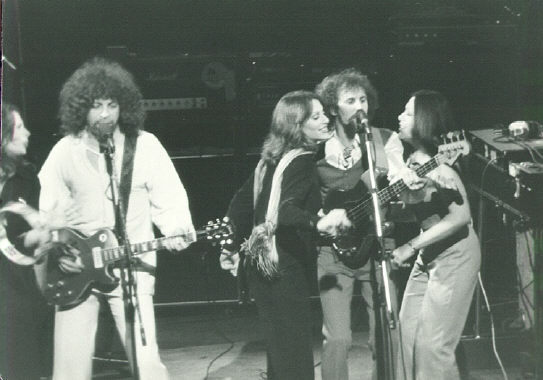 For Rock Around The World show #120 broadcast on November 21, 1976, Westwood One repackaged the songs Showdown, Strange Magic and Evil Woman from this concert and released it to radio as a highlight show that included similar excerpts from concerts by Orleans, Marshall Tucker Band and Genesis. 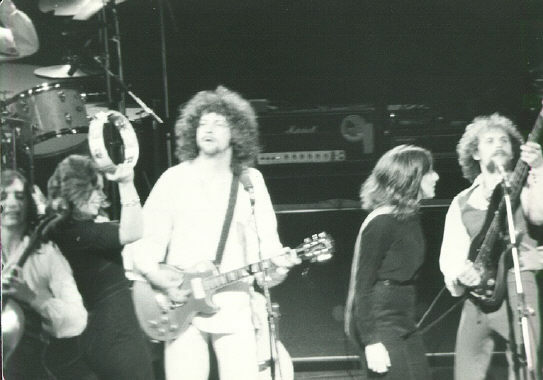 The concert performance was repackaged again for Rock Around The World show #142, this time interspersed with interviews with Bev Bevan and broadcast on April 24, 1977. This broadcast, was over a year after the concert performance and well after A New World Record was released. 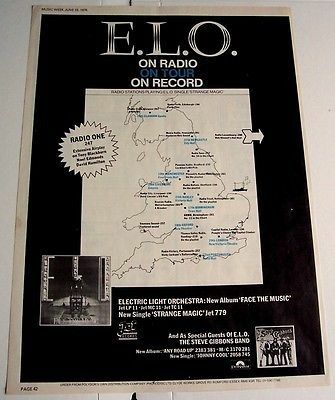 Because it was used to promote the then current ELO album, the radio show included the studio versions of Shangri-La and So Fine from the new album at the end of the show. 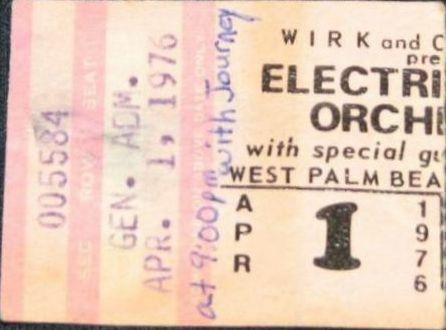 The show was repackaged yet again for Rock Around The World show #200 under the title Rock Around The World Bicentennial Show that was broadcast on April 6, 1978. 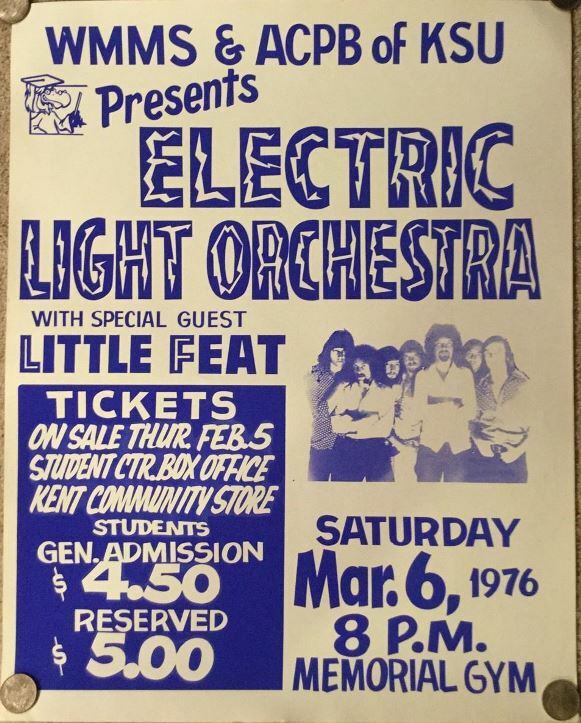 This was a "best of" type show and included the ELO songs Roll Over Beethoven and Ma-Ma-Ma Belle while including similar concert excerpts from bands such as Fleetwood Mac, Jimmy Buffet, Supertramp and Tom Petty and The Heartbreakers. Although all these broadcasts were not available for purchase by the general public, they were heavily used on radio and were readily available on the bootleg market for many years. 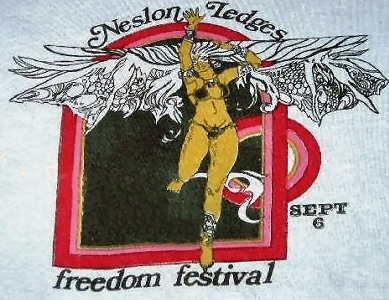 The concert performance was most commonly available on the Freedom City Pandemonium bootleg vinyl (TARKL 1994), although this release further excluded Fire On High, Showdown and Ma-Ma-Ma Belle. In 1998, although incomplete, it was officially released on an album called Live At Winterland '76 put out by Eagle Records. Most recently, a mostly unedited version of the concert, complete with stage banter, has been available for download at the Wolfgang's Vault website. 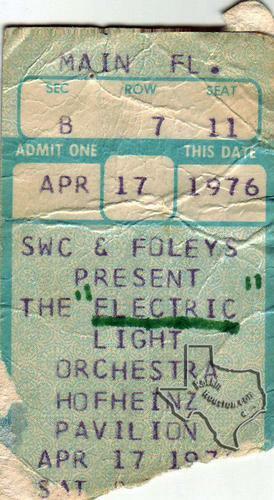 (Click http://www.concertvault.com/electric-light-orchestra/winterland-february-14-1976.html for purchase and download information.) 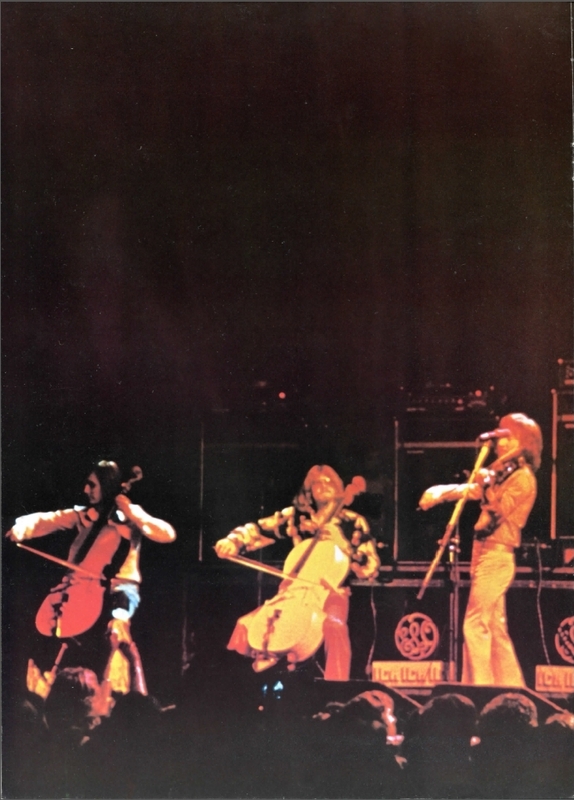 This download includes the missing cello and violin solos, however, it still does not include the On The Third Day suite which was known to have been performed as part of the show. 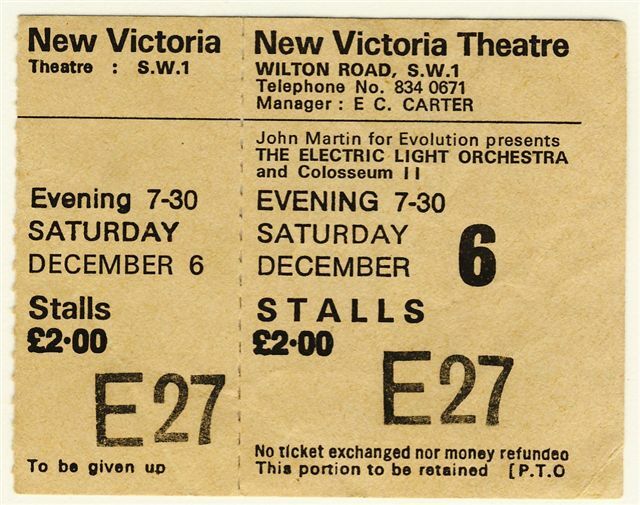 The June 20, 1976 performance at the New Victoria Theatre (now called the Apollo Victoria) in London saw official release as the Fusion Concert - Live In London video. This was released in 1990 on VHS video only in the UK on Pickwick Video Ltd (PTR 2152). The concert video is apparently one of the first concert films directed by Mike Mansfield, who went on to fame as a well-known producer and director. 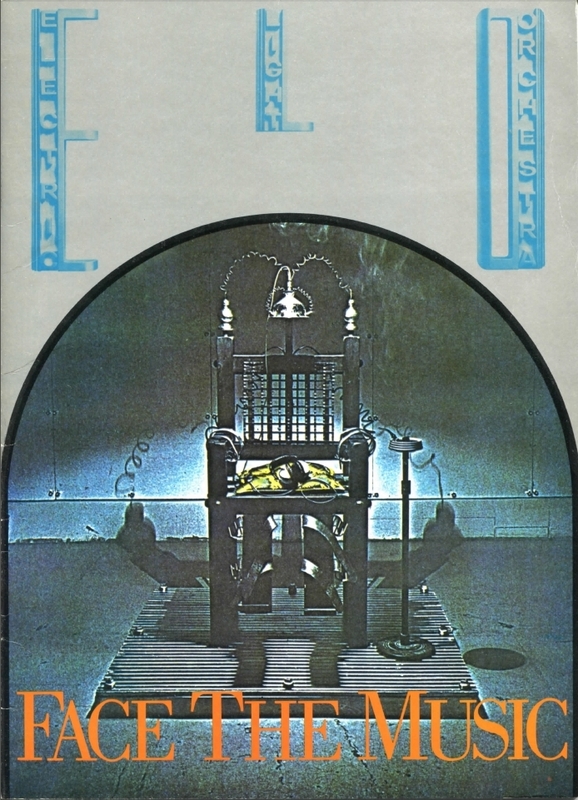 The film was broadcast on television in the UK in the 1970s, although it's not entirely clear on exactly which date or channel it was broadcast. 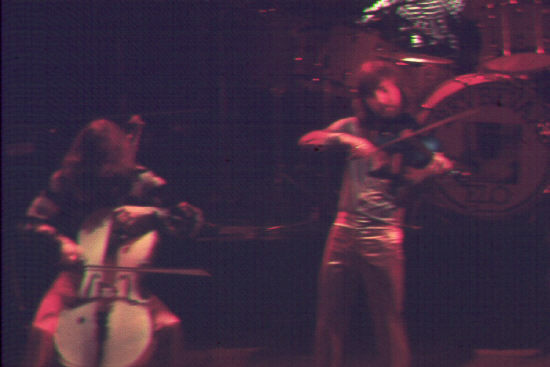 Quite a few songs were missing from the broadcast and video release, including Fire On High, Eldorado, Eldorado Finale and both the cello and violin solos. It is quite likely that these missing songs were filmed, but it is unknown if they survived the editing process. This video has not been available since the initial 1990 release. 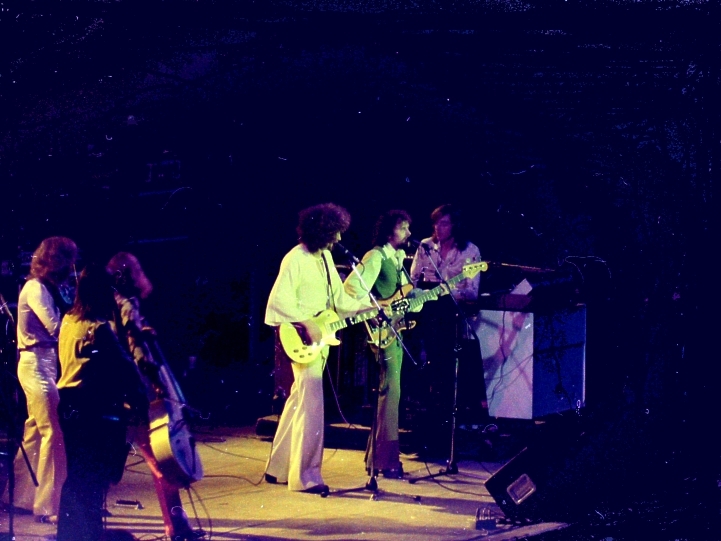 The remaining official release from this tour is the Portsmouth, UK performance on June 22, 1976 which was recorded for broadcast on BBC radio for their BBC Transcription Service series. Which tracks were broadcast on BBC radio are currently unknown. 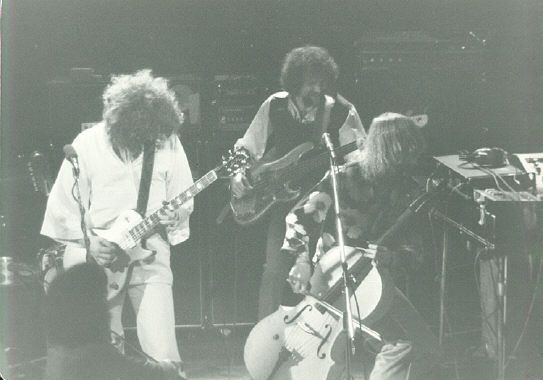 The Portsmouth performance was later broadcast in the USA on August 23, 1981 for London Wavelength's BBC Rock Hour program, but cut several songs, including Fire On High, Poor Boy (The Greenwood), Ma-Ma-Ma Belle, Roll Over Beethoven and the cello and violin solos. 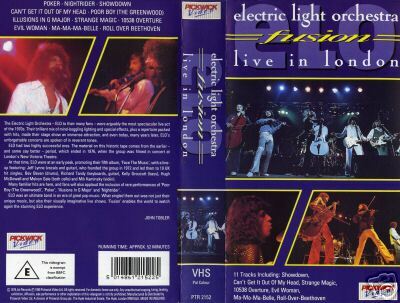 The concert was commercially released on the 1999 Live At The BBC CD (along with live selections from previous year's BBC performances) on Eagle Records. Unfortunately, this audio also is incomplete and cuts 10538 Overture/Do Ya, Roll Over Beethoven and the cello and violin solos. 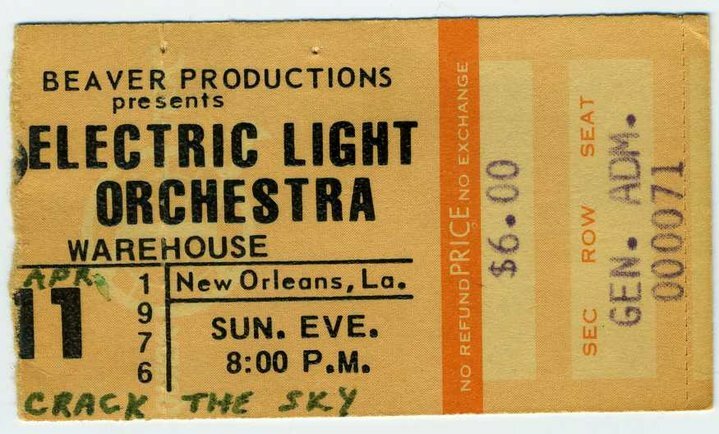 The concert was bootlegged in the 1970s on an Atomic Records LP (AR 723) under the title America Sees The Light. This bootleg features all songs from the concert, including the elusive cello and violin solos, but excludes Poor Boy (The Greenwood). An enduring mystery is the exclusion of Eldorado and Eldorado Finale from the concert. 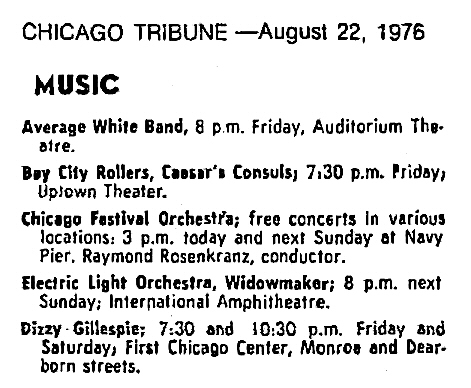 These songs are not available in any form anywhere, so it is unclear if they were even performed at this concert. 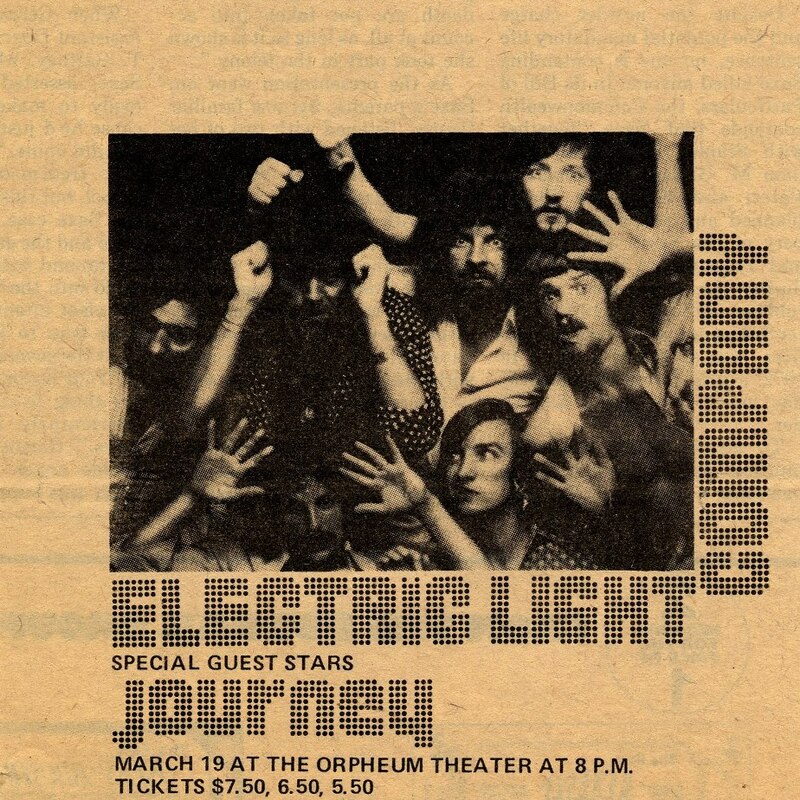 Other bootlegged performances, which are all audience recordings, include a March 4, 1976 performance in Detroit, Michigan, a March 19, 1976 performance in Boston, Massachusetts, a March 16, 1976 performance in Flint, Michigan, and a December 6, 1975 performance in London, England (which is not the same performance as the Fusion Concert - Live In London video performance). All of these bootlegs are the complete concert. Luckily for fans, the Detroit performance includes the very rare Let's Spend The Night Together/Piano Concerto No. 1/The End medley and the London concert includes the equally rare use of Beethoven's Moonlight Sonata (First Movement) to intro Roll Over Beethoven, rather than the usual Fifth Symphony. 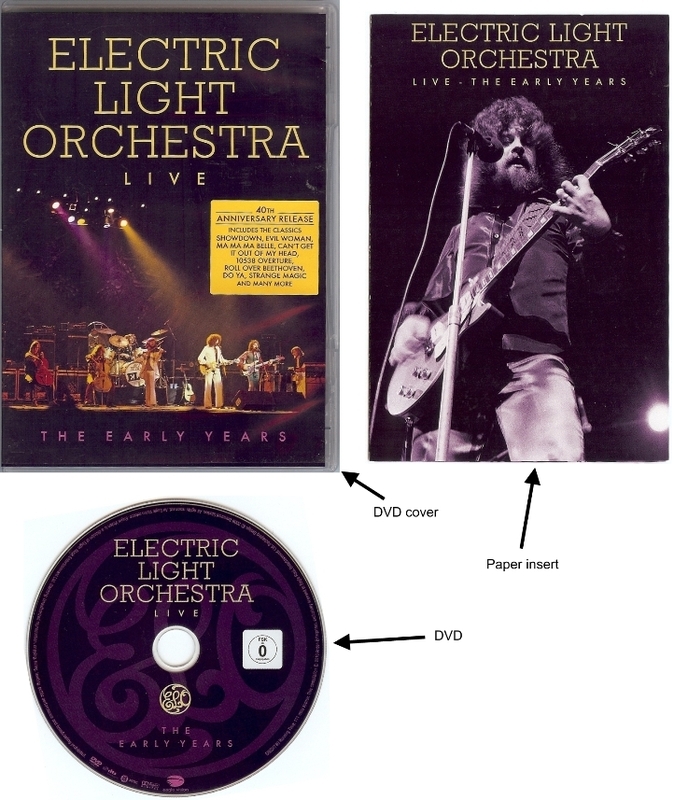 These recordings are evidence that during this tour, ELO were performing their longest setlist ever, running as long as an hour and 45 minutes and including as many as 29 different songs (with several as medleys). The chart below summarizes the available recordings from this tour, bootleg or otherwise. December 6, 1975 London, UK Fair Unknown The intro to Roll Over Beethoven uses a live performance of Beethoven's Moonlight Sonata (First Movement) rather than the Fifth Symphony. 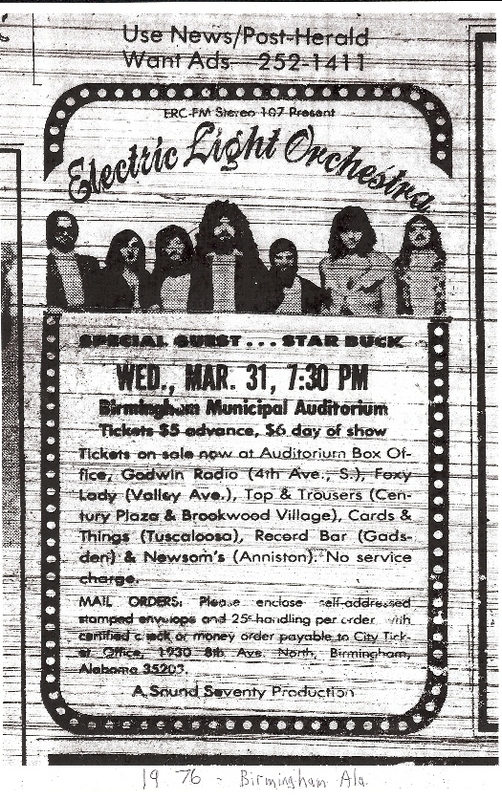 The show does not include Strange Magic, probably because it was not yet a single at the time of this concert. 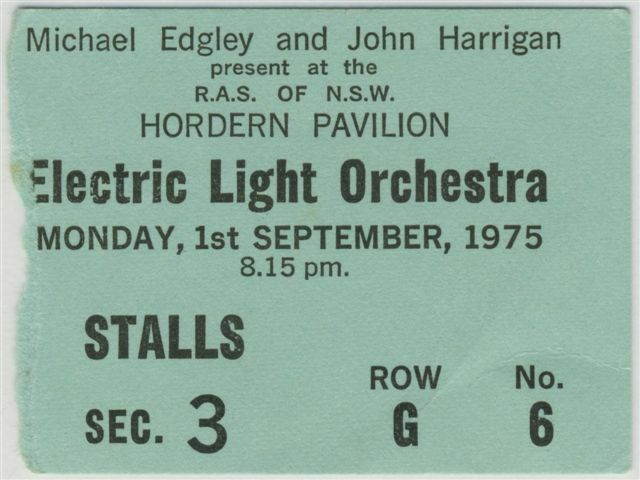 It also includes a slightly different ordering of the songs at the beginning of the show with the order being Fire On High, Showdown, On The Third Day suite, Hugh's solo, Poker, Nightrider and Eldorado Overture with the rest the same as other concerts. 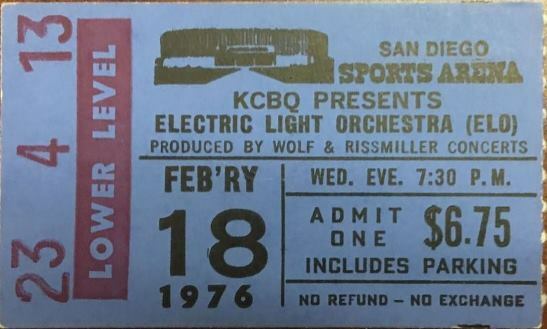 February 14, 1976 San Francisco, USA Sound board Excellent No version of this concert includes the On The Third Day suite and it remains unclear if it was actually performed. 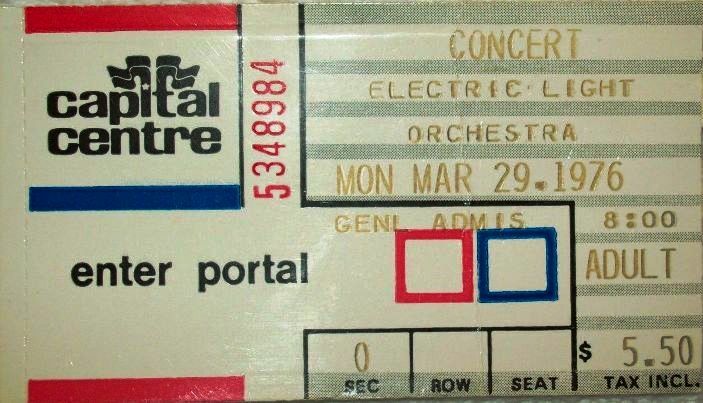 March 4, 1976 Detroit, USA Audience Good This is the only known recording of the rare Let's Spend The Night Together/Piano Concerto In A Minor/The End medley. 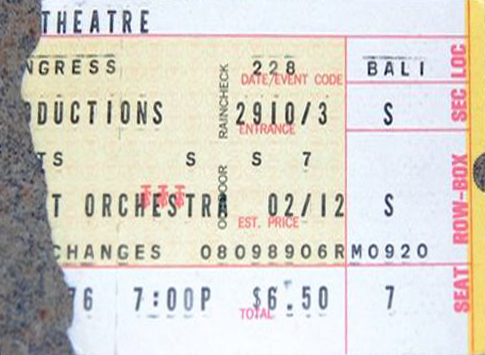 March 16, 1976 Flint, USA Audience Very Good The performance of Hugh's Solo is incomplete. 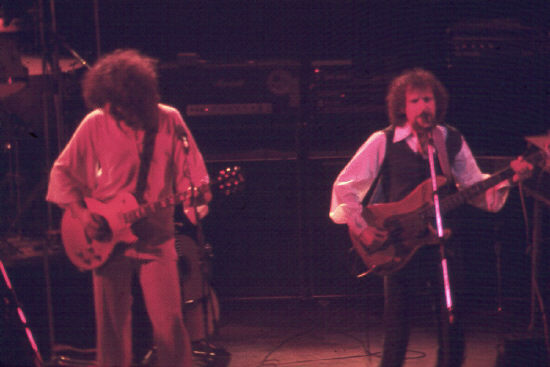 March 19, 1976 Boston, USA Audience Good/Excellent There are two differently sourced bootlegs of this concert. The one that has excellent sound quality is missing the first minute or so of Poor Boy (The Greenwood), but the other has the complete song. 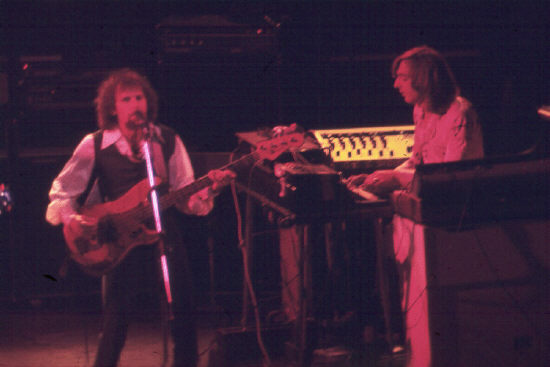 June 20, 1976 London, UK Sound board Very Good Taken from the Fusion Concert - Live In London video, this performance exlcudes Fire On High, the On The Third Day suite, and both Hugh and Mik's solos. These missing tracks are not available anywhere, official or bootleg. 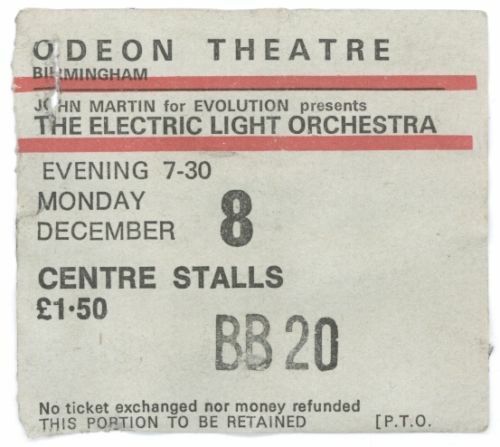 June 22, 1976 Portsmouth, UK Sound board Excellent The official release on this show on the Live At The BBC CD, it is incomplete, however, the complete concert (minus Eldorado and Eldorado Overture which may not have been performed) is available as a bootleg. This was clearly a transition time for the popularity of the band. 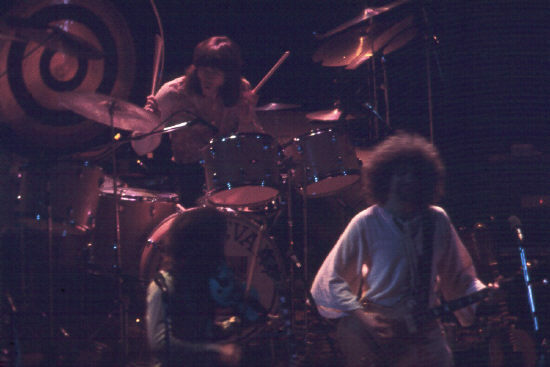 During the tour, sometimes they were the opening act and at other times they were the headline act. The other bands they opened for or had open for them varied greatly from performance to performance. 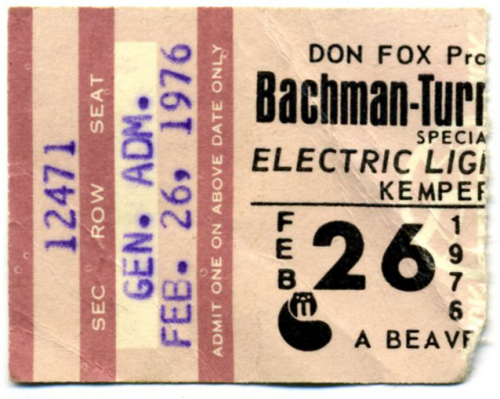 In at least two known cases, they opened for Bachman Turner Overdrive and Jethro Tull. 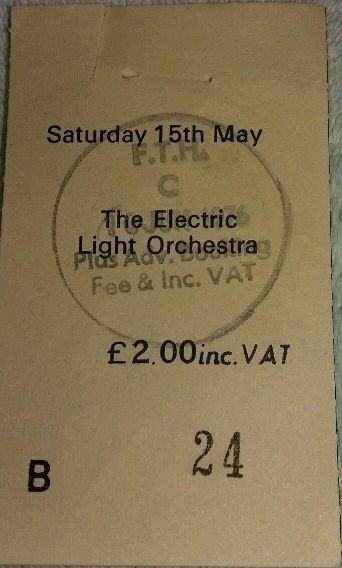 Where ELO was the headliner, opening acts included mostly Little Feat and Journey, with occasionally openings by Kingfish, Elvin Bishop, Roxy Music, Wishbone Ash, Rory Gallagher, Camel, Mahogany Rush, Pure Prarie League, Suzi Quatro and Steve Gibbons Band. 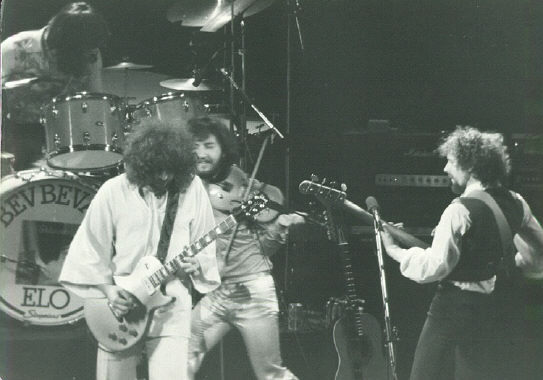 Little Feat was originally scheduled to tour much more extensively with the band, but after the San Diego show, they had a disagreement and left the tour schedule. The nature of the disagreement is unknown. No other photos from this tour are currently available. If you have any to share, please contact me at the email address at the bottom of this page. 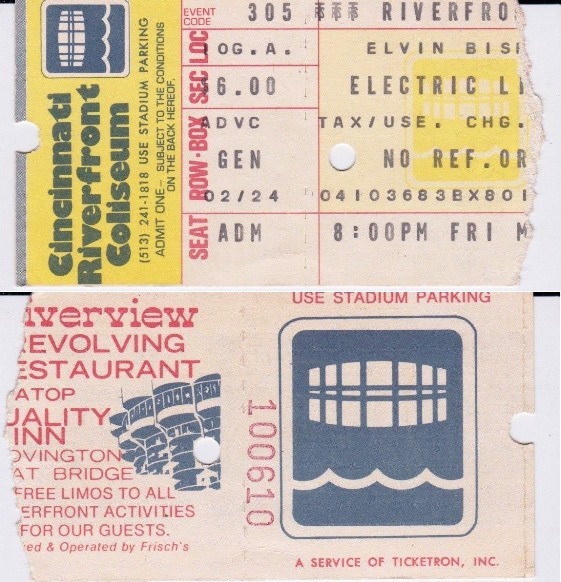 Was at the March 5 1976 show at Riverfront Coliseum in Cincinnati and Journey/Elvin Biship were not the openers. 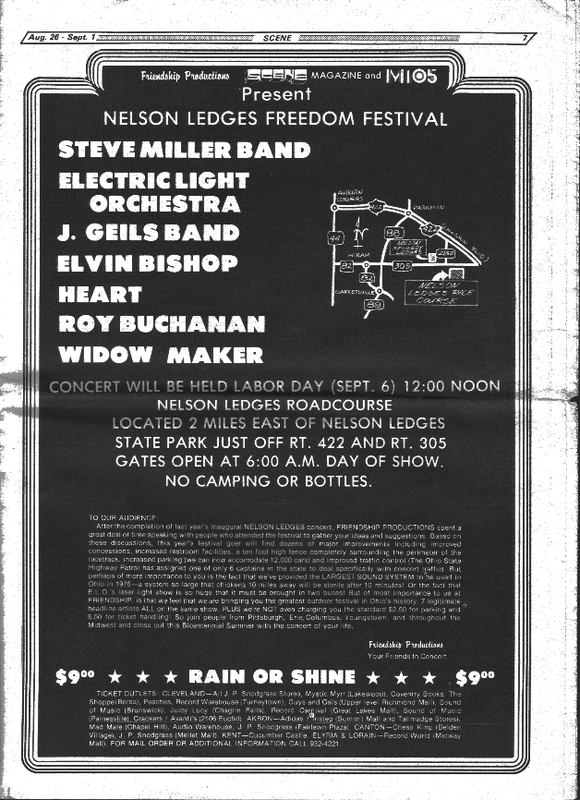 It was Little Feat and Elvin Bishop. 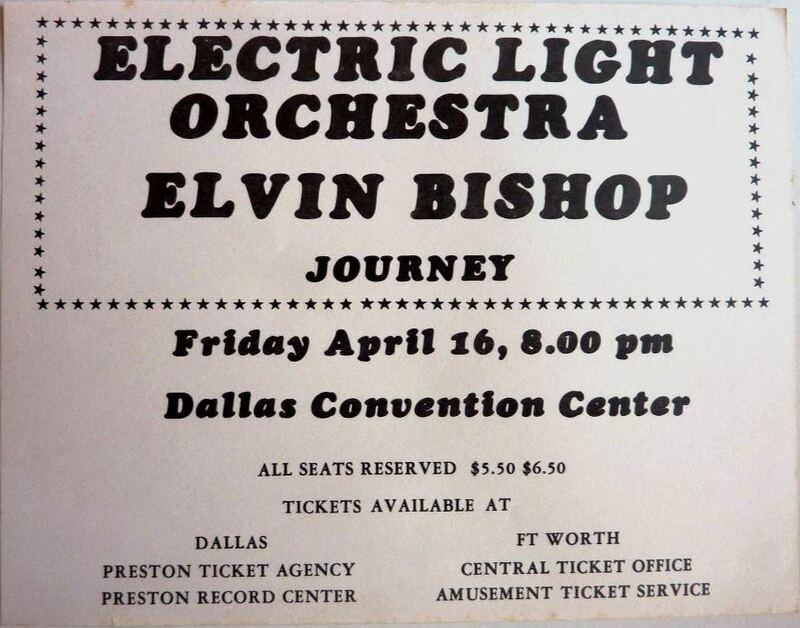 Editor's Note: There is quite conclusive proove that it was Journey and Elvin Bishop. 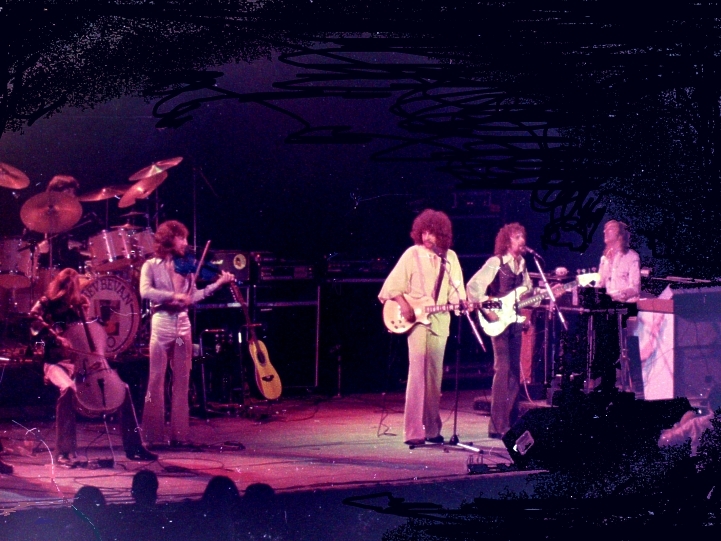 Little Feat had a falling out with ELO in February and cancelled the rest of their appearances with the band. Tour statistics posted after the concert back this up. I attended the Philly Spectrum show also with four or five friends. It was general admission and we got there early so were about six feet from the front of the stage. It was packed. 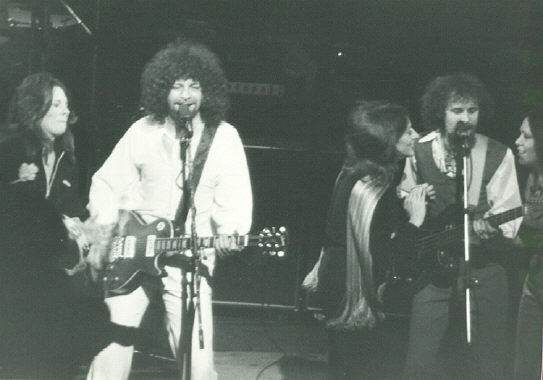 By the time ELO hit the stage there was a tremendous crowd surge and press toward the front. I'm 6'4" and can hold my own but my girlfriend with me was only 5'2" and was wedged in among all the compressing bodies and was lifted off her feet and helplessly carried at the mercy of the shifting crowd. She thought she was going to die! Needless to say we made our way out from that sardine can and watched the rest of the show from further away. 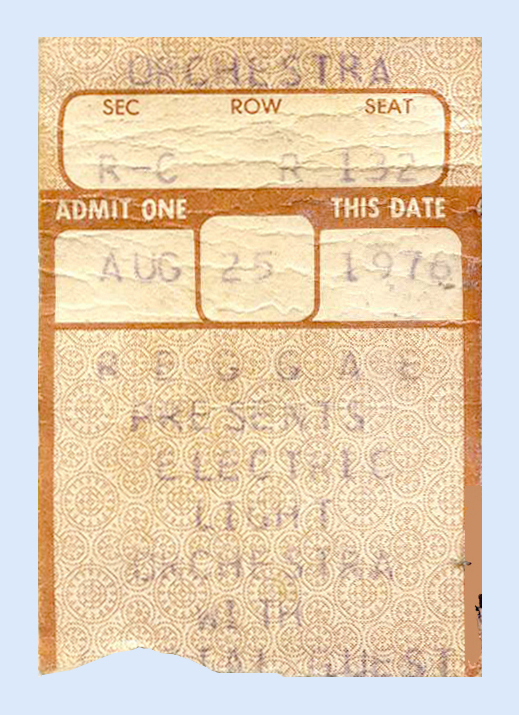 I remember while the roadies were staging the equipment between bands seeing that little green beam of laser light flashing on the stage and wondering what it was. 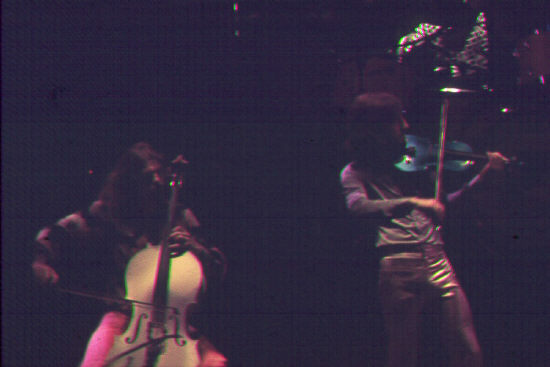 When the band started played it was directed onto a little mirror on one of the cellists speaker cabinets. The vibrations from the speaker would cause the mirror to shake a bit this would make the reflected beam wiggle on its way to a discoball high above the crowd. When that reflected beam then hit the discoball it would explode into thousands of rays of light like sparks and rain down on the crowd. Very 'primitive' method but super cool effect. It took alot of precision to get that one little laser beam lined up just right! 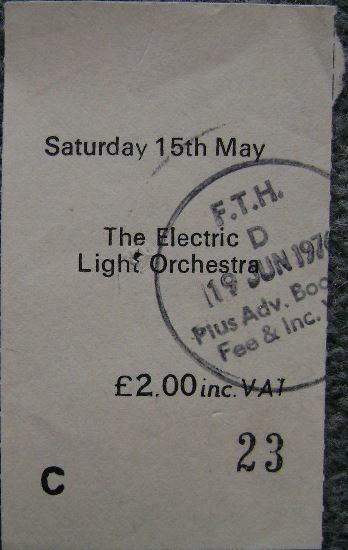 Wow, ELO/Wishbone Ash/Journey what a show! Not sure how I stumbled onto your website, but WOW. 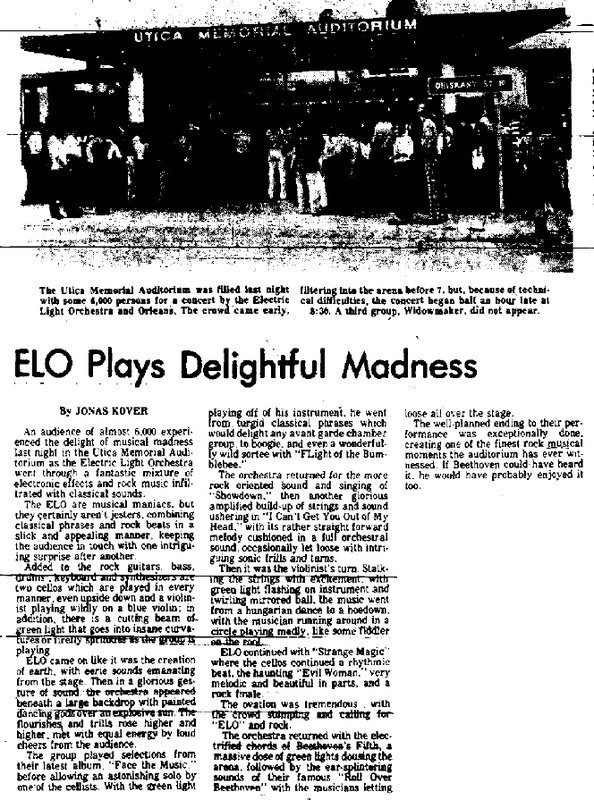 Anyway, I was super happy to see the show I attended (Philadelphia @ The Spectrum 3/23/76) listed and the LONG write up about it. 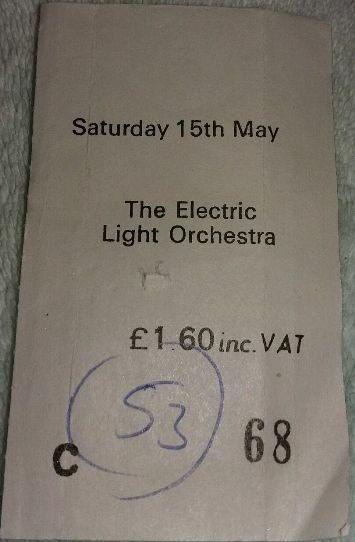 It was maybe my first or second rock show ever attended and wow, yes, was probably the most amazing thing I ever saw. 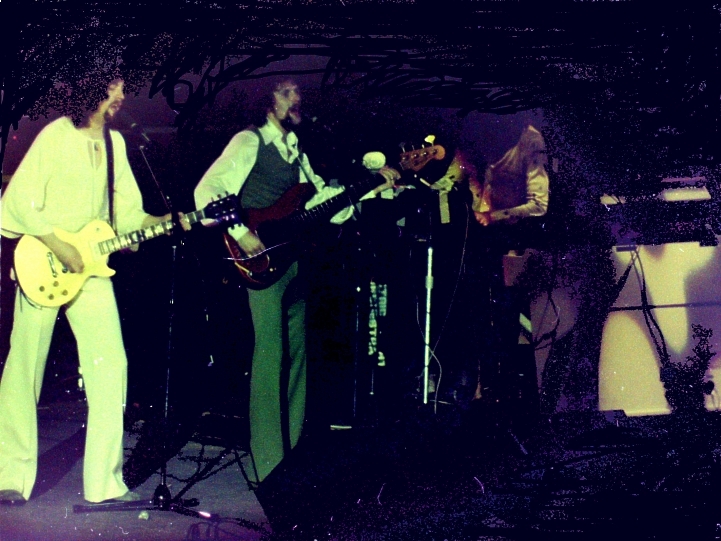 Being Huge ELO / Wishbone Ash fans myself and two other buddies went and were completely blow away. 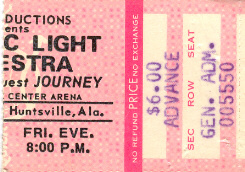 I believe Journey did not have Steve Perry singing yet, vocals handled by the bassist or keyboardist I think. 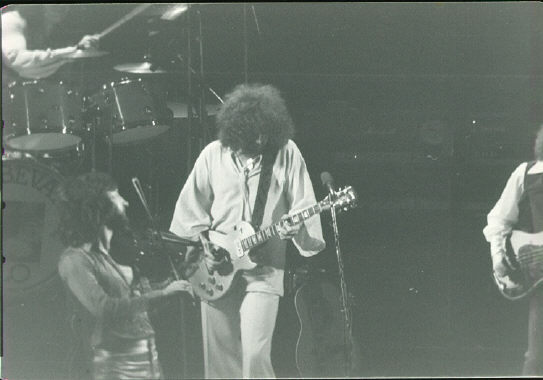 Funny thing happened to Neil Schon during Journey's opening.. As was the thing during that era ( especially in Philly) people threw stuff on stage. Well somebody tossed one of those glowing light sticks up and it got stuck in his rather large hair during a lead solo. 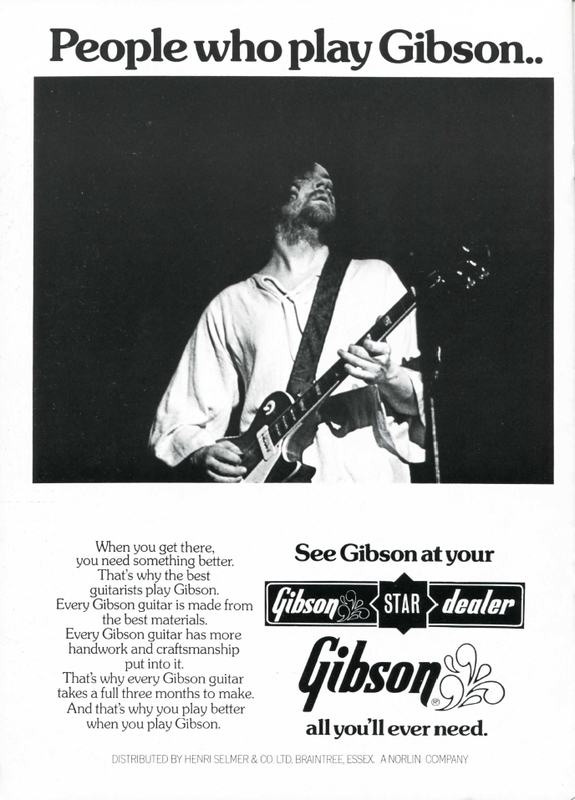 Also that review on your site mentioned the infamous "Hello Cleveland/Spinal Tap" thing as starting at that show. Totally cool. 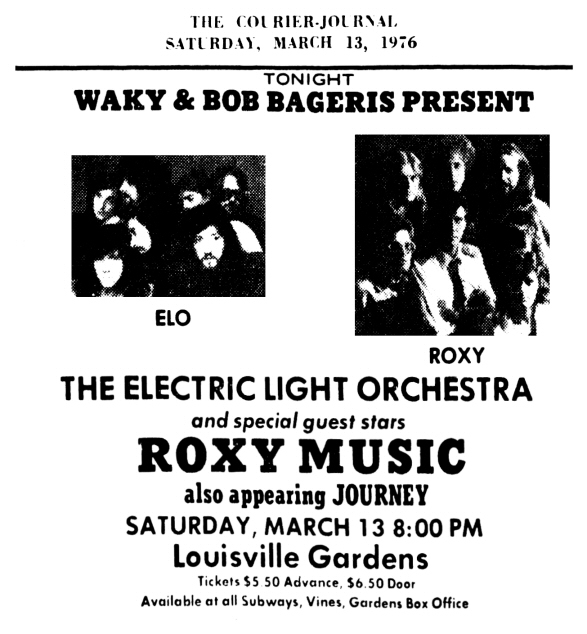 My first concert ever was April 13rh at Murray state University. 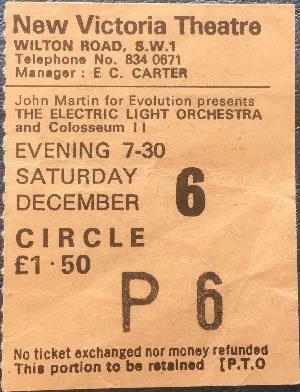 As mid-teenagers we attended the Edinburgh University (28/11/75) & Glasgow Apollo (26/6/76)shows with many anecdotes about both gigs. 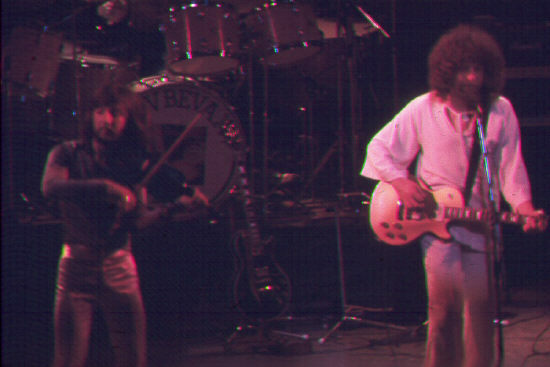 They were among the very best performances I have ever seen (along with Yes & Jethro Tull). 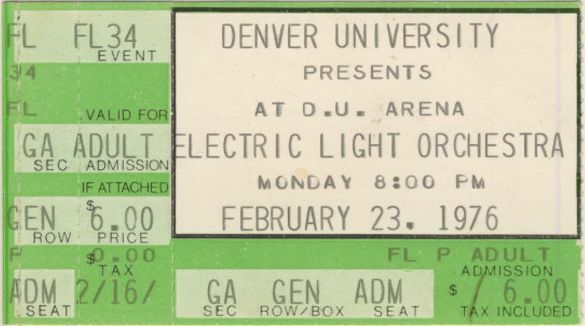 The 2 concerts were so different in that the University one was in the student health centre and therefore in a pub rock environment as they were still not yet as big as in America. We were sitting in front of the cellists with their cans of Tennents on the floor. Opening with Showdown the sound was very good & as Jeff Lynne announced the new single he gave us a nod when I piped up 'Evil Woman' & replying 'well done !' 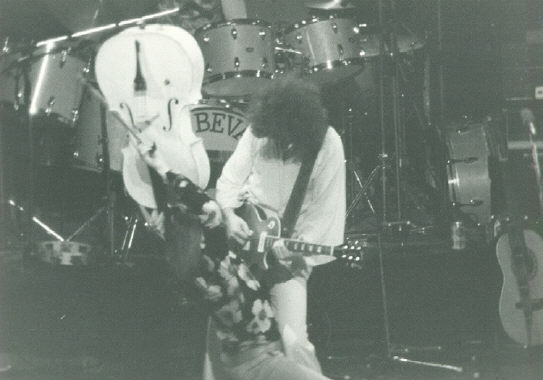 Actually recall seeing Bev Bevan with a long Tom Baker style scarf at the stage door. Think the support act was Fastbuck - will confirm. 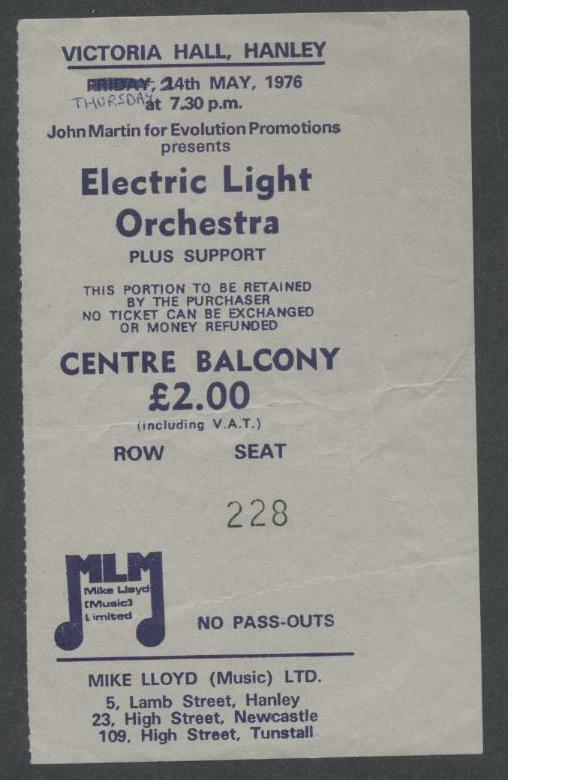 By contrast in Glasgow the following summer, the Apollo concert was spectacular with laser displays making their rock debuts that year as we had seen with the Who at Parkhead earlier that month. I think Roll Over Beethoven was the glorious finale. 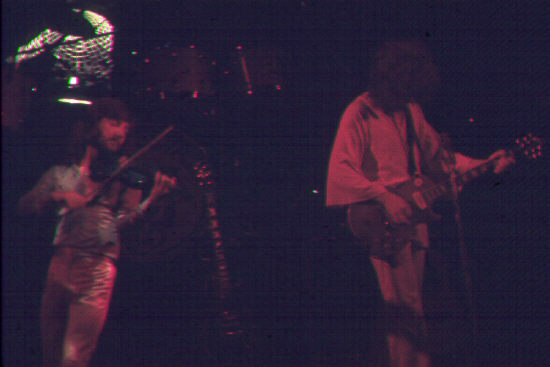 We also photographed the band at Edinburgh - have to scan & post those. Cheers - good to see those gigs listed. 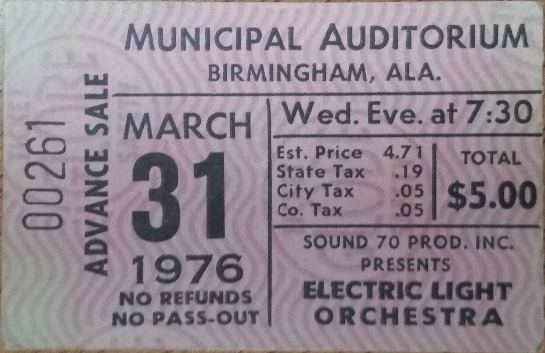 My programme from the B'ham Town Hall (rearranged) gig came with a silver ELO badge. Was this common to all the gigs? Editor's Note: I have no idea if it was common to all gigs. I've not heard of it. If you'll send me an image, I'll put it on this page and can query other visitors if they know more about it. Thanks. 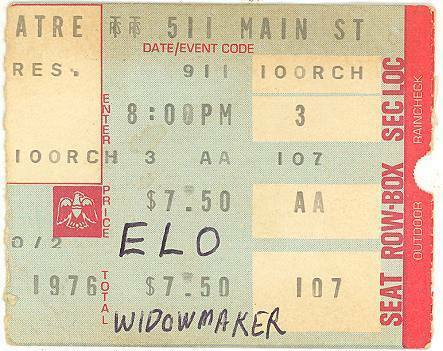 I saw ELO at the Universal Amphitheater in August 1976. My first and best concert ever!!! The lasers bouncing off their instruments were phenominal! 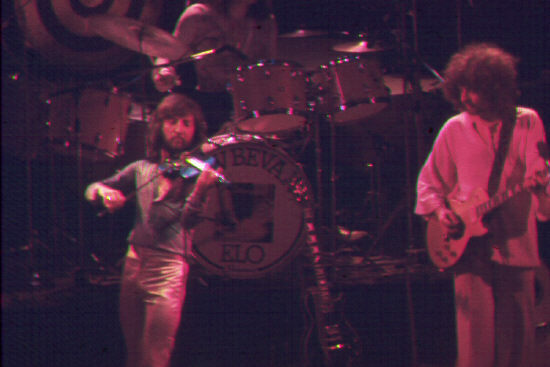 I remember seeing ELO at Madison Square Garden, NY sitting up in the blue seats on the right side of the stage. They opened with Poker. Lots of lasers. 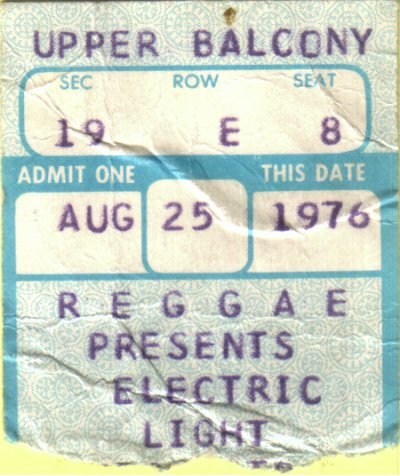 Could this have been a 77' show, you have no 76' show from MSG and you have Fire On High as an opener. Editor's Note: I have no record of the band ever opening with Poker. Anything is possible as the setlist was known to vary from time to time. 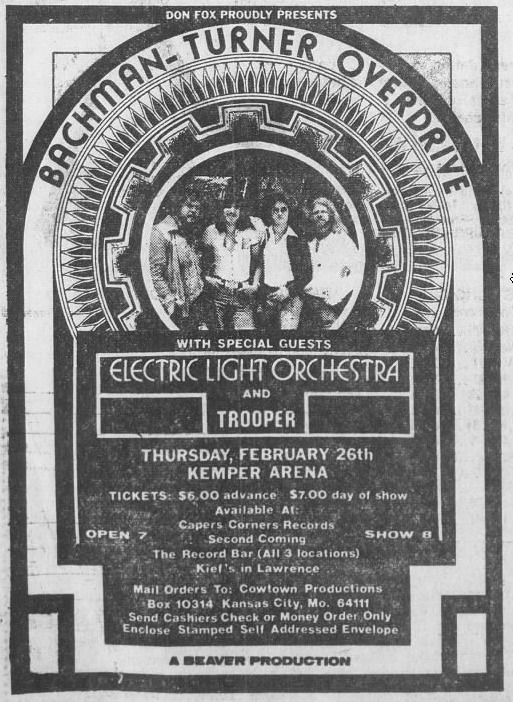 That said, I believe you're talking about the 1977 show as the band didn't play Madison Square Garden in 1976, but they did in 1977 (according to my records). 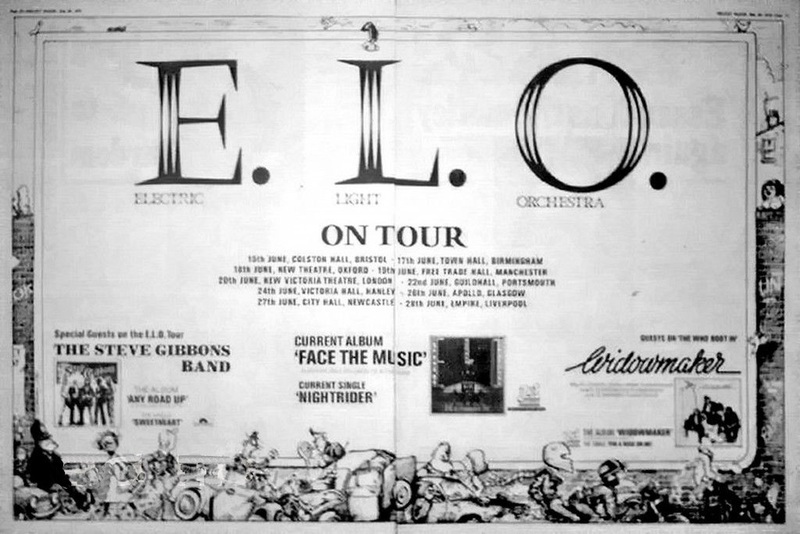 I've only seen ELO once, it was on the Face The Music tour (I have the program) but it was at Birmingham Town Hall not the Odeon, which contradicts the information above.Steve Gibbons was supporting. Editor's Note: There were two different tours of the UK and I believe you're getting them confused. 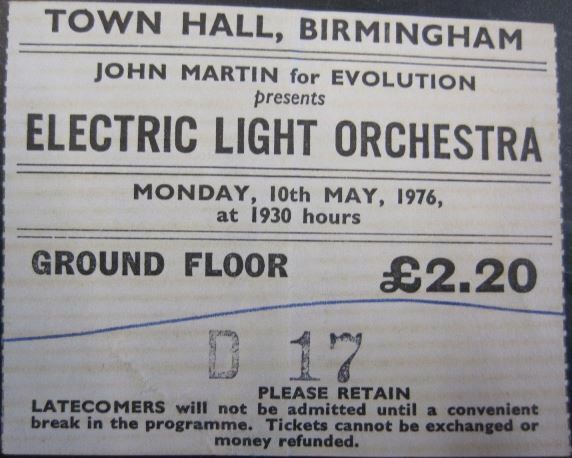 The second tour, in June 1976 was at Birmingham Town Hall with Steve Gibbons opening. So all is good. Comment on editors note: I believe you are correct sir, I spotted the cancelled gig and got the wrong end of the stick. Many thanks for a great site. 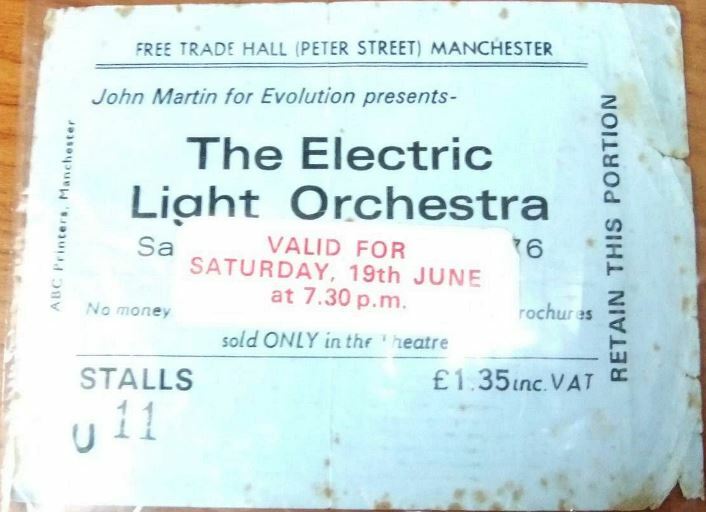 I went to the June 1976 gig at Manchester Free Trade Hall, England. 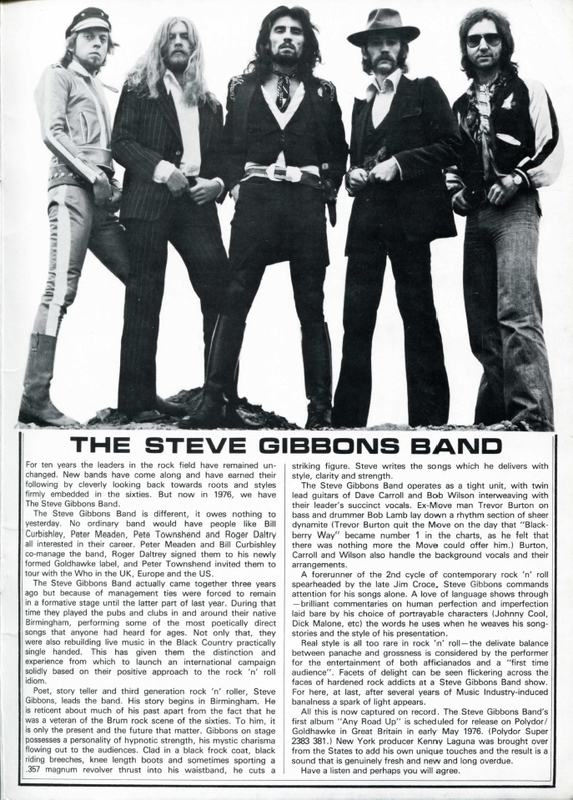 Steve Gibbons Band were the support act. Trevor Burton (ex-Move) was playing Bass in that band. I spent their set in the Theatre Bar until E.L.O. came on. I didn't pay my money to see the support act. Jeff and the boys put on a great show as I remember. 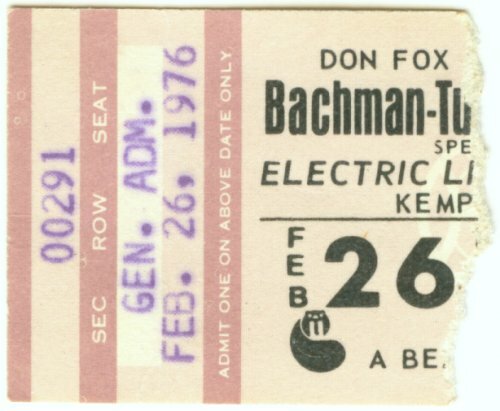 I was at the La Crosse, Wi show in Feb of '76. My second concert ever. The opening act was a solo artist named "Jay Boy Adams". 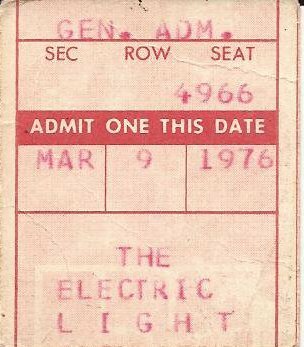 I remember seeing them at the Oakland Coliseum Arena indoors .... even though the ticket stub on this page says it was "Day on the Green #7". 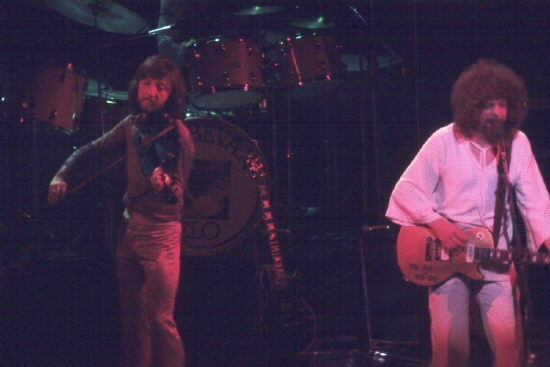 I was hooked on ELO after hearing the Winterland live recording on 94.9 KSAN a few months earlier. I still have the cassette tape, even though a digital recording is available on Wolfgangs Vault! 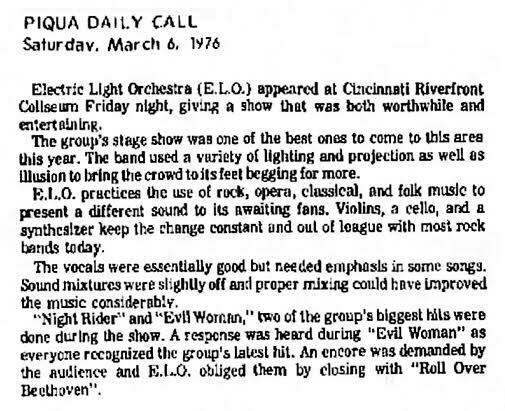 "The sell-out crowd listened in darkness as the eerie sounds of ELO's Waterfall opened their portion of the program. From Waterfall they plunged into two other songs from their newest album, Face The Music, called Poker and Nightrider." Editor's Note: Is is reasonably certain that the author is confusing the opener Fire On High with Waterfall and Waterfall was not actually performed on this tour at all. "The show starts with the tape montage from Fire On High, the overture from Face The Music, with the sound rolling around the arena like indoor thunder. And just so you know this is a cosmic occasion, there is the laser, which literally shoots energy into the audience. A single, fat beam of green light hits a revolving mirrorball, and rays streak down onto the multitude, like a phaser attack from a Star Trek army. The Orchestra's musical attack when the lights come up is no less stunning. Strings and keyboards mesh together with some majesty, but do it with a force that makes the hall of the mountain king look like a Mecca ballroom." 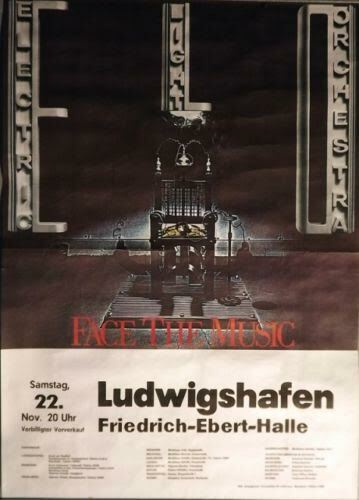 "ELO hit the stage with Fire On High the introductory instrumental piece from their latest album, Face The Music, a theme that met with instant recognition." 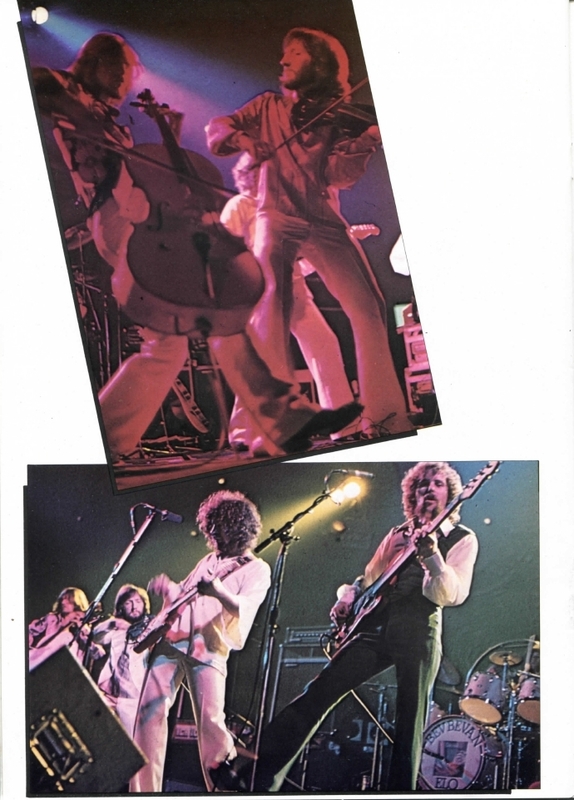 "In 1976 pre-recorded backing tapes were used for the first time to support the group, providing the intro's of Fire On High, Roll Over Beethoven and the prologue of Eldorado Overture." "I can't think of a better way to kick off the show than the opener Fire on High. Wow does this sound different live! Although there are some problems, like a little sloppiness, a few mixing issues, and an out-of-tune lead guitar, the performance is just full of raw energy. Groucutt's bass playing is absolutely amazing compared to his contributions on their studio recordings. I had no idea he was capable of playing with this much energy." "From Waterfall they plunged into two other songs from their newest album, Face The Music, called Poker and Nightrider." +	"A natural to blast off with [on stage], Poker is the nearest ELO get to boogie, the full-tild rhythm suggesting a touch of the Quos. Except this baby has strings and cellos on board." "They follow this up with the rocking Poker. Again, some mixing problems, but lots of energy and overall a great performance. 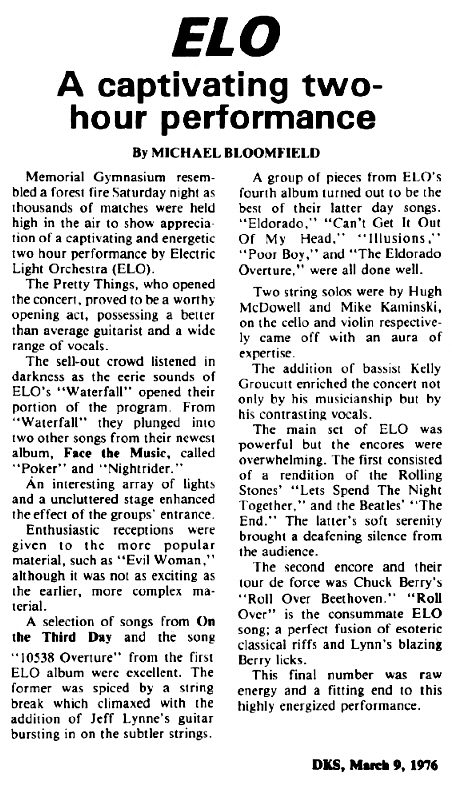 This leads into a fantastic performance of Nightrider..."
"[The performance of Poker] leads into a fantastic performance of Nightrider, although I found the strings to be too low in the mix." 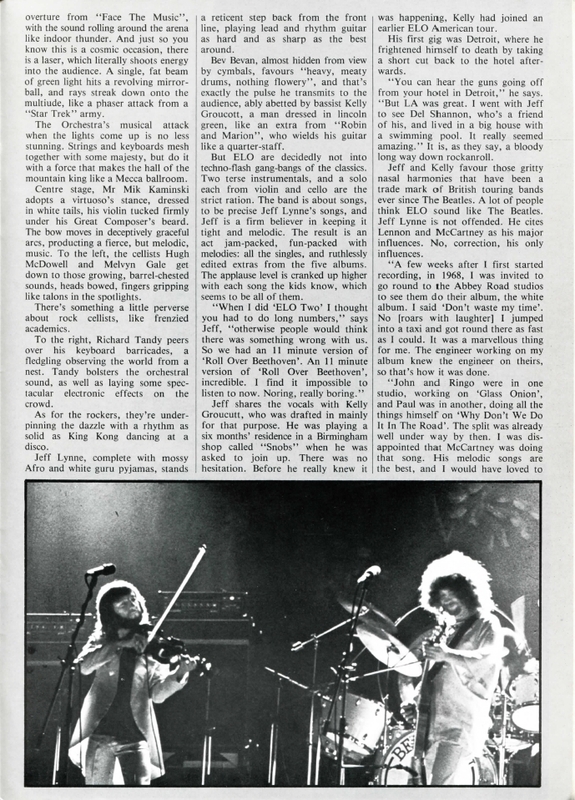 "Two string solos were by Hugh McDowell and Mike [sic] Kaminski, on the cello and violin respectively came off with an aura of expertise." 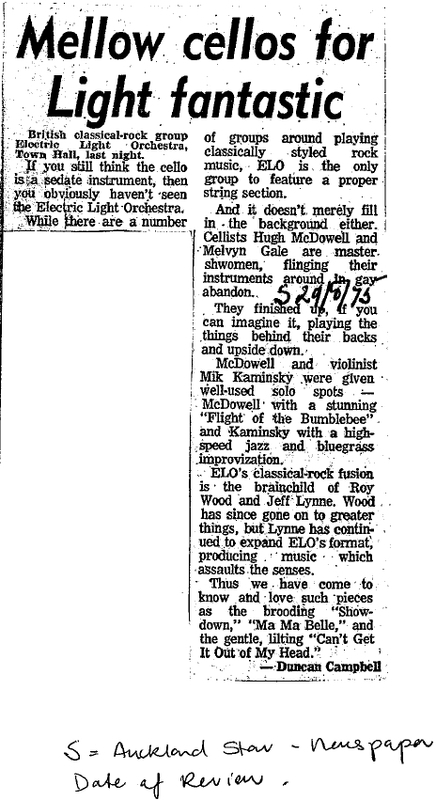 "The tension provided by the classical strings was best displayed in the cello solo on Flight Of The Bumblebee and in pieces like 10538 Overture, from the first ELO album." 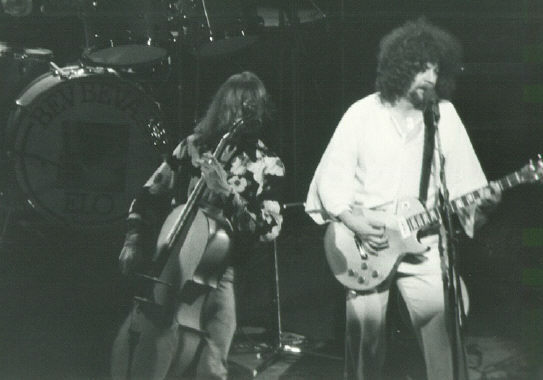 "About a third of the way into the ELO set, Hugh McDowell does his cello solo, with everyone else walking off. Bathed in a single spotlight, with laser beams dancing at his side, Hugh produces the most astonishing range of sounds from an instrument with no such obvious potential. It wails, it screams, it bends back on itself, it comes on like a blues band with high notes on the treble strings and low notes on the bass, it does a fair impression of Hendrix in full flight. Then, as though remembering its place, it cranks out The Flight Of The Bumble Bee. The audience whoops with delight." "A brief interlude which consisted of a stunning cello solo by Hugh McDowall exhibited the virtuosity of the performer." 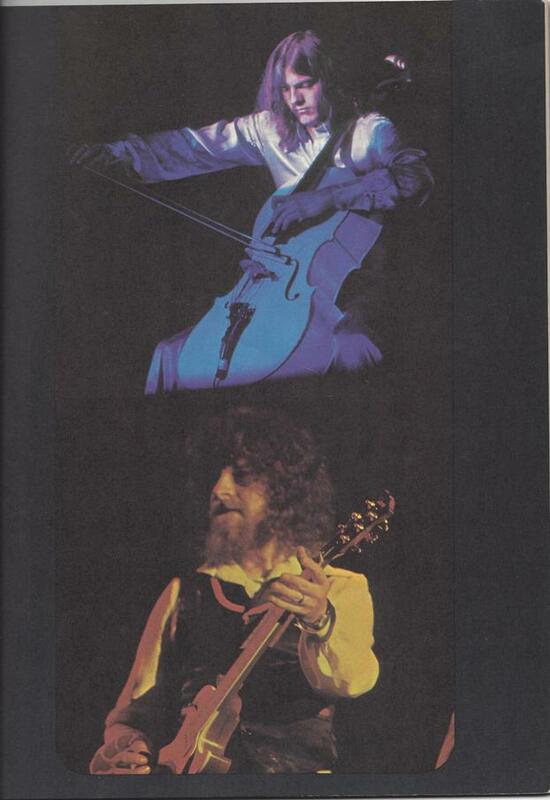 "Cello player Hugh McDowall was equally impressive with his 'get down' solo on his instrument. To watch the formally attired McDowall sitting sedately one moment and suddenly raging about the stage with his massive instrument high over his head provided good cause for the excited audience feedback." "The group played selectins from their latest album, Face The Music, before allowing an astonishing solo by one of the cellits. With the green light playing off his instrument, he went from turgid classical phrases which would delight any avant garde chamber group, to boogie, and even a wonderfully wild sortee with Flight Of The Bumblebee." Editor's Note: These comments are not necessarily for this Winterland performance, but the database does not have another place to store the comments at the moment so they are being placed here for posterity. "The range of material covered the full spectrum of the Orchestra's accomplishments. From a tight medley off On the Third Day to the classical pop tune Showdown and on to their latest single Strange Magic-- all were given enough spirit to create a relaxing feeling. " "I was somewhat disappointed with Showdown. The cellos weren't loud enough in the mix, being totally drowned out by the rest of the band. The cellos are the hallmark of this song. Their performance of this song on The Night the Light Went On In Long Beach was much better." 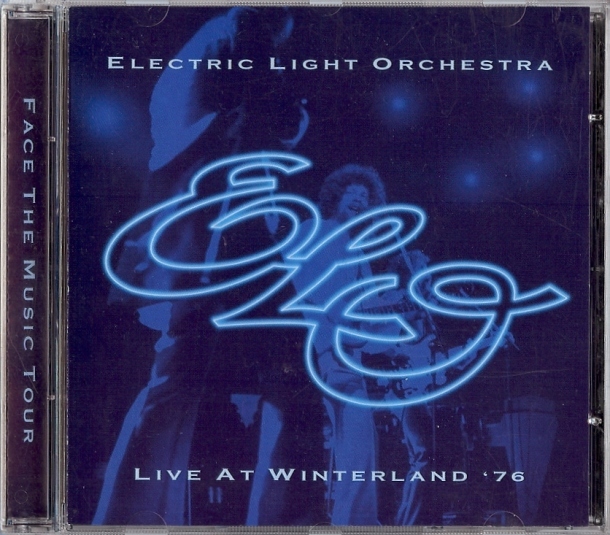 The Live At Winterland '76 labels this song as Eldorado Suite (Including Can't Get It Out Of My Head), which runs 13 minutes and 14 seconds and includes several Eldorado songs other than this one. 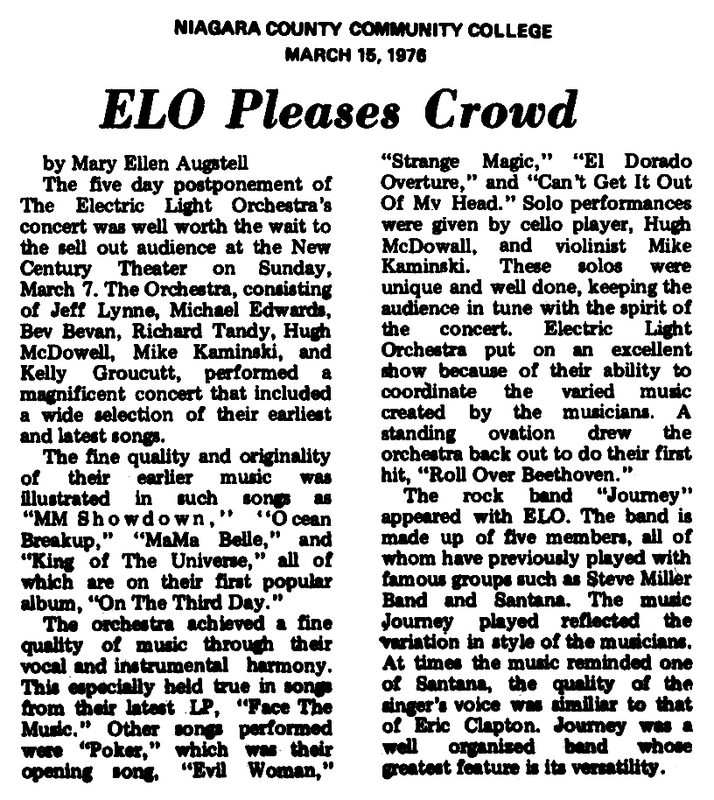 "A group of pieces from ELO's fourth album turned out to be the best of their latter day songs, Eldorado, Can't Get It Out Of My Head, Illusions, Poor Boy, and The Eldorado Overture [sic] were all done well." "The Eldorado Overture and Can't Get It Out of My Head are masterpieces on record with their intricate cuts and violin passages. 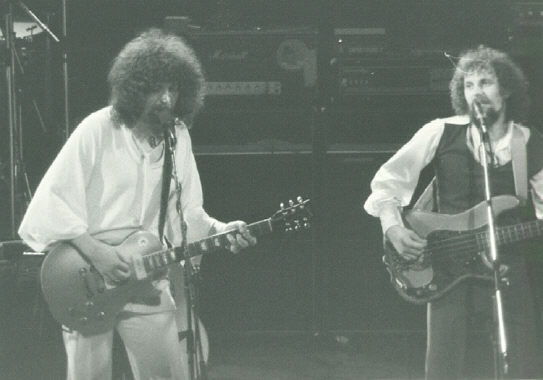 The live versions, while equally satisfying to the ear, were at the same time fun to watch due to ELO's added stage antics." "Only the U.S.A. shows [on the Face The Music tour] included Eldorado [and] Eldorado Finale... 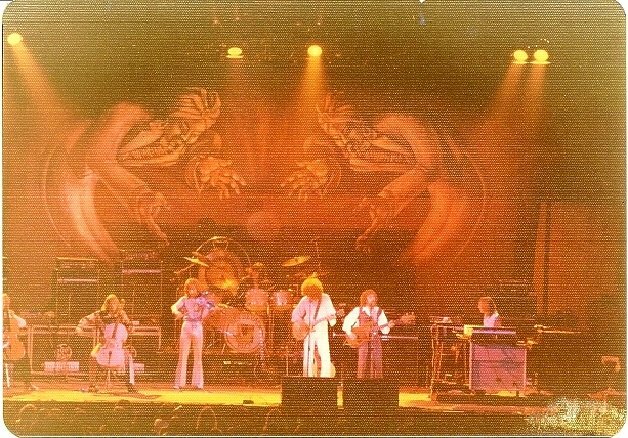 In 1976 pre-recorded backing tapes were used for the first time to support the group, providing the intro's of Fire On High, Roll Over Beethoven and the prologue of Eldorado Overture." "This suite [of Eldorado songs] starts off rather poorly, mostly because of Lynne's lousy guitar playing on the Overture [sic] section. He sounds like he was trying to brush his teeth with a 5-piece patio set." The Live At Winterland '76 labels this song as Eldorado Suite (Including Can't Get It Out Of My Head), which runs [13:14] and includes several Eldorado songs other than this one. "Songs like Can't Get It Out Of My Head and Poor Boy drive American audiences strictly bananas. Not to mention the quaintly titled Illusions In G Major, with is a hard nosed flat-out rocker, the sort Jerry Lee would like." 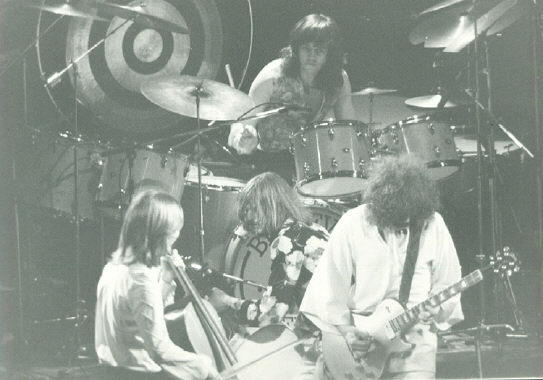 "The orchestra returned for the more rock oriented should and singing of Showdown, then another glorious amplified build-up of strings and sound ushering in I Can't Get You Out Of My Head [sic], with its rather straight forward melody cushioned in a full orchestral sound, occasionally let loose with intriguing sonic frills and turns." "Things really improve when they move into Can't Get It Out of My Head which is really nicely done." "[Jeff Lynne and I] used to share the lead [vocals in concert] on things like Poor Boy." "Illusions in G Major sounds great and is quite energetic." "Their performance of Eldorado is also nicely done..."
"Only the U.S.A. shows [on the Face The Music tour] included Eldorado [and] Eldorado Finale..."
"The man with the toughest job on stage is violinist Mik Kaminski. Two thirds of the way into the set, the band walk off and leave him to do his solo. Deja vu lives. Haven't they just done that with the cello guy, who went down a storm? They have, and Mik has to follow it, with the violin no way as much a rock novelty as the cello. [...] His solo consists of a whole bunch of wild improvisations, with a lot of radical sounds, every bit as intriguing as the cello spot. He rounds it off with a numble rendition of Brahms' Hungarian Dances, and when the ovation begins to fade for that, he skips into Orange Blossom Special and dances a hoe-down round the stage. Never seems to fail." 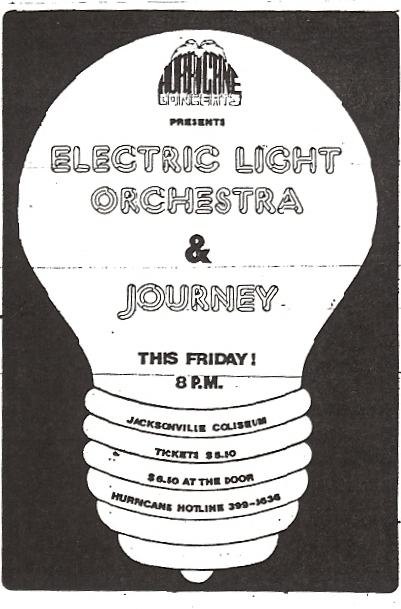 "Mike Kaminski [sic], ELO's amazing violinist took the center stage next with an unbelievable performance which included the Hungarian Concerto #5, The Flight Of The Bumble Bee [sic], and ended in a country hoedown." Editor's Note: It is believed that the reviewer is confused here, contributing Hugh's cello solo performance of Flight Of The Bumblebee as Mik's violin solo. 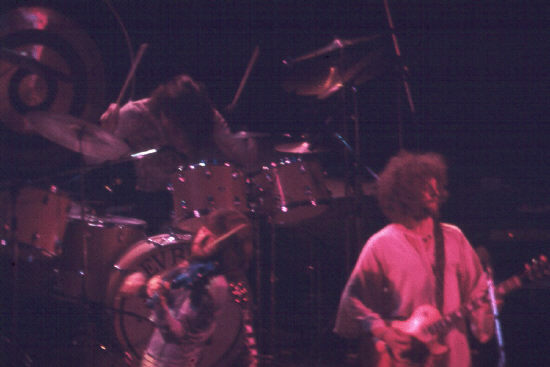 "Occasionally, a spotlight would catch violinist Mike Kaminsky [sic] at a bad angle and temporarily blind him. Undaunted, he closed his eyes and beautifully weaved a solo of everything from various violin classics to a knee-slapping square-dance jig, much to the crowd's delight." "Then it was the violinist's turn. Stalking the strings with excitement, with green light flashing on instrument and twirling mirrored ball, the music went from hungarian dance to a hoedown, with the musician running around in a circle playing madly, like some fiddler on the roof." 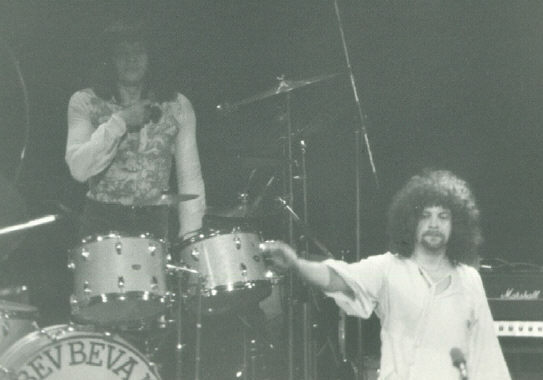 In this live performance, Bev Bevan stepped out from behind the drums to stand in the front of the stage playing tambourine and singing backup/harmony vocals. 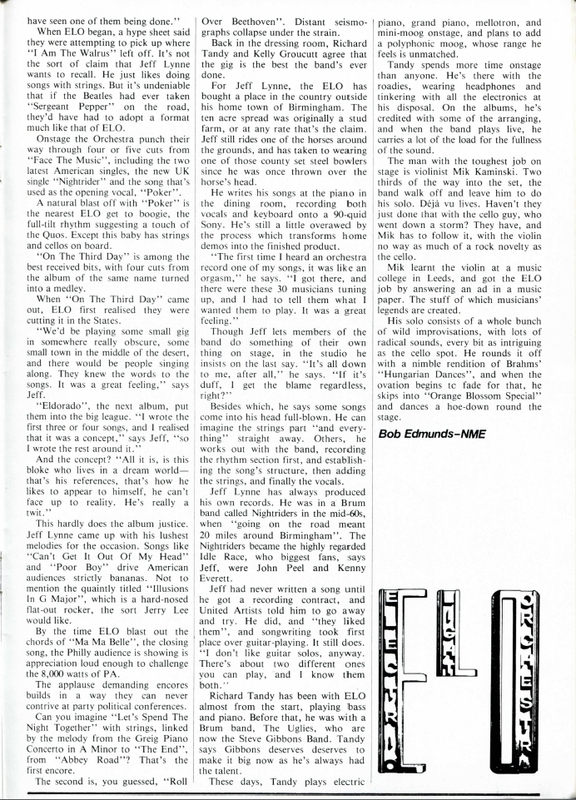 "[ELO's] more sensuously pop side showed up in new songs like the light Strange Magic or the latest hit, Evil Woman." 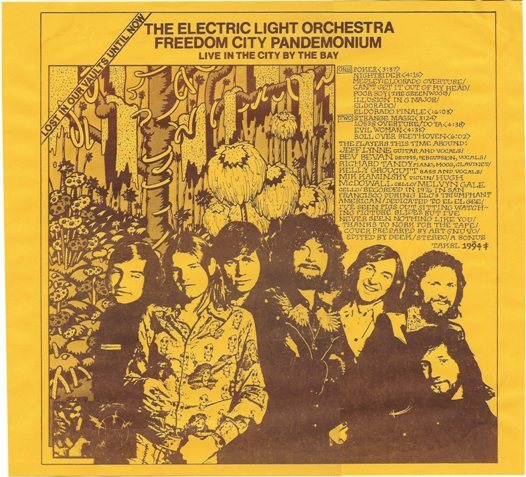 "They follow the suite [of Eldorado songs] with Strange Magic. Although I've never liked this song and find it quite boring, nevertheless it was performed quite well." 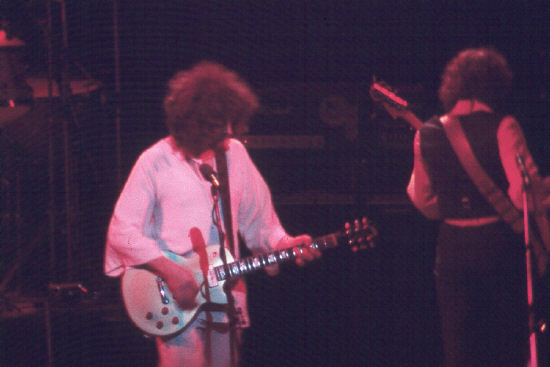 "At a performance on St Valentine�s Day at the Winterland Ballroom, San Francisco, after playing Strange Magic they temporarily stopped the show so they could hand out red roses to the audience." This medley has 10538 Overture from [0:00 to 2:56] and the remainder ([2:56 to 5:27]) as Do Ya. 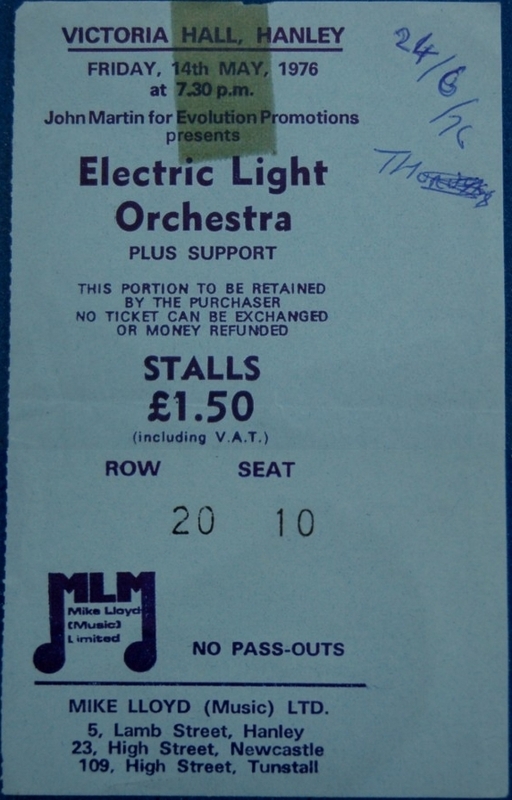 "A selection of songs from On The Third Day and the song 10538 Overture from the first ELO album were excellent. The former was spiced by a string break which climaxed with the addition of Jeff Lynne's guitar bursting in onthe subtler strings." 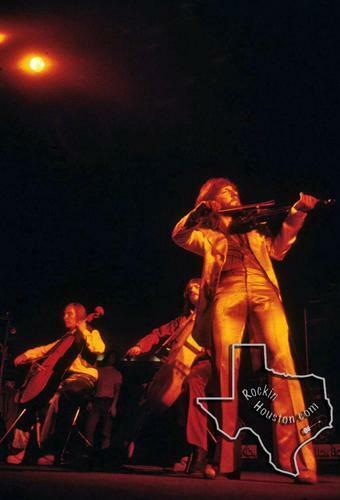 "The tension provided by the classical strings was best displayed in the cello solo on Flight Of The Bumblebee and in pieces like 10538 Overture, from the first ELO album. 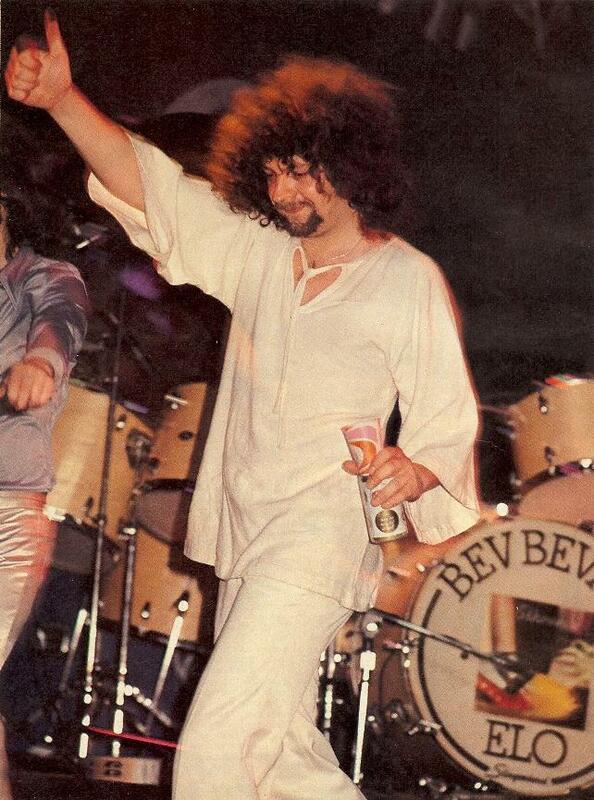 [...] The troupe also paid homage to the Move (the band from which came Bevan and ELO leader Jeff Lynne), a group that was never justly recognized in the States, by serving up tasty versions of Do Ya? [sic]." "The 10538 Overture/Do Ya medley is another fantastic performance." "Enthusiastic receptions were given to the more popular material, such as Evil Woman, although it was not as exciting as their earlier, more complex material." 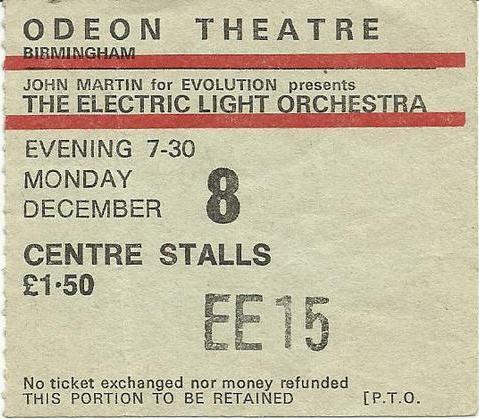 "Showing great restraint during the continued onslaught of badgering shouts for Evil Woman, ELO finally gave in and thrilled the outspoken faction." "...And Ma-Ma-Ma Belle has lots of energy, but sounds like it's being rushed." "The second encore and their tour de force was Chuck Berry's Roll Over Beethoven. 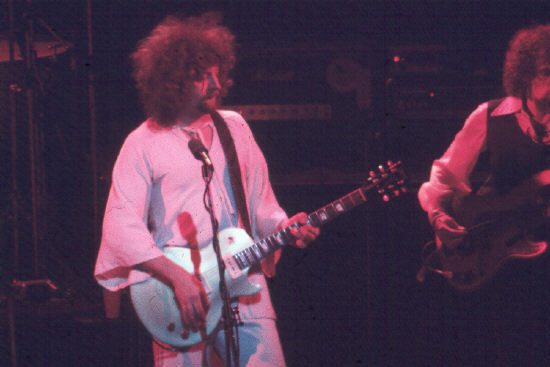 Roll Over [sic] is the consummate ELO song: a perfect fusion of esoteric classical riffs and Lynne's blazing Berry licks. The final number was raw energy and a fitting end to this highly energized performance." 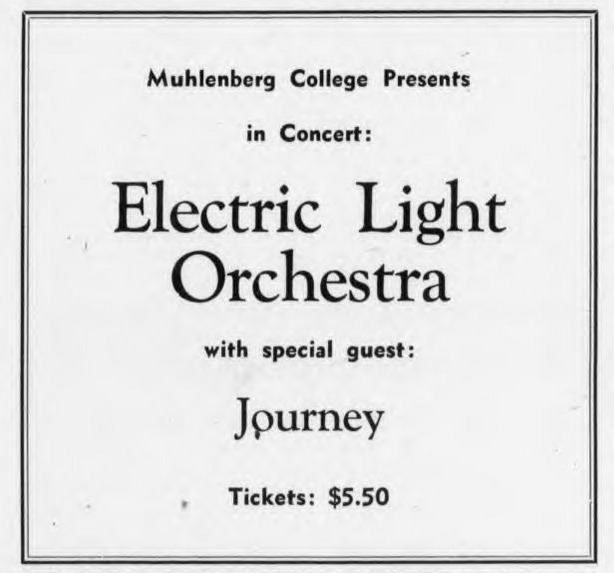 "The high point of the show was yet to come however as the encore proved to be possibly the best performed and exhilierating experience in recent history of Muhlenberg shows. The rumbling thunder of Beethoven's 5th meant only one thing, the ELO theme, the old Chuck Berry tune Rollover Beethoven [sic]. 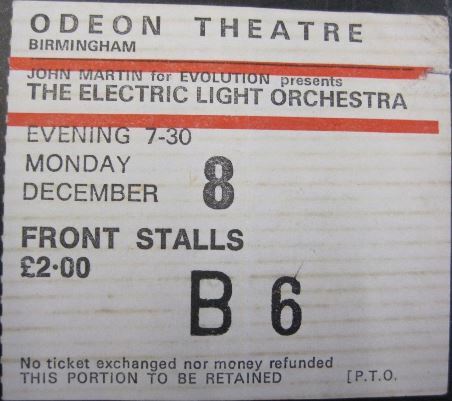 The sight was nothing short of amazing with the whole band going wild on their instruments, and ELO leader Jeff Lynne cracking the first trace of a smile all night. 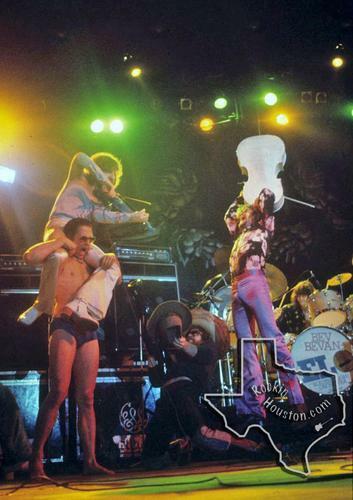 As the long encore ended bassist Kelly Groucutt was dwelling with keyboard player Richard Tandy and the entire string section of two cellos and violin were playing virtually on top of each other. 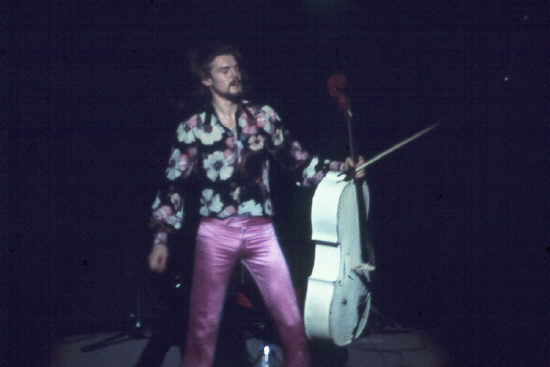 Cellist Hugh McDowall succeeded in outdoing the rest of the band making his cumbersome cello look like a parasol, spinning it on his head and behind his back. 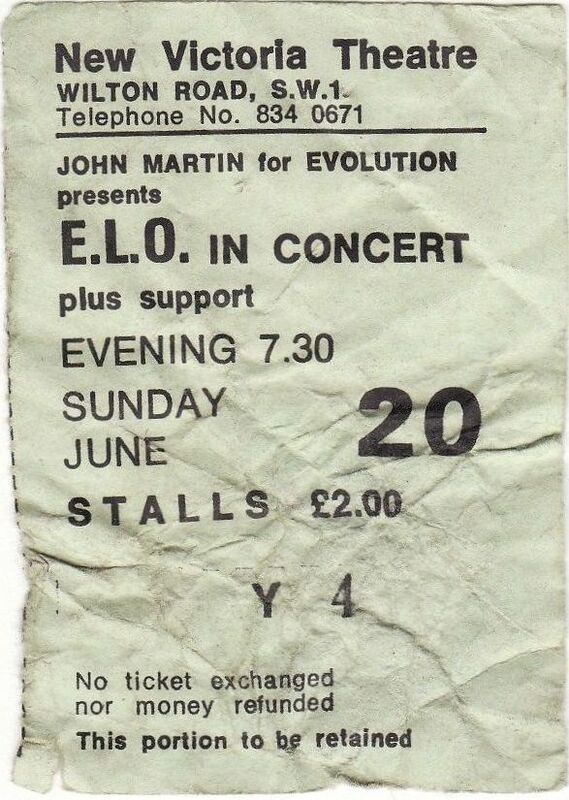 The majority of the crowd was on its feet before they even finished, and ELO left the stage for the last time; obviously anything more would have been anti-climactic." "The encore could not have been more appropriate. 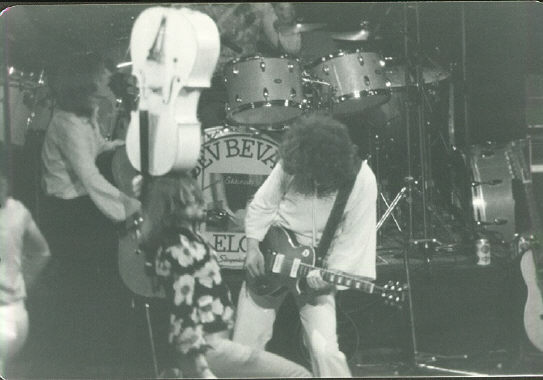 All hell broke loose during Roll Over Beethoven. 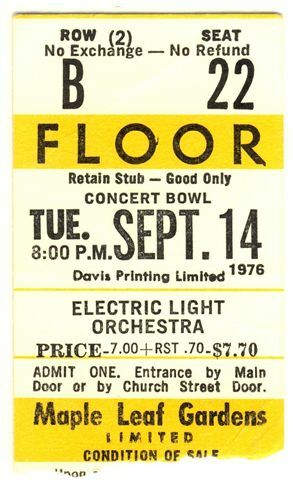 A cascading flood of fans poured onto the floor to get a closer look and to sway in time to the rock and roll beat." 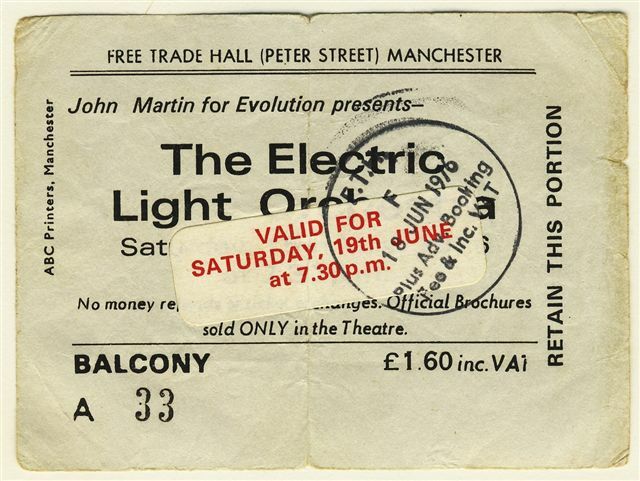 "The ovation was tremendous, with the crowd stomping and calling for 'ELO' and rock. 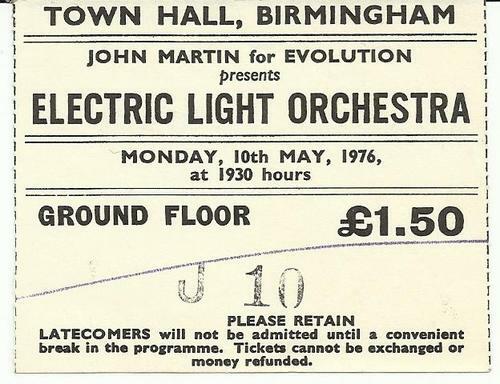 The orchestra returned with the electrified chords of Beethoven's Fifth, a massive dose of green lights dousing the arena, followed byt eh ear-splintering sounds of their famous Roll Over Beethoven with the musicians letting loose all over the stage. The well-planned ending to their performance with exceptionally done, creating one of the finest rock musical moments the auditorium has ever witnessed. If Beethoven could have heard it, he would have probably enjoyed it too." "On Roll Over Beethoven [in concert] we used to do verse and verse about; someone does a verse and gets a rest on the next one." "They wind up the show with Roll Over Beethoven. 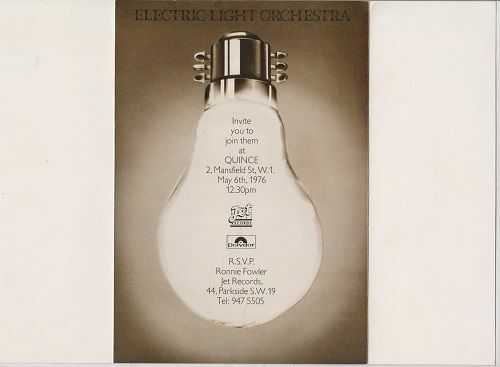 This piece has the usual energy that ELO has been known to give it, but the mix on this is poor ending this CD on a low note." 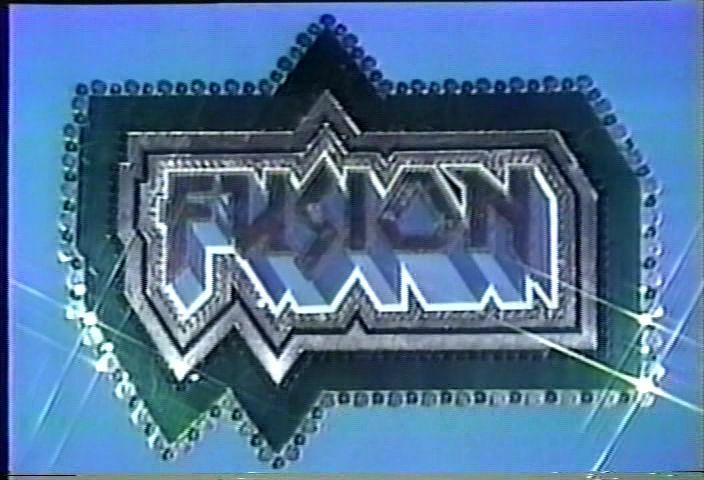 "[Fire On High] was followed up with the electrifying Poker which is where the [Fusion] video starts. Lots of noise and jiggling around in our seats-- London audiences are renowned for being reserved, anyway. [Mike] Mansfied hardly varies his camera shots, showing (for him anyway) an admirable sense of restraint. How many camera men can you spot? Poker veers into Nightrider..."
Some overdubbing of this performance is obvious thanks to the performance of Poker. During the line "the dream in every player's heart," Jeff Lynne obviously forgets or flubs the line and barely sings into the microphone, however his voice is still very clearly heard. He must realize at the time that he misses the line because he sort of laughs about it afterwards and looks at Kelly Groucutt, who is off camera singing harmony vocals. 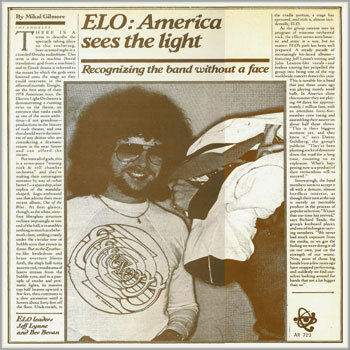 "Poker veers into Nightrider, and it should be obvious to everyone the difference between ELO live in 1976 and 1978. 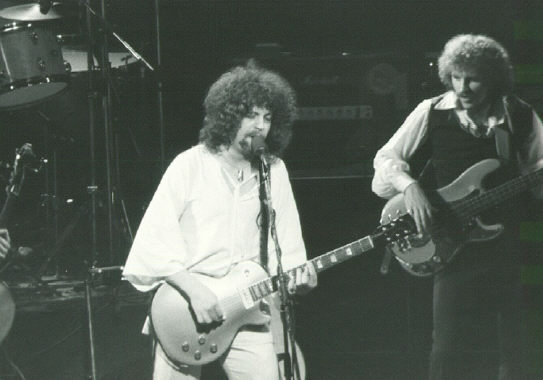 ELO worked a lot harder on their sound in those days (i.e. no tapes! ), Mr. Tandy in particular. Certainly, with his Mellotron providing a more than passable approximation of the choir in addition to his regular vocal duties, he had no time for nose scratching liek that in the 1978 vid!" 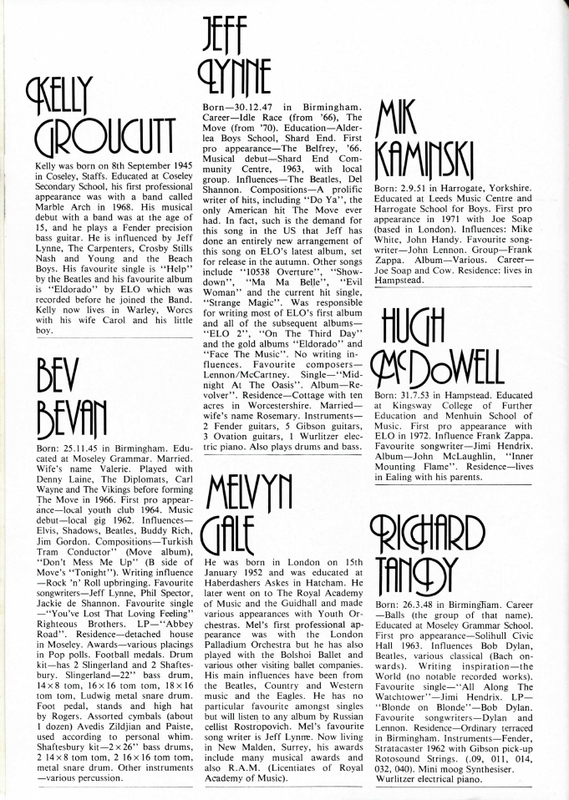 "Nod of appreciation to the furious, string-driven things at the climax of Poor Boy [sic], before my fave rave..."
"Illusions [sic] gets the crowd going..."
"Bev intro's the 'soft, subtle and romantic part of the evening' (do me a favour!! ), and for those who didn't know, he can lay down a pretty heavy (head?) backing vocal, as Strange Magic testifies." "Back then, I could never understand the words to 10538 Overture, and Kelly's saying 'Sing along with it!' The nutters did punch the air and jump about a bit, which I found strange. The break into Do Ya was the reason, and by acknowledging it showed you were 'a true fan'. Wow!" 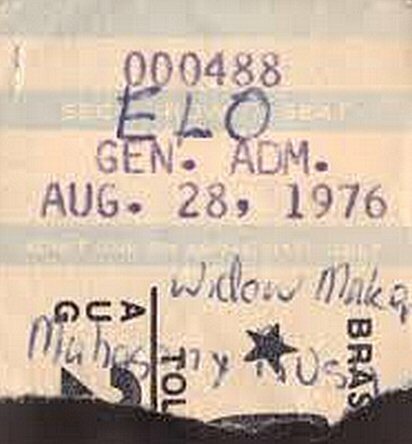 "I was saving myself for the 'hit', and so were a lot of the crowd-- Evil Woman-- ELO's biggie. Most were 'getting down'. I even tapped a foot and sang-- ha, I knew the words to this one! 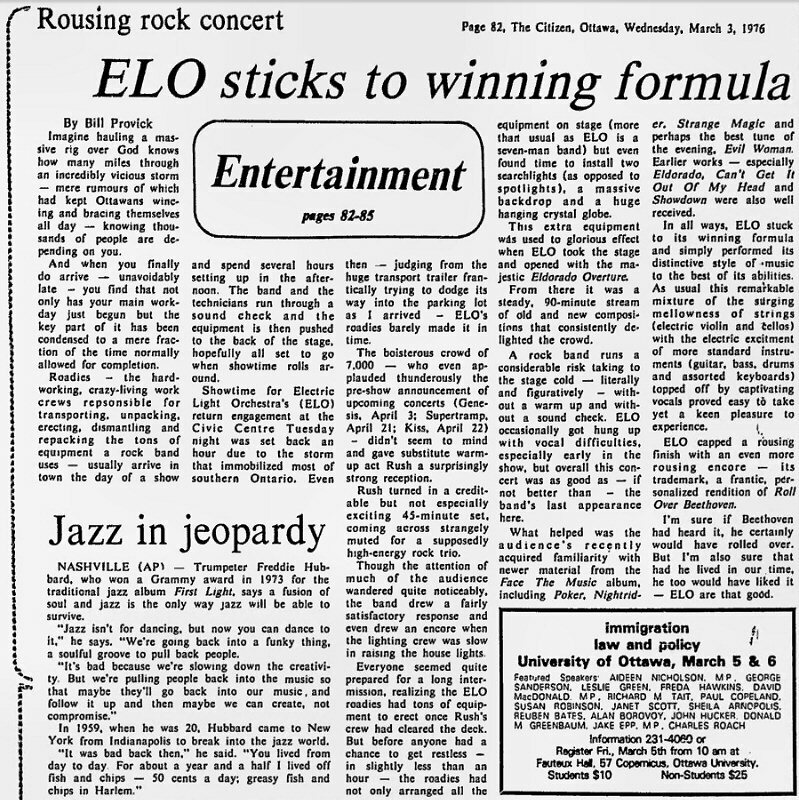 The 'true fans'-- the nutters-- didn't seem to like it though, and there was a bit of a backlash at the time to ELO 'selling out to disco'." "There followed a mass outbreak of clapping for Ma-Ma-Ma Belle, a great song, and also features an acrobatic cameraman, just how did he get that shot?" "A brief hint of a laser (I think they sneaked one in), then the one we're all screaming for, Roll Over Beethoven. I checked to see if it was 'cool' to stand-- it was-- and then it was pandemonium on stage-- not only instruments getting thrashed, but musicians as well. More 'meltdown' than 'fusion'-- witness the human punchbag-- sorry, bass player. Bear in mind that Hugh sharpens his cello spike with a file pre-gig, so as to stab the stage and any wayward bass players that get in the way! Any danger money probably went on stage repairs... Beethoven [sic] trundles on-- Mel does his one man band bit, playing cymbals, piano, cello and Kelly's leg! Poor sod, I thought-- sat on, stabbed, kneed, dragged across stage, and still expected to sing in tune! With Jeff winding up the song, it's all over... bar the shouting (and review!)." This song is released on the 1999 Live At The BBC album under the title of Medley - On The Third Day which includes all tracks from the On The Third Day suite. Ocean Breakup / King Of The Universe is tracked on this song from [0:00 to 5:45]. This song is released on the 1999 Live At The BBC album under the title of Medley - On The Third Day which includes all tracks from the On The Third Day suite. It runs from [6:35 to 10:35] on the track. This song is released on the 1999 Live At The BBC album under the title of Medley - On The Third Day which includes all tracks from the On The Third Day suite. It is a version of New World Rising / Ocean Breakup Reprise missing the vocal portions from [11:10 to 12:43]. 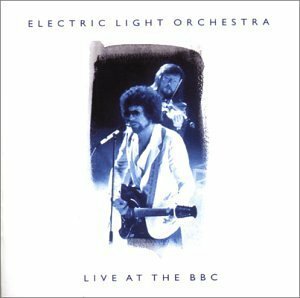 The remainder of the track as tracked on the Live At The BBC CD is Jeff Lynne speaking to the audience and introducing the next song (Showdown). "Hugh's solo theme was Flight Of The Bumblebee by Nicolai Rimsky-Korsakoff in which Kelly joined in on bass." "Violinist Mik Kaminsky [sic] and cellist Hugh McDowall [sic] both stunned the audience during their solos by drawing an amazing array of unusual sounds and effects out of their amplified instruments." 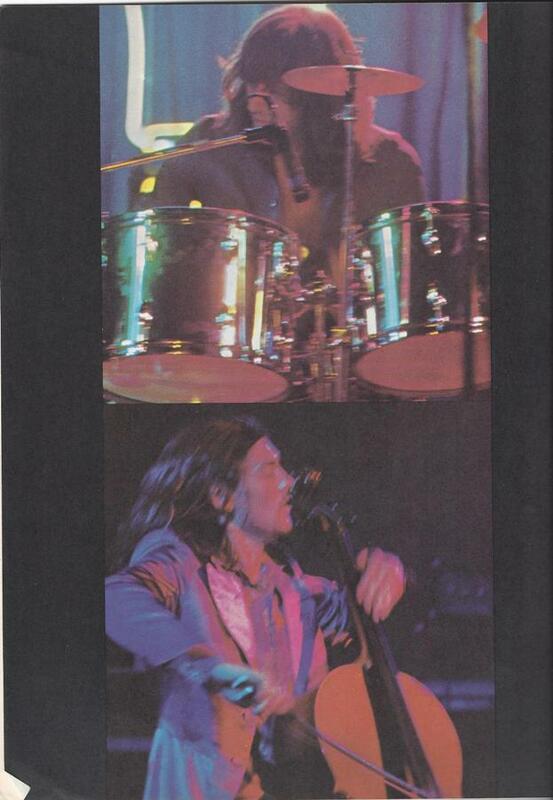 "After the fourth number, the band turned the stage over to cellist Hugh McDowell who performed an amazing solo which incorporated a variety of musical styles and electronic gimmicks. Adding a visual component to the solo was an emerald green laser beam which danced off McDowell's sequined suit and projected patterns onto the stage backdrop." 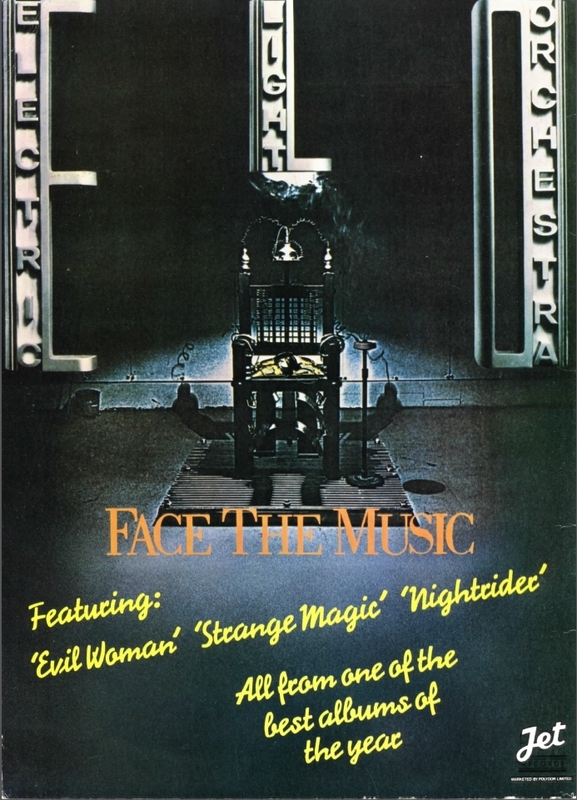 "The group performed many of the cuts from its Ole ELO greatest hits collection on United Artists including Evil Woman, Strange Magic and the current single Showdown." The E.L.O. Live at the BBC CD incorrectly lists this song title as Eldorado and merges it with Can't Get It Out Of My Head as one track. The E.L.O. Live at the BBC CD incorrectly lists this song title as Eldorado and merges it with Eldorado Overture as one track. "Further, Lynnes' melodies were imaginative and moving, particularly in the slower songs such as Kuiama and Can't Get It Out Of My Head." 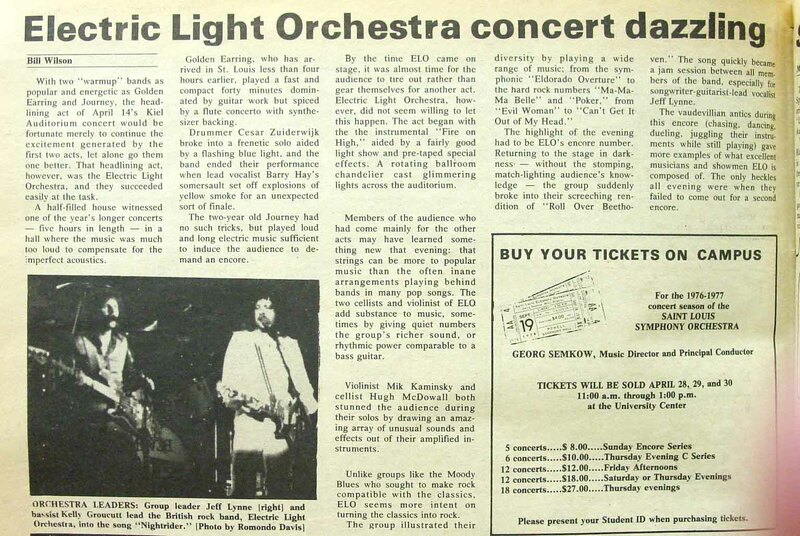 "Violinist Mick Kaminsky [sic] also performed a laser-enhanced solo several songs later which was well-received." 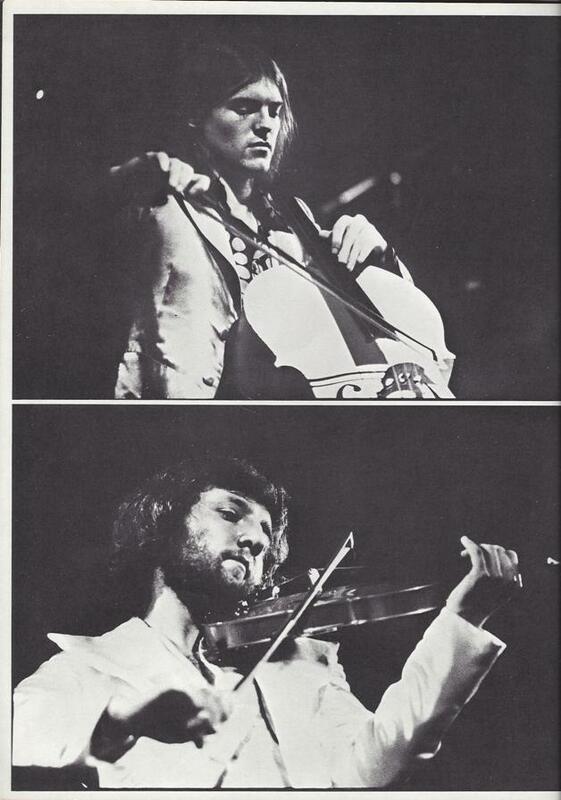 "Mik's new solo theme [on the Face The Music tour] was Hungarian Dance No. 5 by Johannes Brahms with drums and bass joining in. On other occasions he played Orange Blossom Special by E.T. Rousse and sometimes a violin version of his solo of In The Hall Of The Mountain King by Edvard Grieg." "The [1999 Live At The BBC] CD manages to leave off three tracks from those originally broadcast by the BBC - Ma Ma Ma Belle (from Golders Green Hippodrome) and 10538 Overture / Do Ya (from Portsmouth)." Editor's Note: Roll Over Beethoven, Hugh McDowell's cello solo and Mik Kaminski's violin solo were also left off this CD. "The group encored, as expected, with its frenetic version of Roll Over Beethoven. Adding to the impact of the song was a 30-foot-high hot air balloon which caught everyone by surprise when it rose from behind the stage. 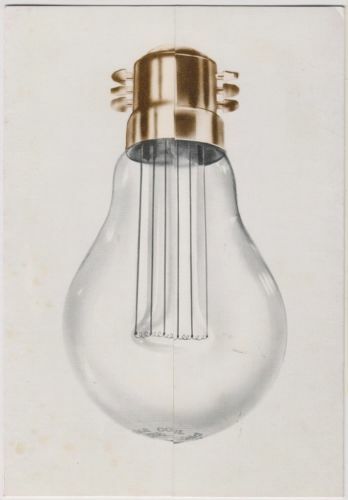 A laser, aimed at the mirrors that dangled from the bottom of the balloon, showered the audience with scores of reflected beams which turned the raucous closing number into a celebration." 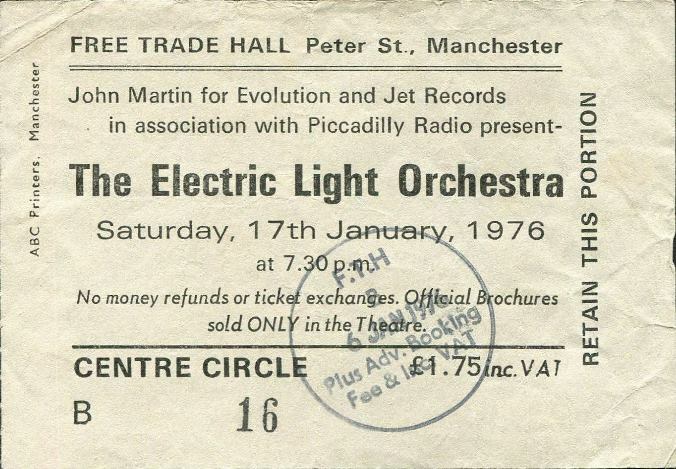 "The highlight of the evening had to be ELO's encore number. Returning to the stage in darkness-- without the stomping, match-lighting audience's knowledge-- the group suddenly broke into their screeching rendition of Roll Over Beethoven. 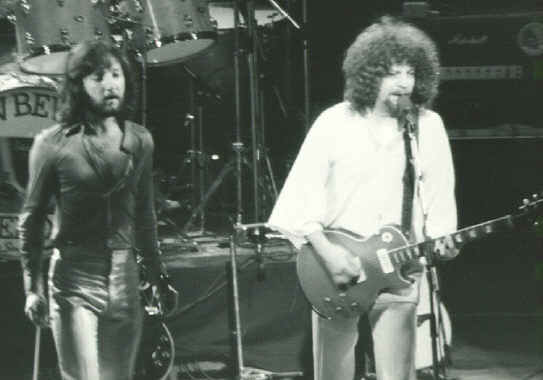 The song quickly became a jam session between all members of the band, especially for songwriter-guitarist-lead vocalist Jeff Lynne. 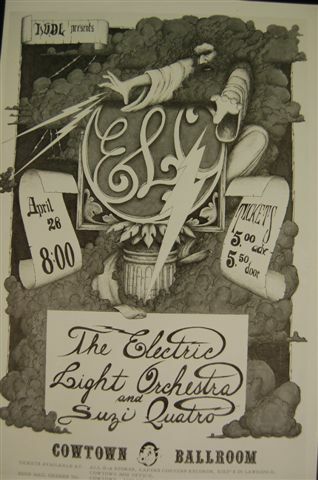 The vaudevillian antics during this encore (chasing, dancing, dueling, juggling their instruments while still playing) gave more examples of what excellent musicians and showmen ELO is composed of. The only heckles all evening were when they failed to come out for a second encore." This song is known only to have been played live. No known studio recording exists. It is an interesting mixture of several songs. First is a cover of the Rolling Stones Let's Spend The Night Together with cellos playing the main rift, then the instrumental break is Edvard Grieg's Piano Concerto No. 1, followed by more of Let's Spend The Night Together, then finally a cover of The Beatles' The End is played. 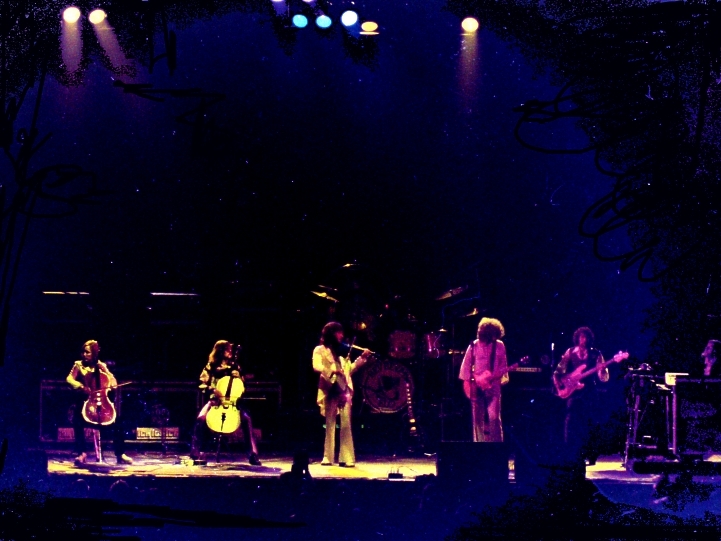 "The main set of ELO was powerful but the encores were overwhelming. The first consisted of a rendition of the Rolling Stones' Let's Spend The Night Together and the Beatles' The End. The latter's soft serenity brought a deafening silence from the audience." "The applause demanding encores builds in a way they can never contrive at party political conferences. Can you imagine Let's Spend The Night Together with strings, linked by the melody from Grieg Piano Concerto In A Minor to The End from Abbey Road? That's the first encore." "Only the U.S.A. shows included [...] Let's Spend The Night Together / Piano Concerto No. 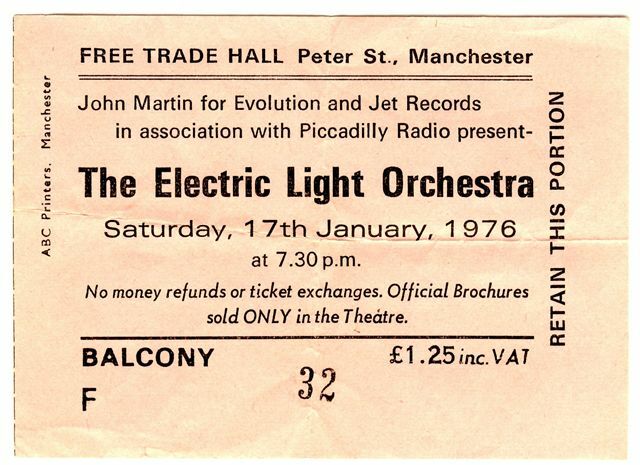 1 / The End as first encore, which was a capital mixture of The Rolling Stones, Edvard Grieg and The Beatles." 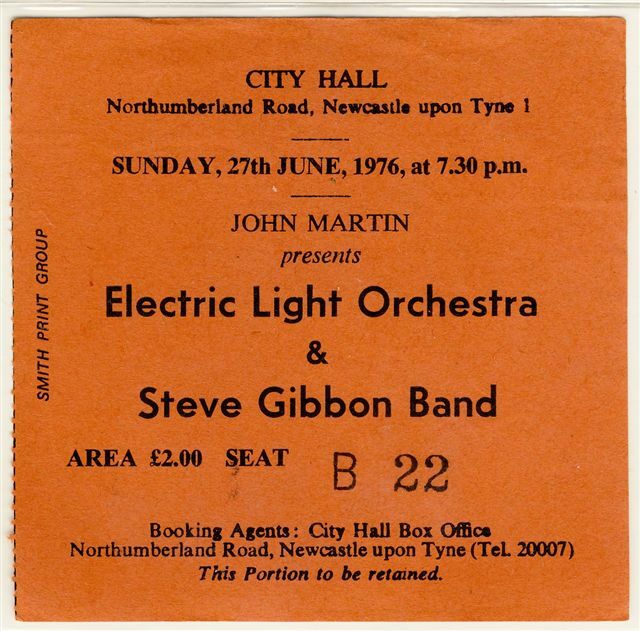 "In another interesting fusion of classic rock and genuine classical music, at some shows they featured a segue of The Rolling Stones� Let�s Spend The Night Together, Grieg�s Piano Concerto in A Minor, and, to finish, a section from The Beatles� The End from Abbey Road." This song is known only to have been played live. No known studio recording exists. 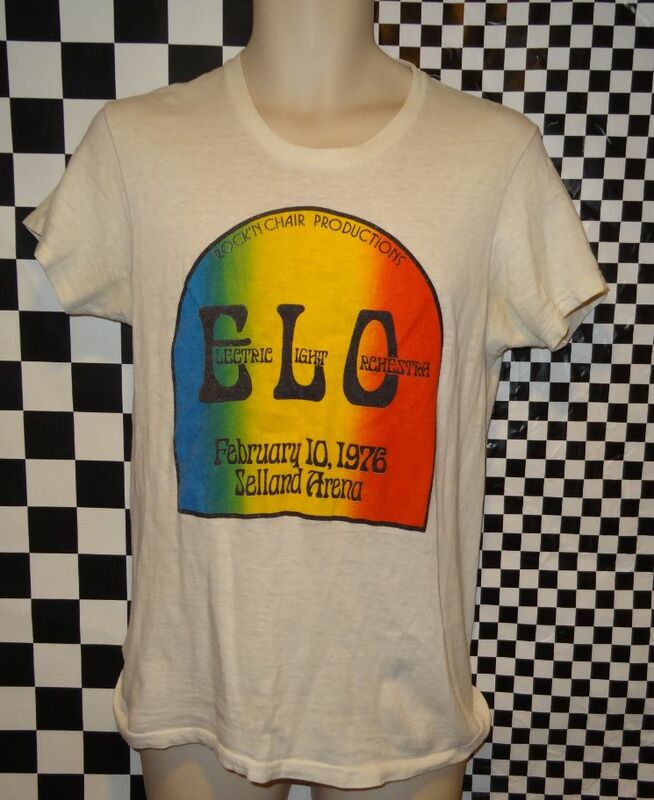 "During their first British concerts of that tour in 1975 E.L.O. 's string players Mik, Hugh and Melvyn performed [the usual intro to Roll Over Beethoven, Beethoven's Fifth Symphony,] as intro [...] live for the last time. 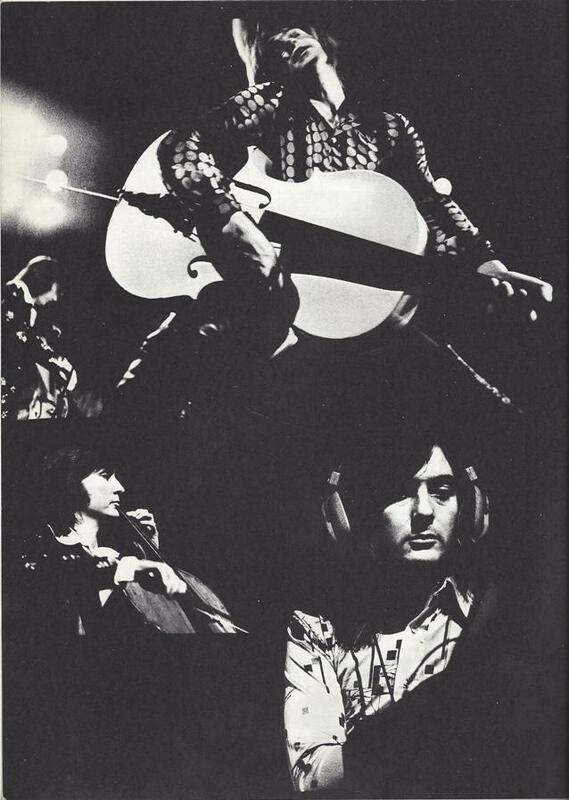 They added another Beethoven track, Moonlight Sonata (First Movement), before Chuck Berry's guitar intro started and during the long instrumental part of it Melvyn Gale lay down his cello and and hammered with the string bow on Bev's cymbals. Then he sat down at the grand piano and played back to back with Richard, who sat at the electric piano." 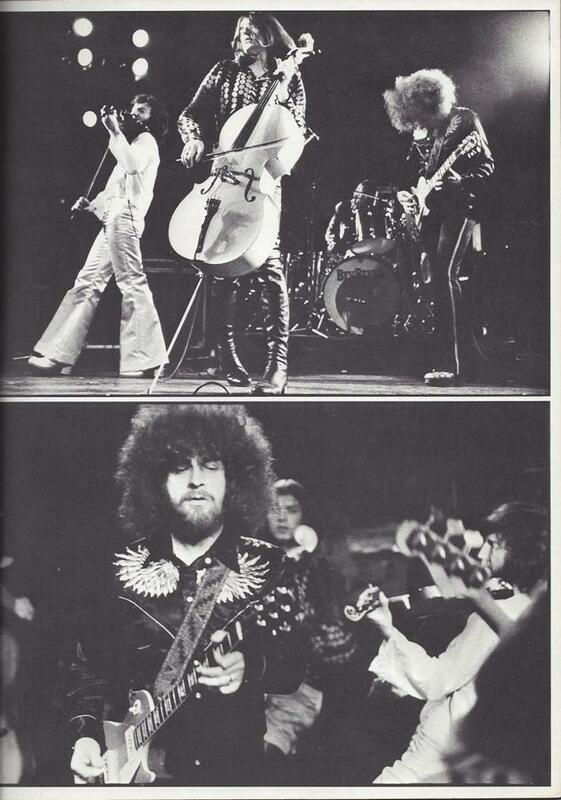 This page is intended to be a complete record of information on the Electric Light Orchestra Face The Music tour. If you notice any errors or omissions (which there are many), please contact me at jefflynnesongs@gmail.com and let me know. I strive for accuracy.